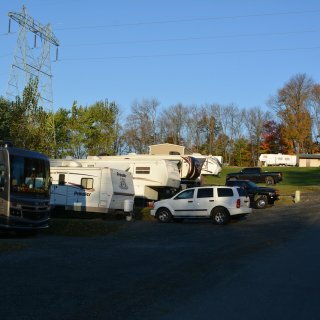 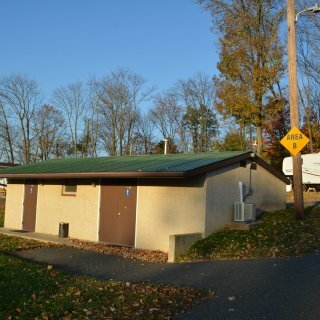 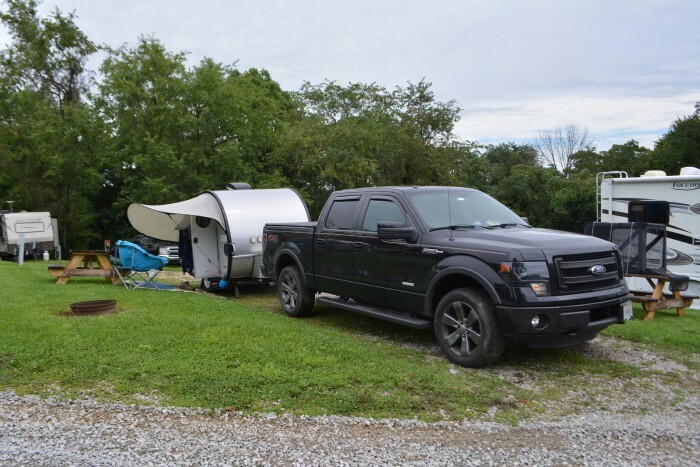 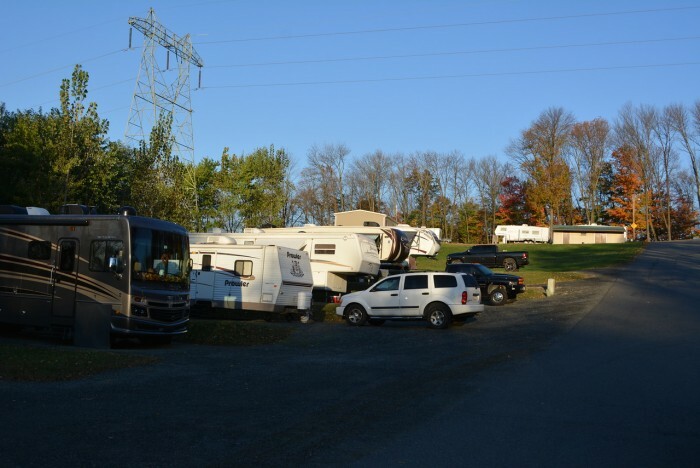 It is an expensive campground for what you get, but it is very convenient to the Hershey attractions. 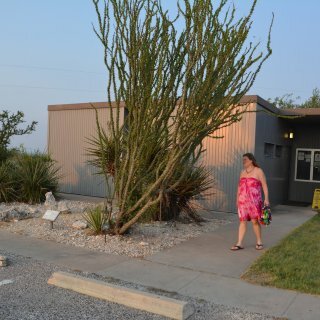 Reservations require a two night stay but we only needed one night so we simply pulled in. 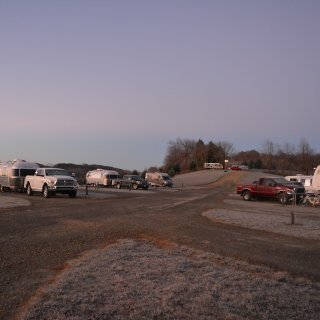 There was snow on the ground, roads were cleared, but no sites had been cleared, so I had to shovel my site out. 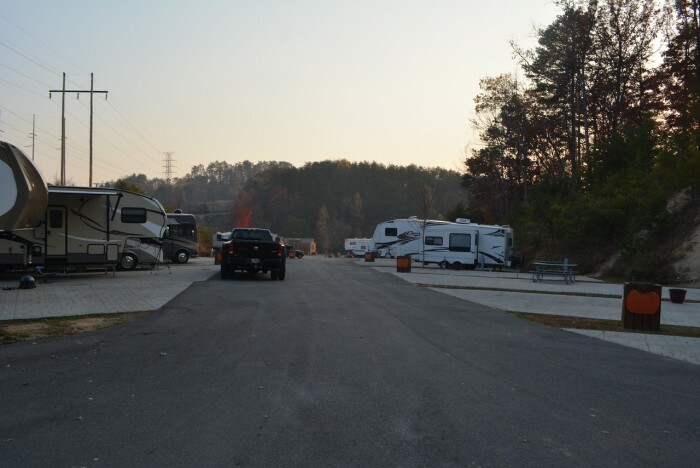 Pull through sites are short and close together, with utilities at the end of the site. 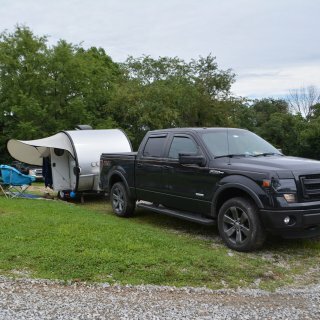 Fine for our small trailer, but some would have trouble. 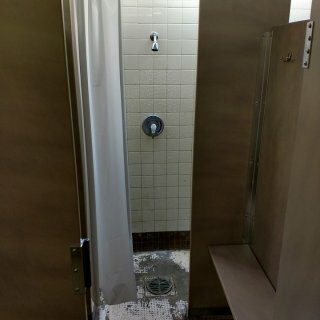 All utilities worked as expected. 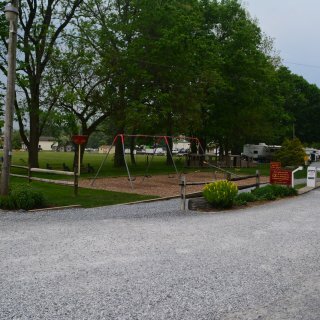 Site was gravel and level. 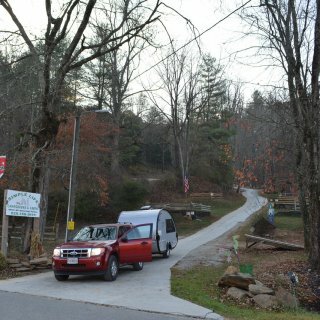 Roads were good and easy to navigate. 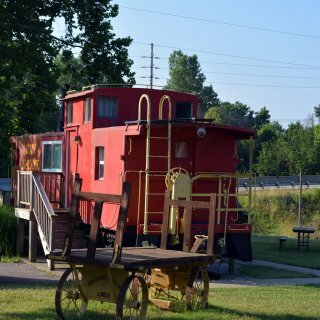 There is a very busy rail line next to and above the park, but except for the train horn blasts, the area we were in was shielded from most of the train noise. 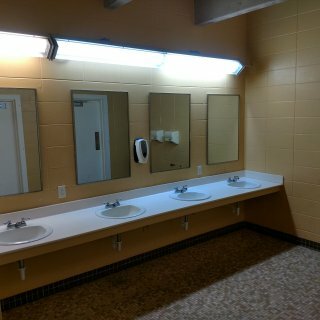 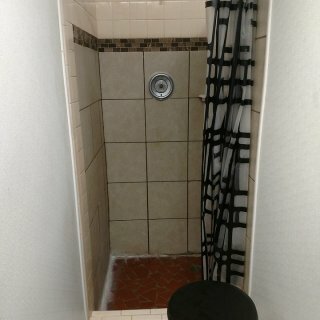 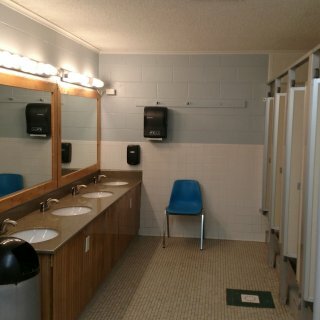 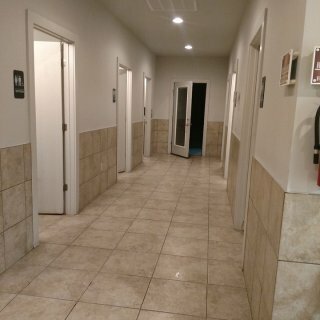 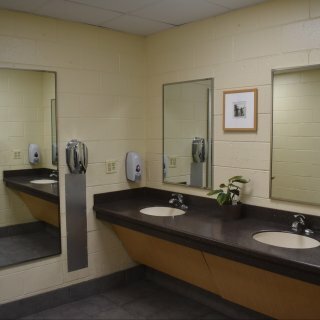 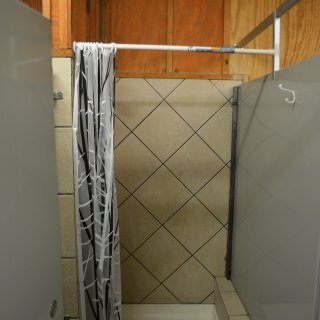 Shower house was clean and well appointed. 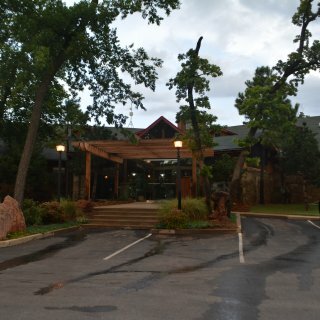 Only interacted with staff on check-in, and they were friendly. 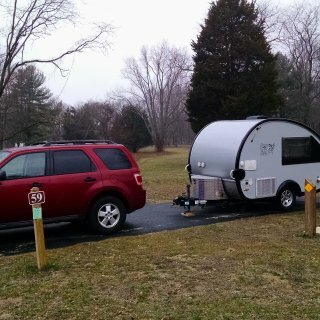 There were few amenities available at the campground this time of year. 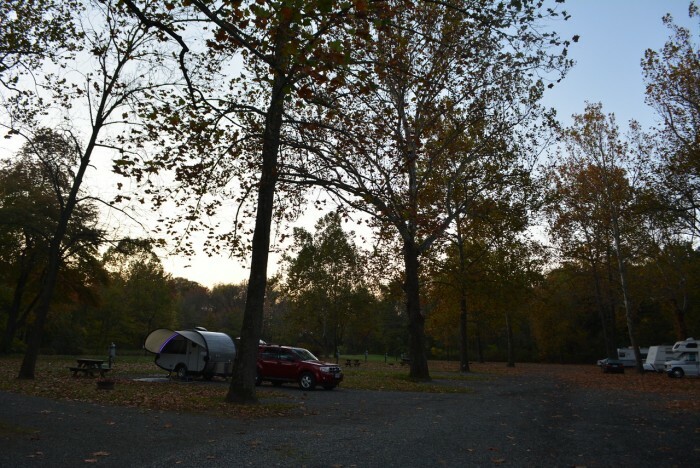 We camped at Hersheypark Camping Resort in a Travel Trailer. 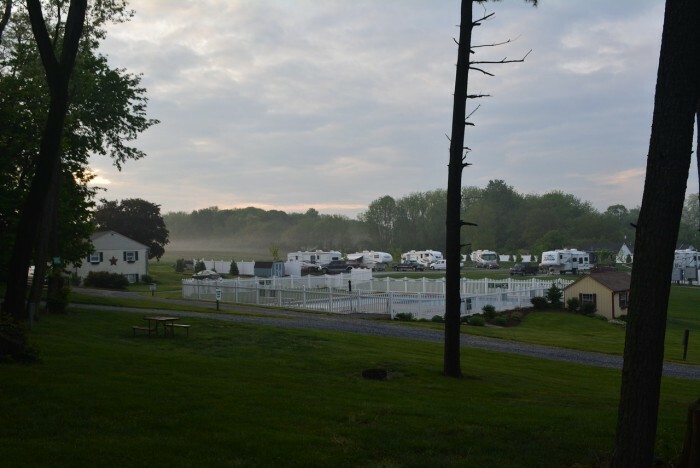 Plenty to see and do in Hershey. 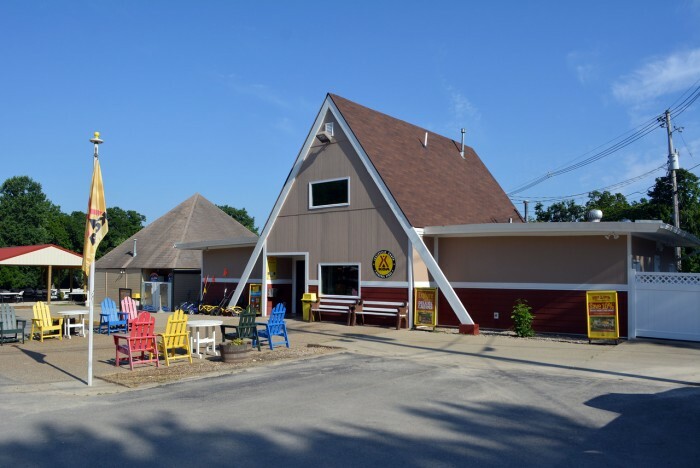 Troeg's Brewery just down the road has top notch food and beers. 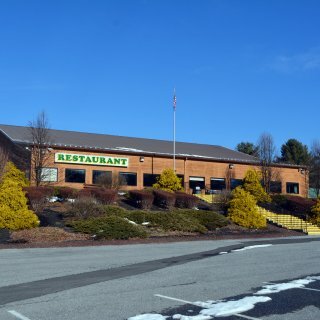 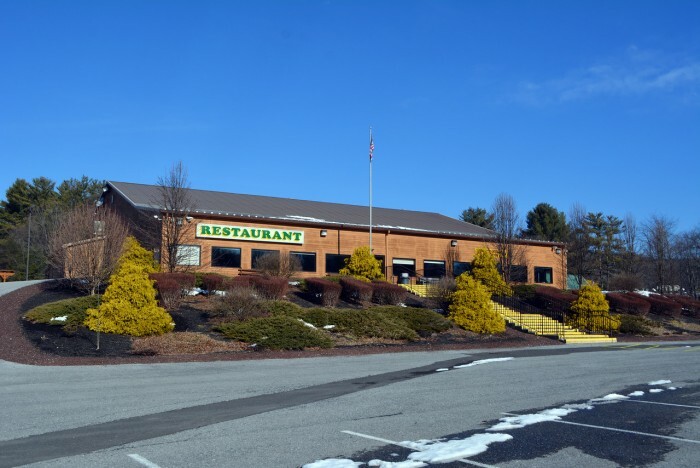 In nearby Palmyra Funck's is an excellent local restaurant. 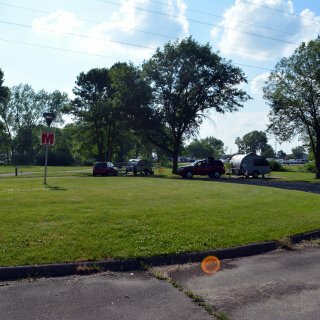 Otherwise it is a nice campground, it is next to a highway, but it is not a busy highway at night and there are a lot of trees between the highway and the campground, so noise was minimal. 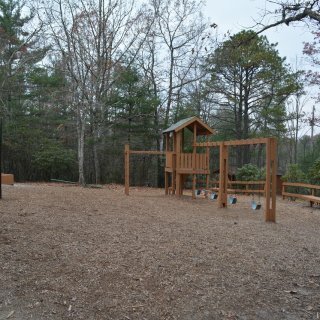 The site was level gravel with a patio, and all utilities worked well. 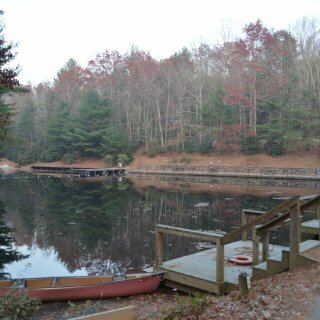 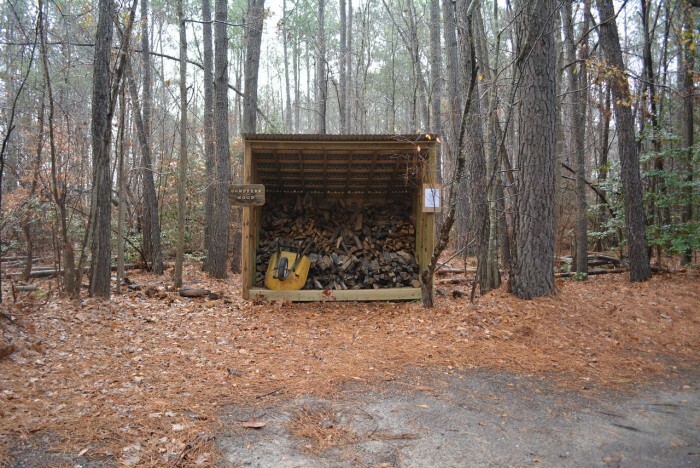 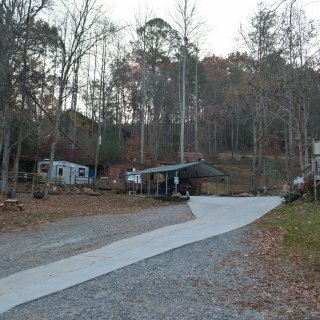 They have nice long pull throughs in the open as well as a nice wooded section, and cabins sprinkled throughout. 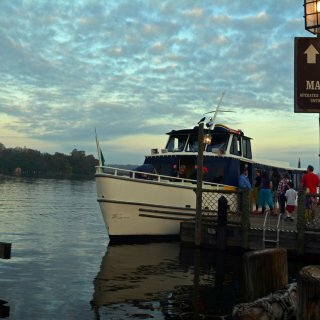 It is an easy trip many area attractions, and they run a shuttle in season. 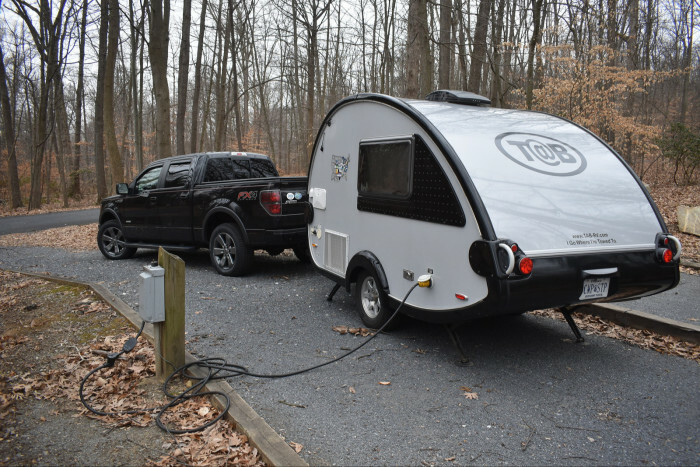 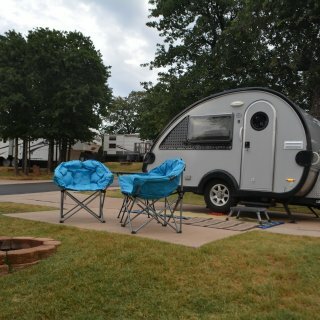 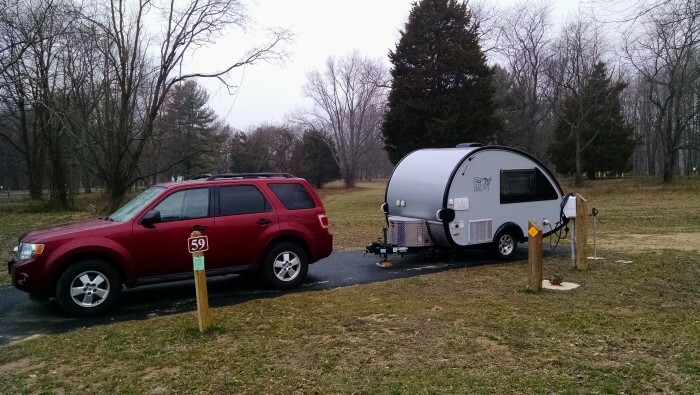 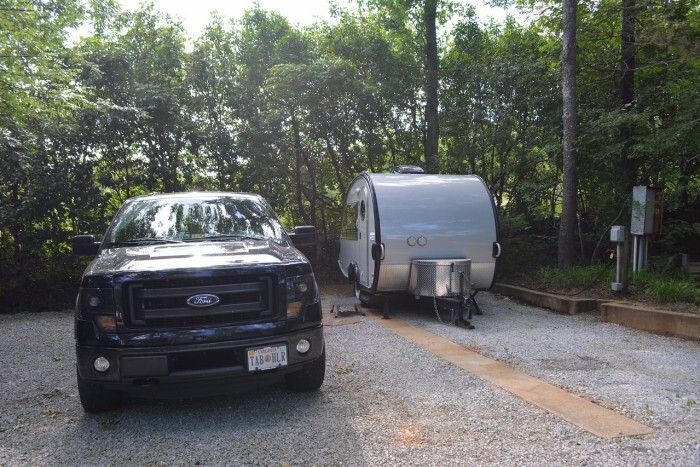 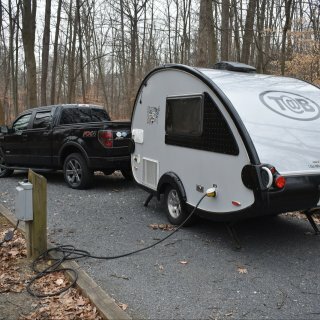 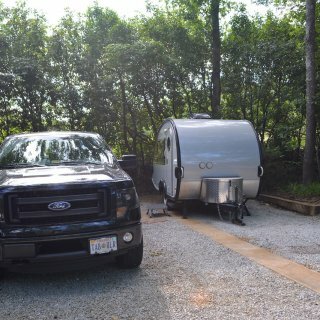 We camped at Washington DC / Capitol KOA in a Travel Trailer. 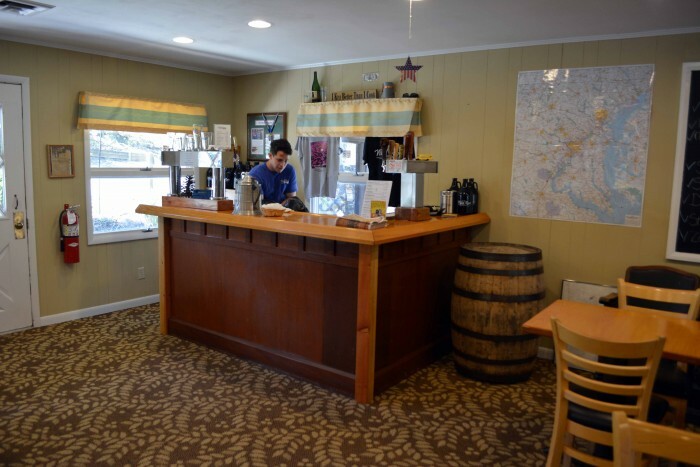 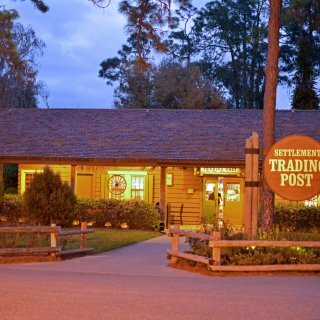 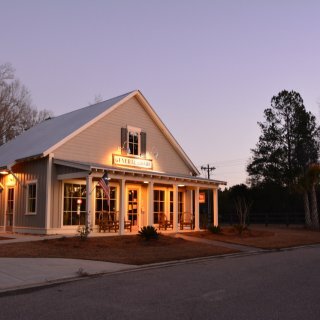 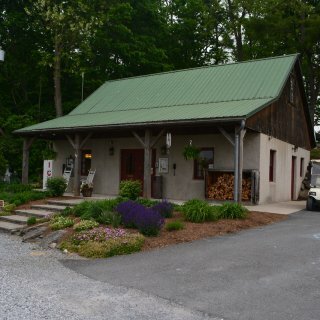 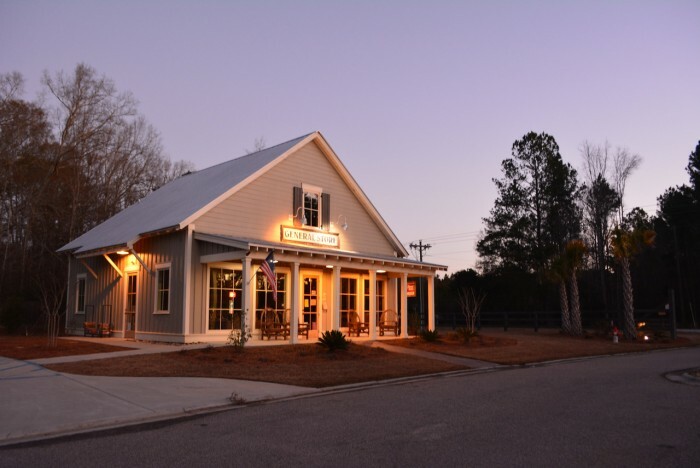 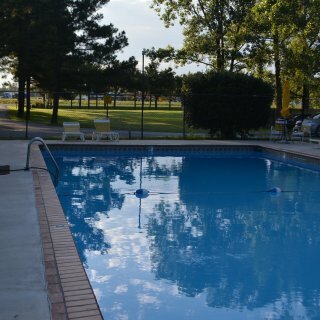 We stay here several times a year while visiting the Williamsburg area, though it has been a while since I have done a review. 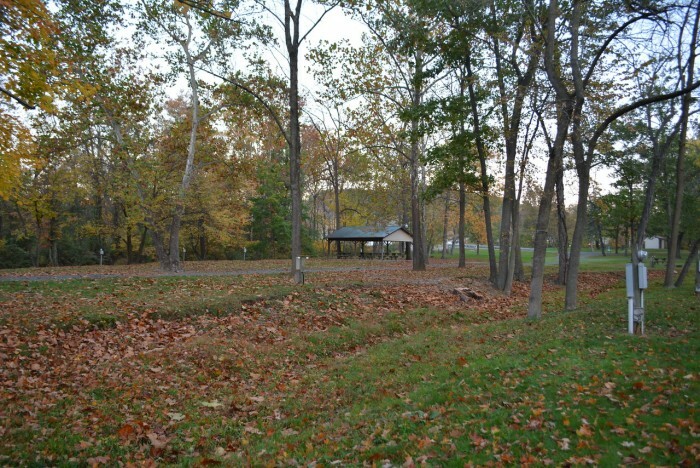 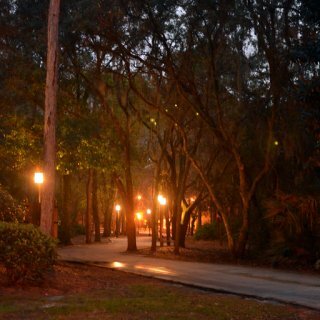 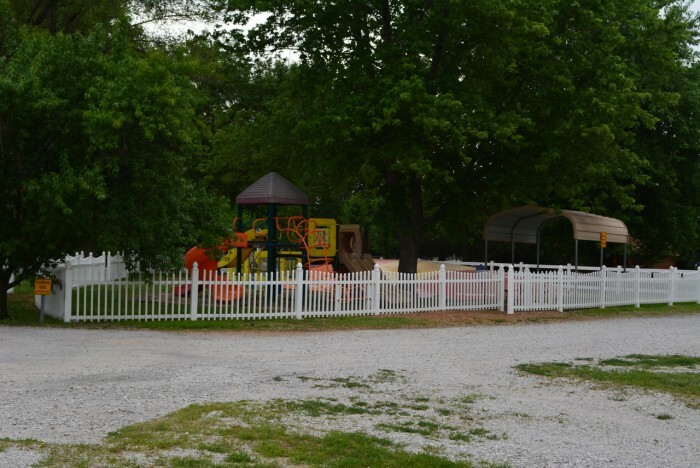 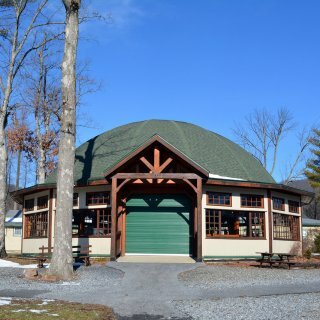 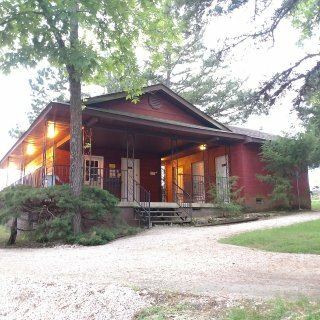 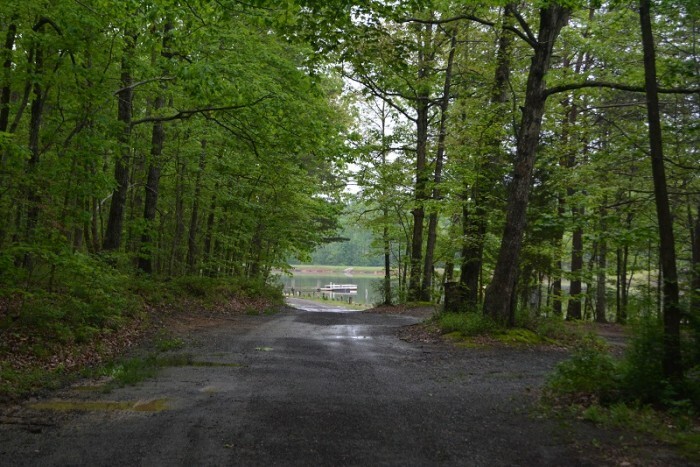 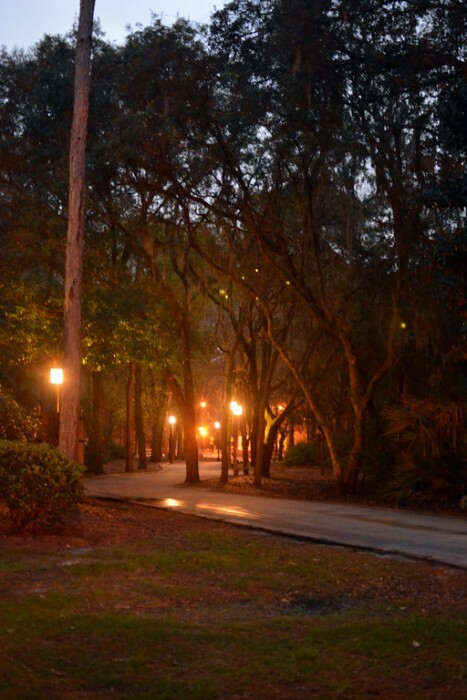 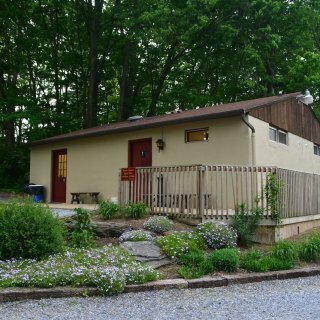 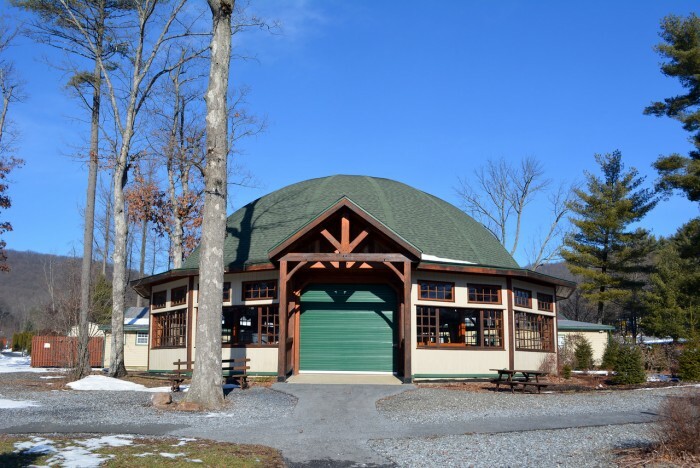 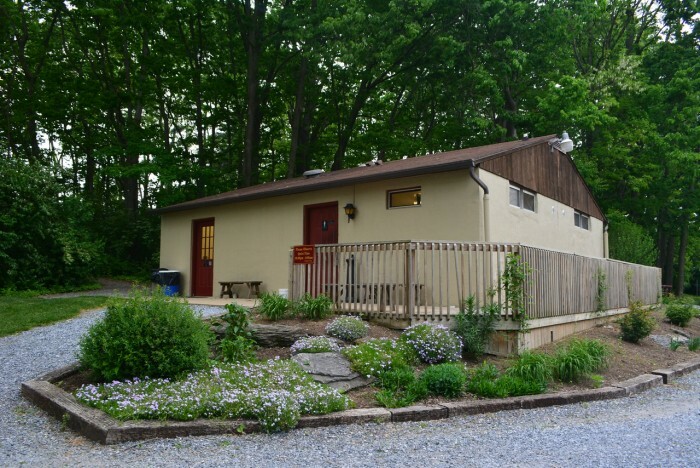 The campground is in a quiet corner of the retreat center, and open to the public. 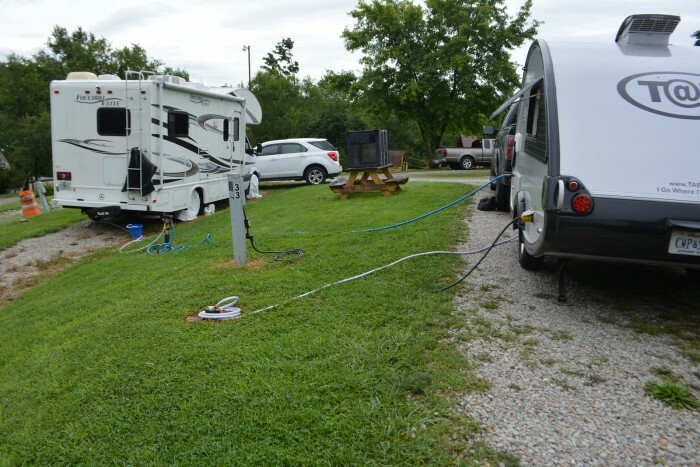 It is a single wooded loop with all back-in sites, all FHU, though just one is 50amp. 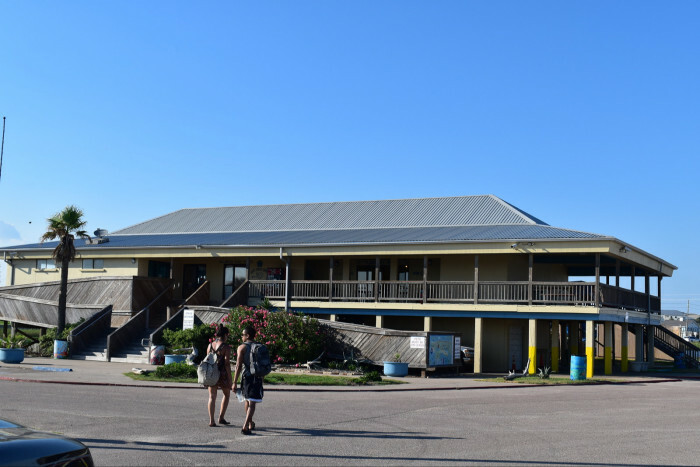 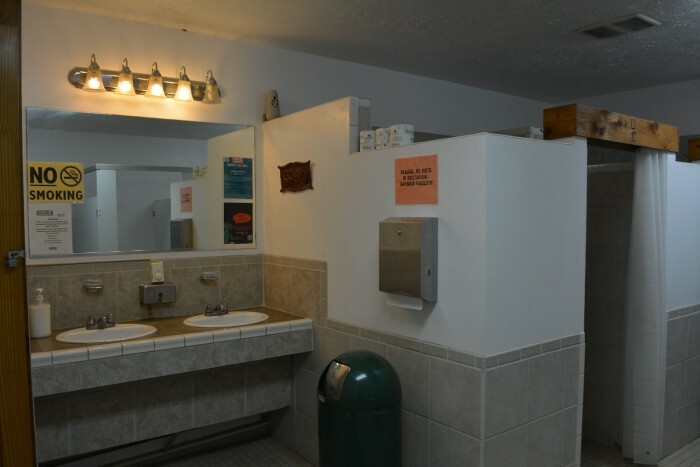 The bath house is located in the center of the loop, and while dated, it is kept fairly clean. 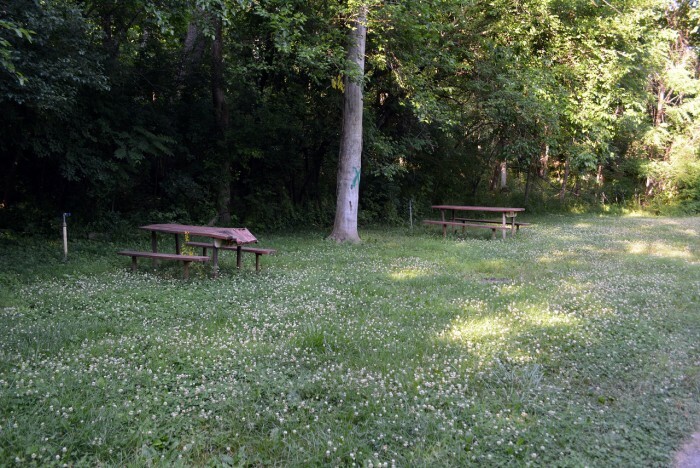 There is also a picnic pavilion in the center of the loop. 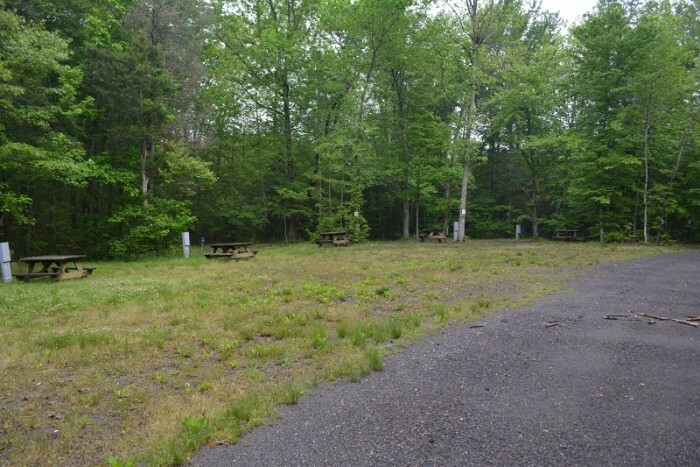 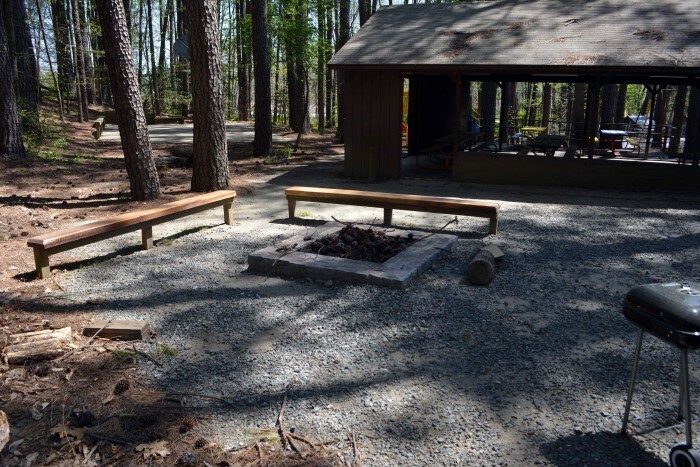 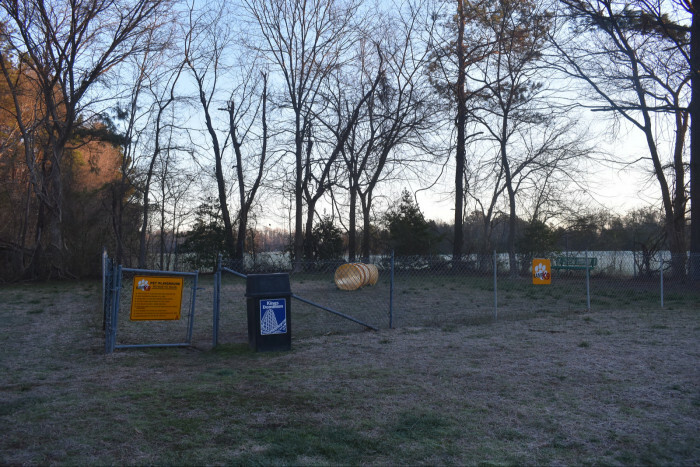 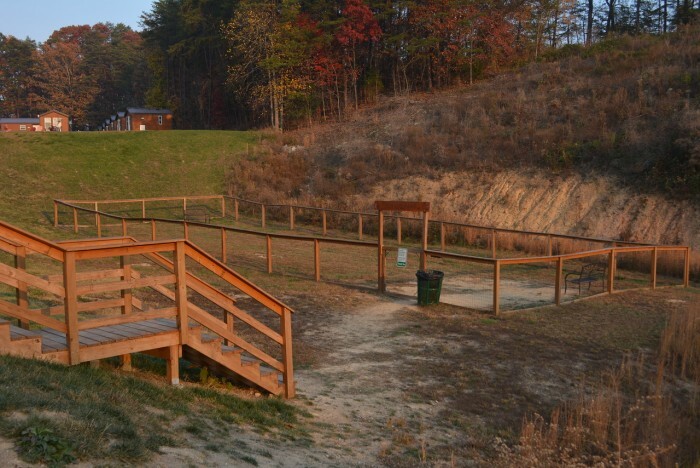 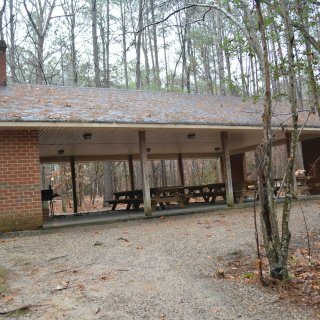 Sites are all sand with some gravel, fairly level, and have picnic tables and a fire pit. 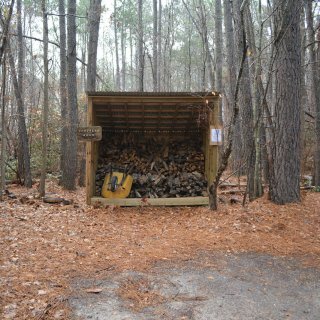 On this visit I noticed that every site had been stocked with wood. 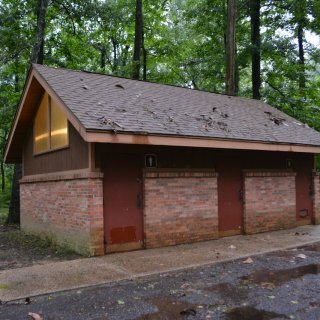 The sites do get wet in heavy rain. 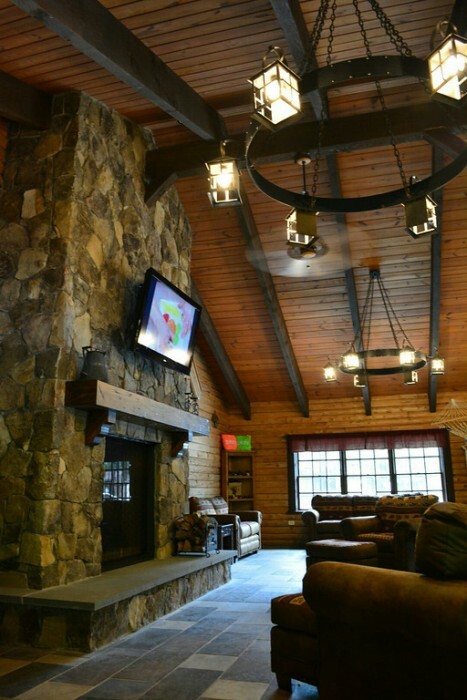 Hookups are in good working order and wifi is excellent. 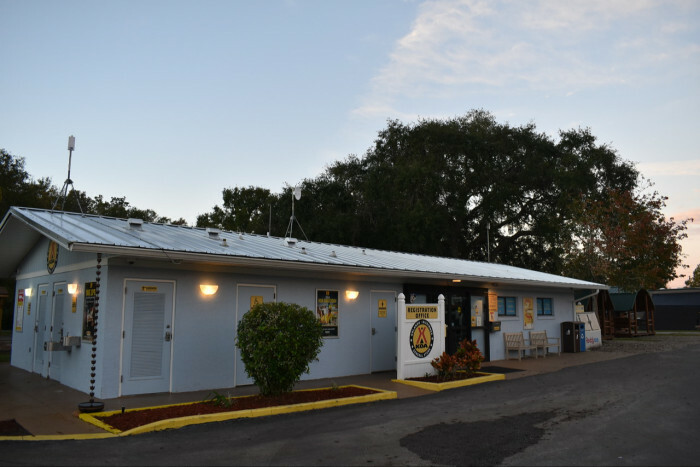 The staff is exceptionally friendly and helpful. 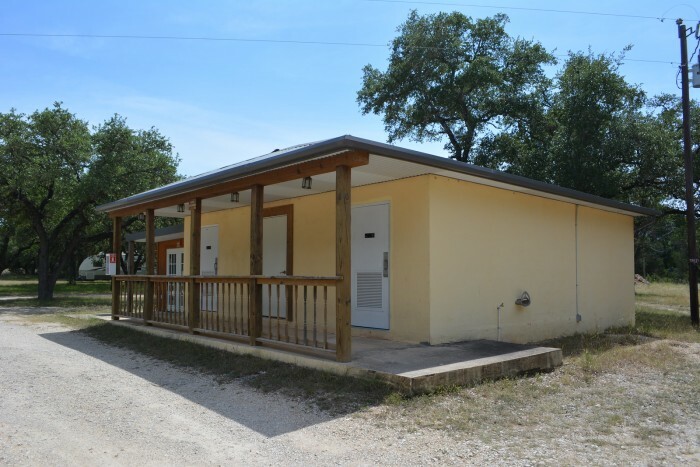 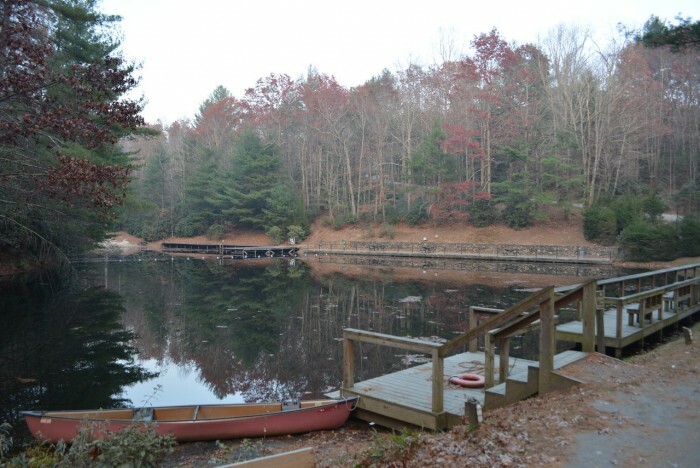 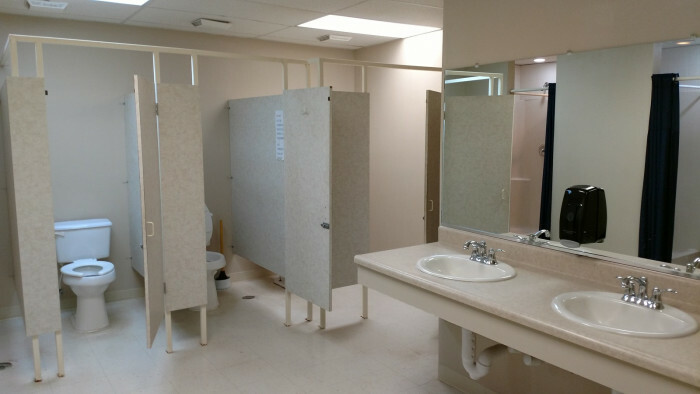 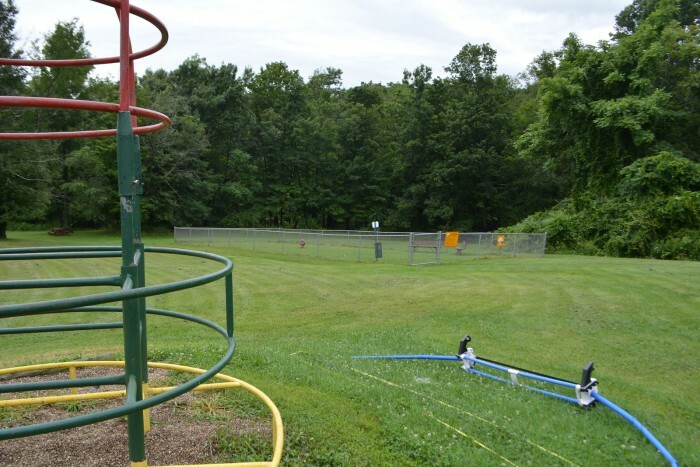 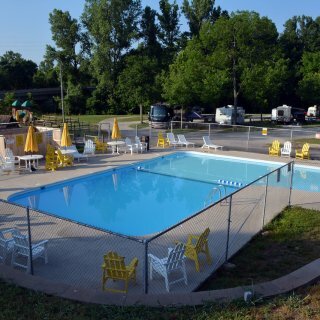 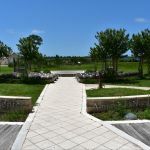 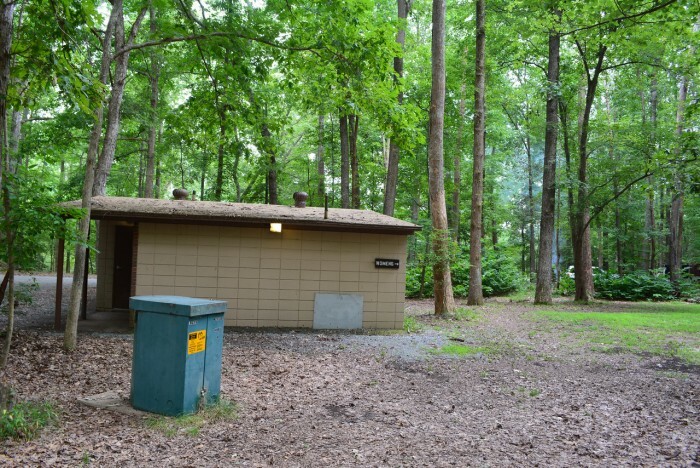 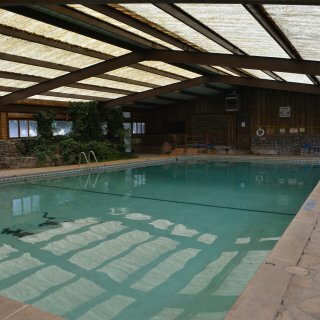 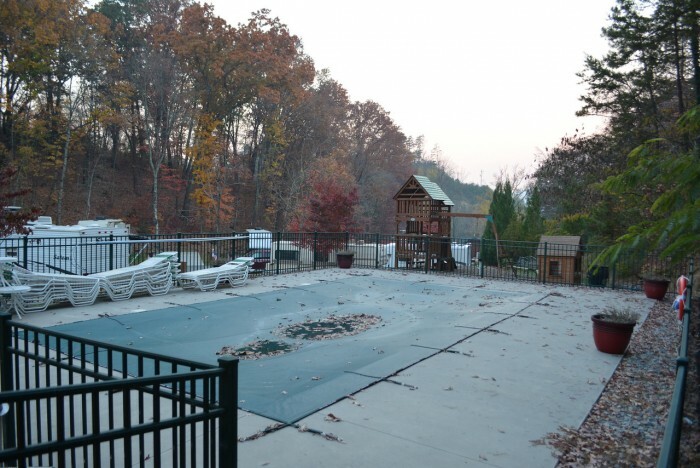 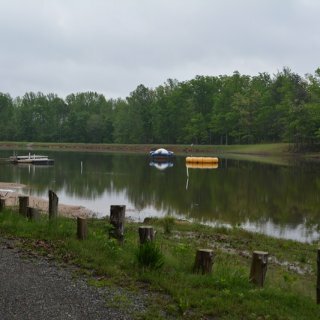 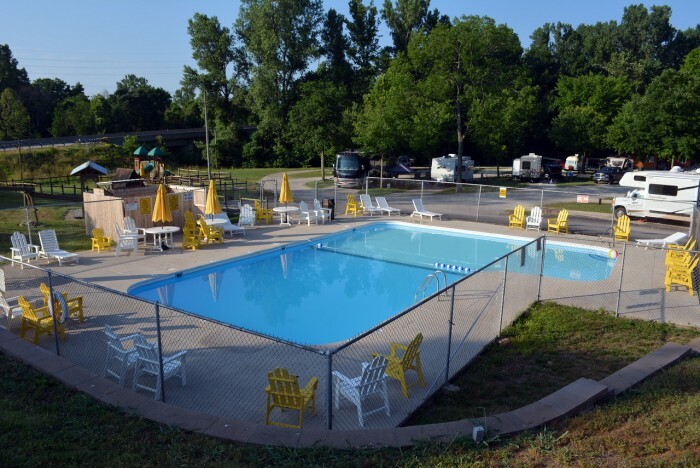 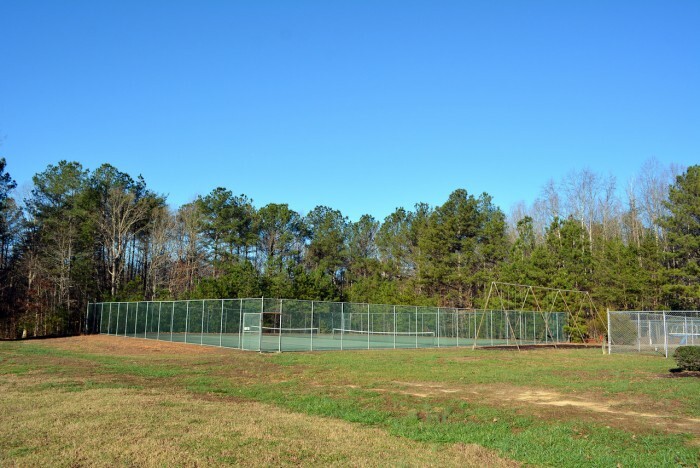 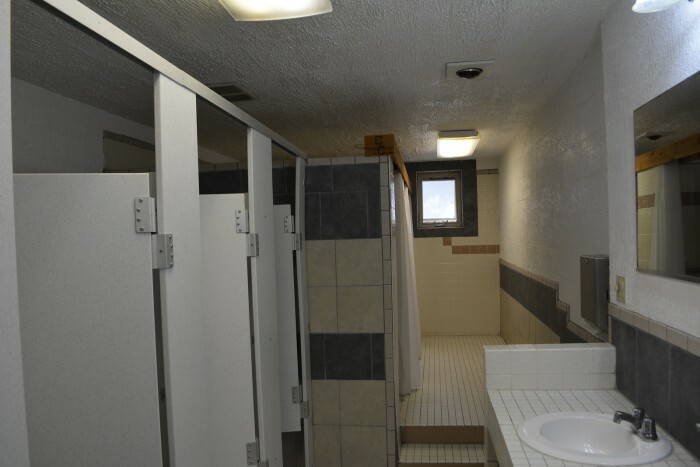 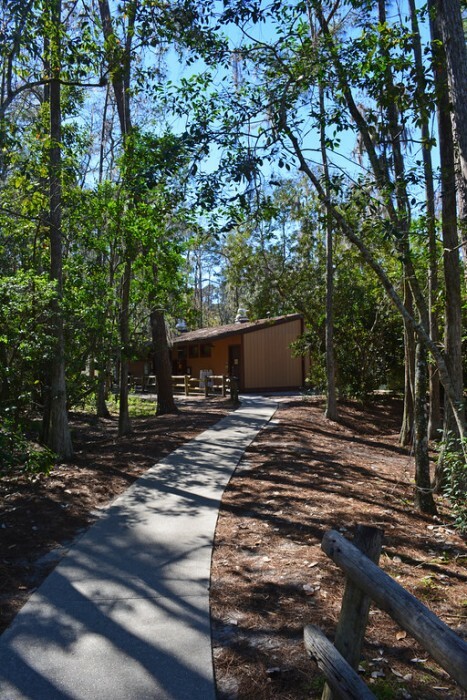 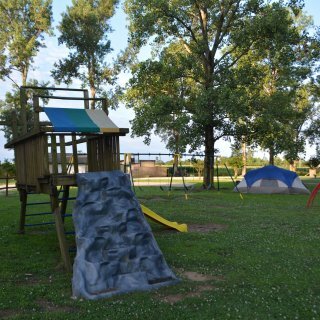 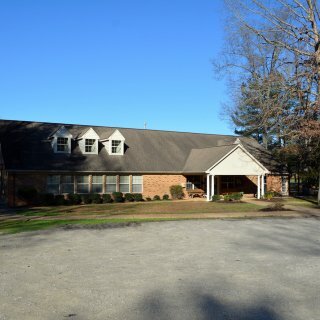 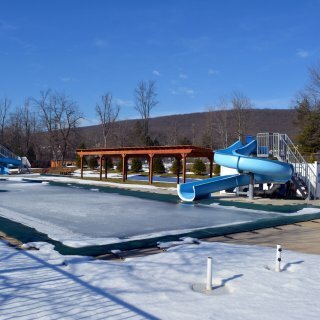 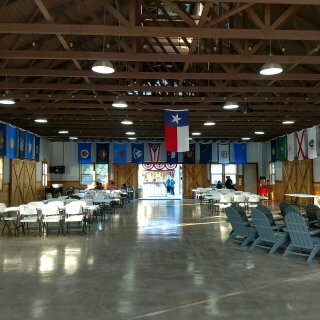 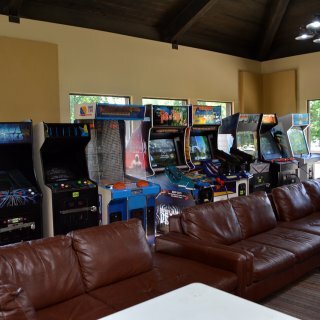 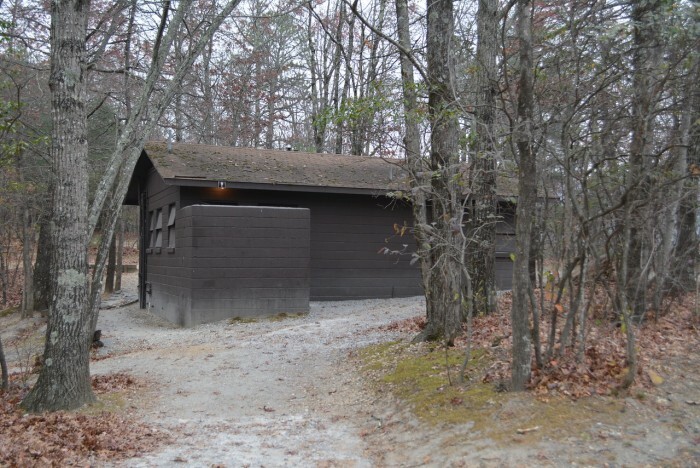 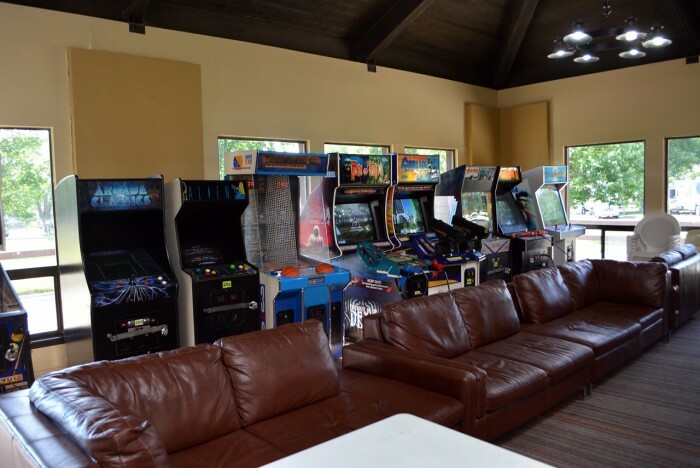 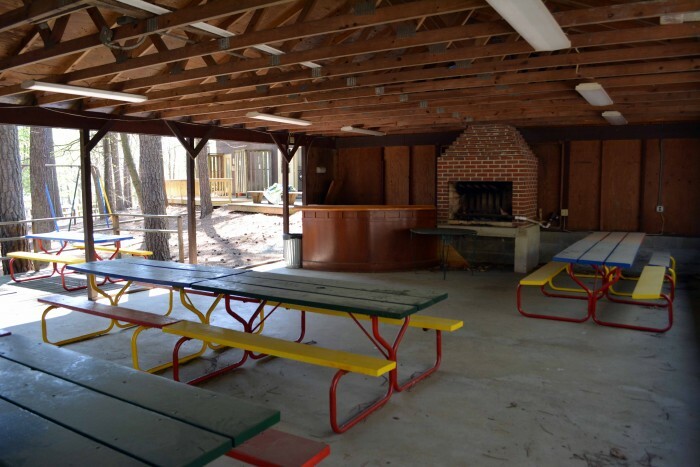 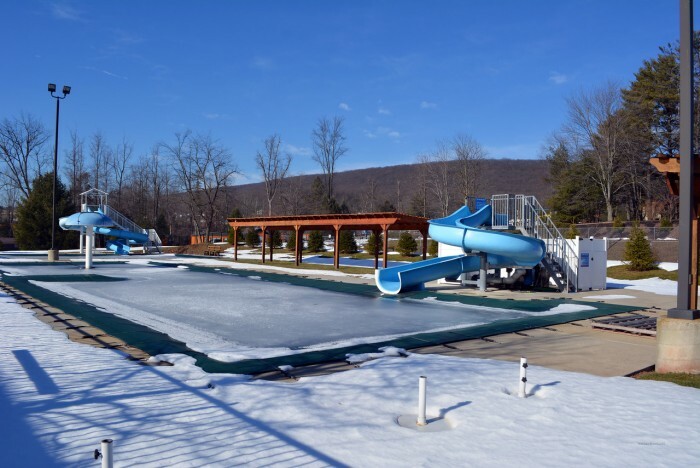 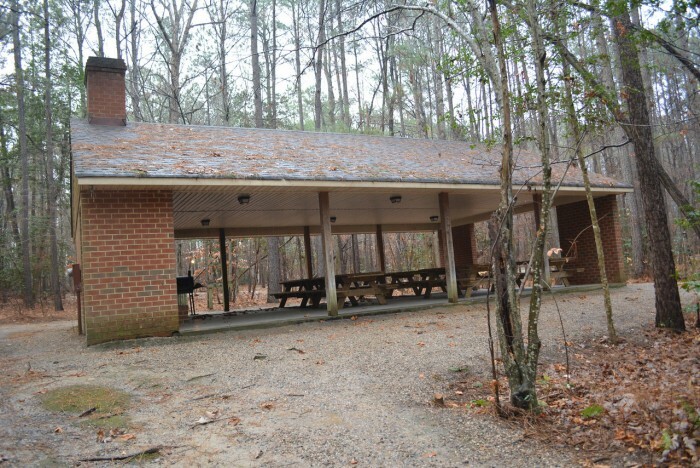 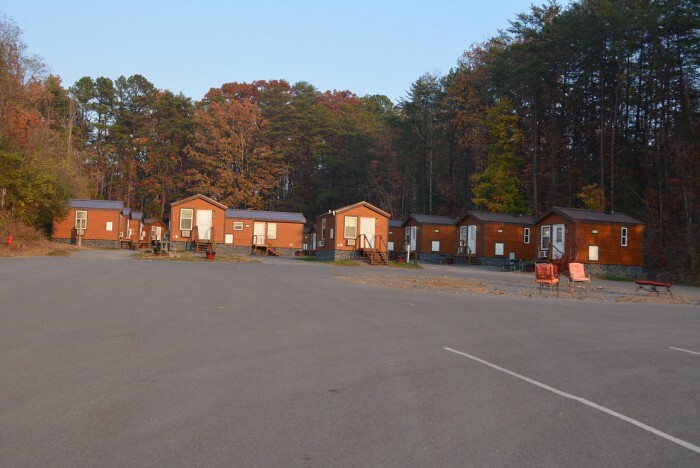 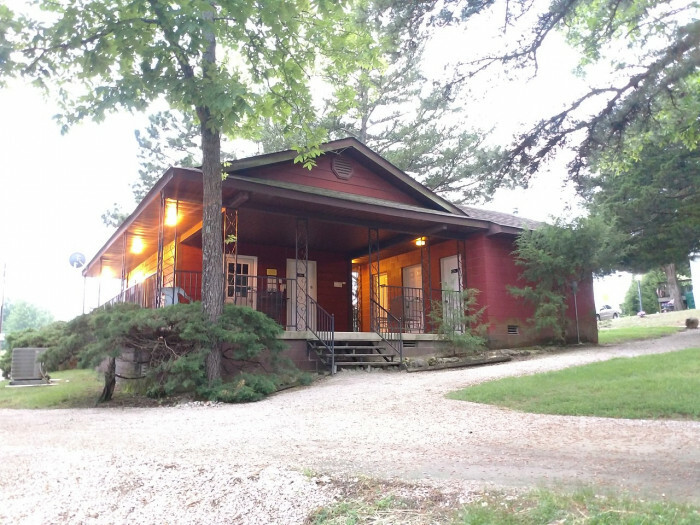 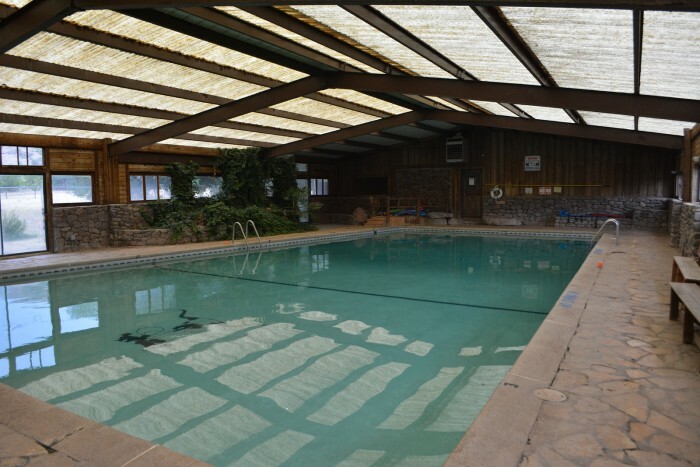 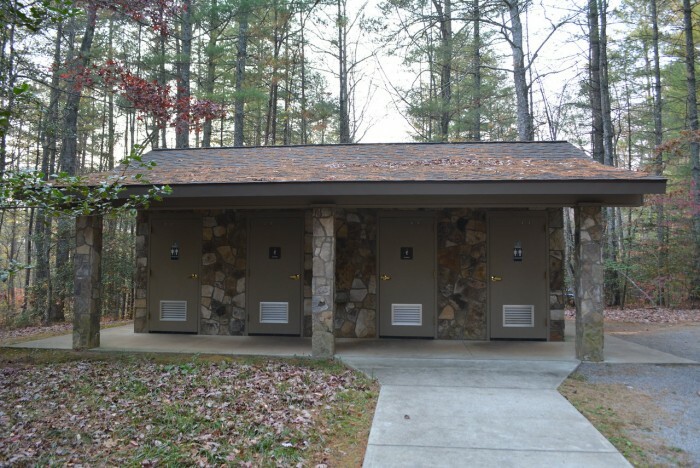 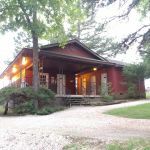 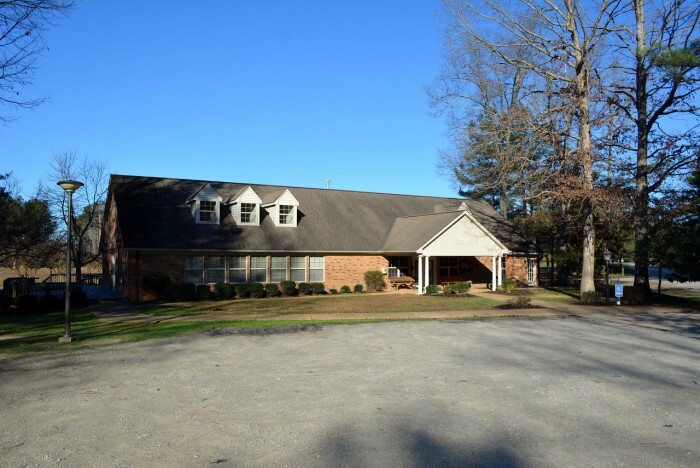 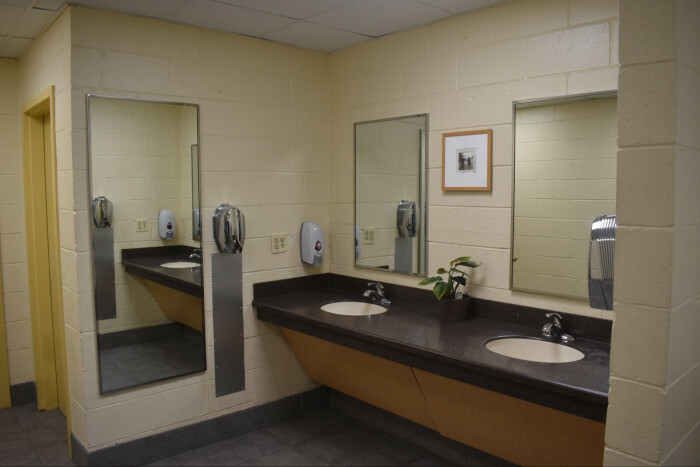 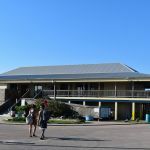 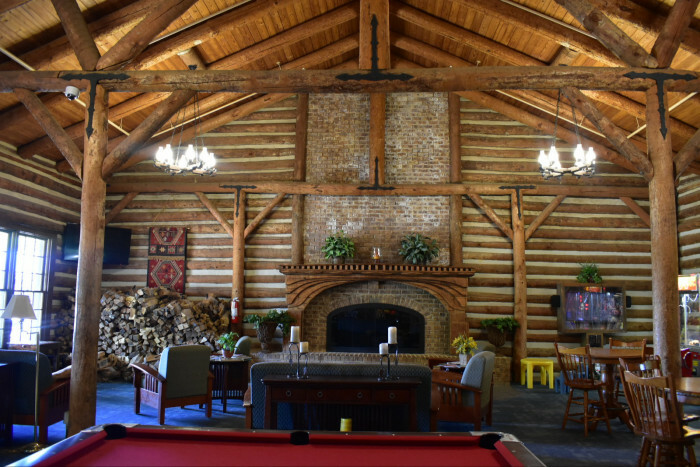 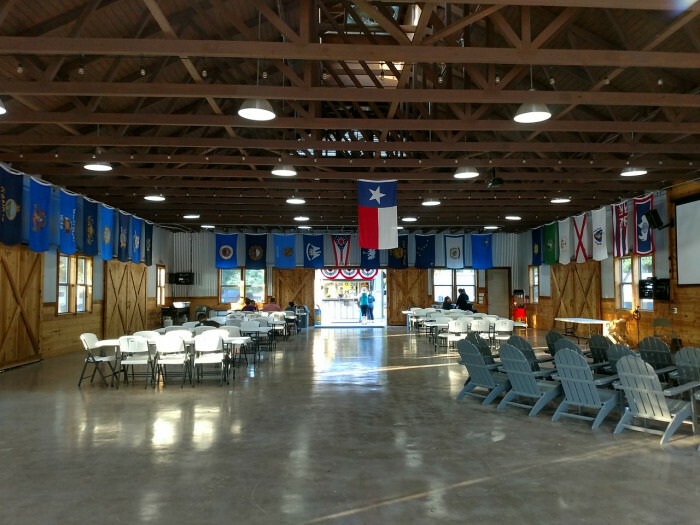 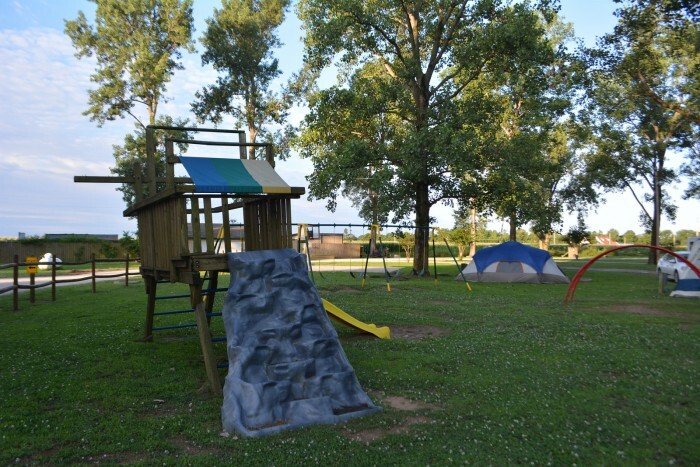 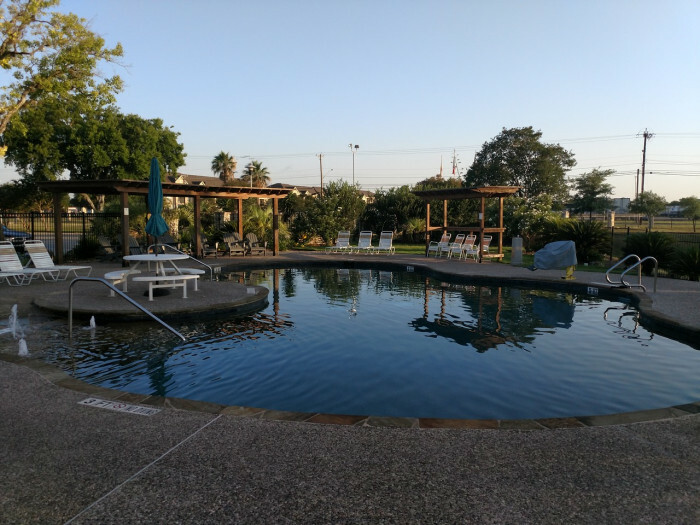 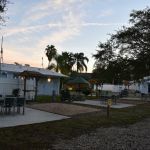 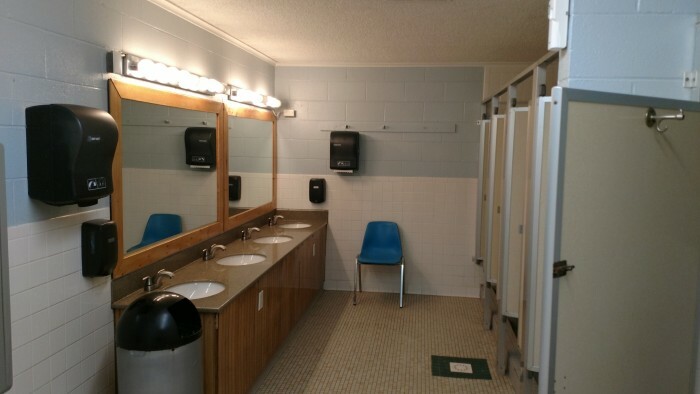 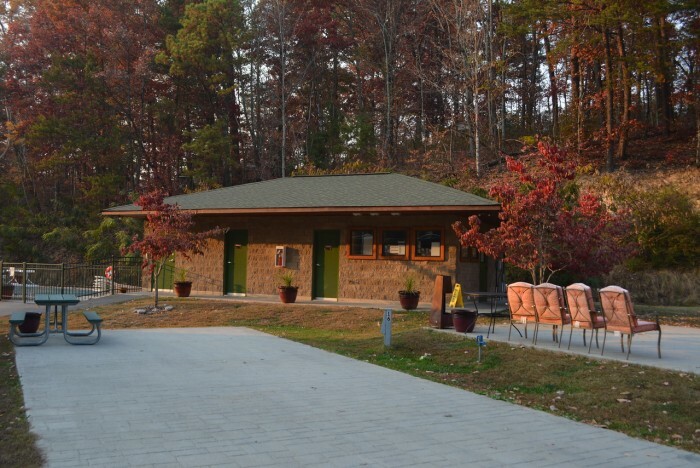 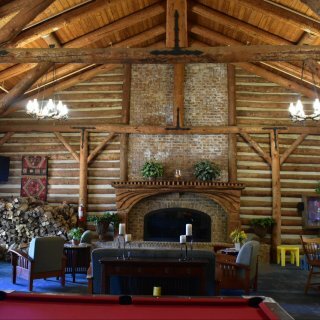 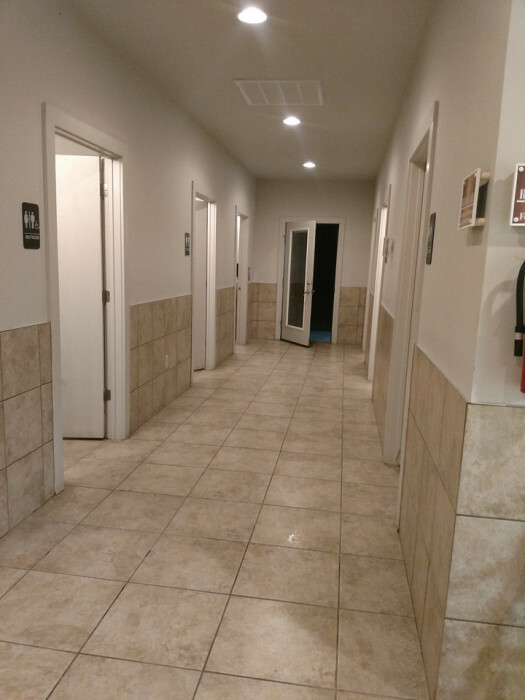 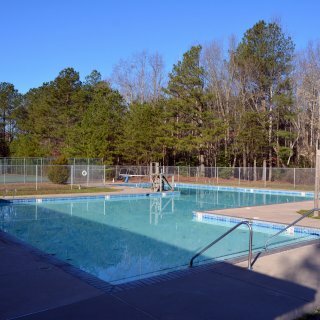 Campers may make use of the facilities of the retreat center, to include the large pool, ball courts, disk golf, miles of hiking trails, and playgrounds. 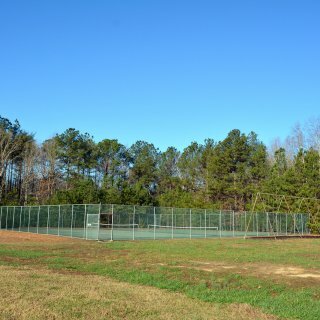 Sports equipment is available on loan. 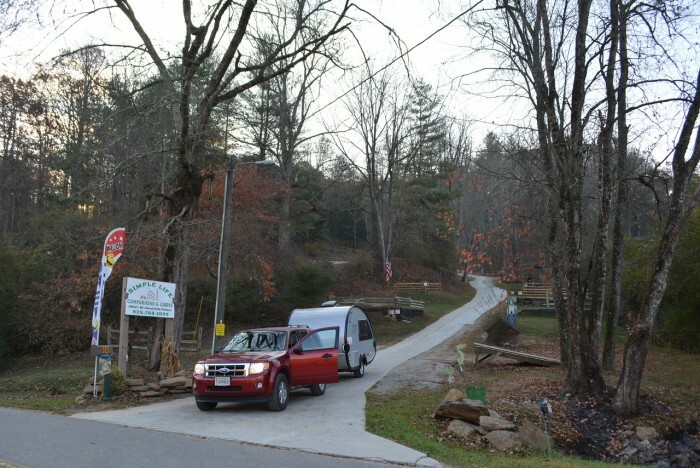 Trees along the road in as well as in the campground loop have all been trimmed over the summer, making for no more scrapping branches, so big rigs should have no problem. 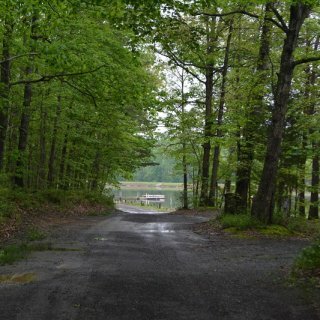 The road in is also graded regularly. 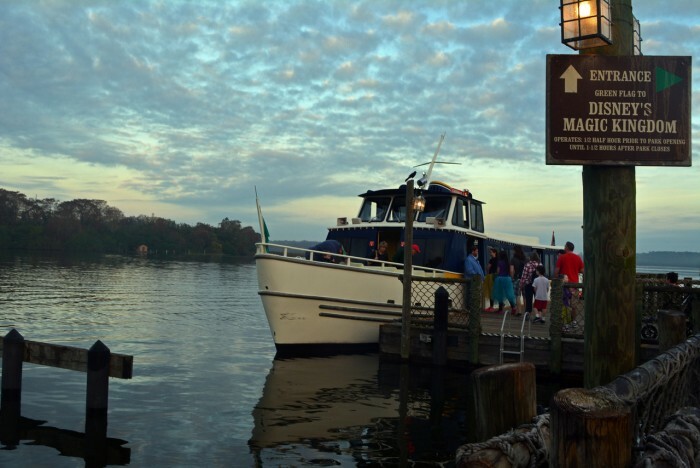 20 minutes to Williamsburg and the attractions there. 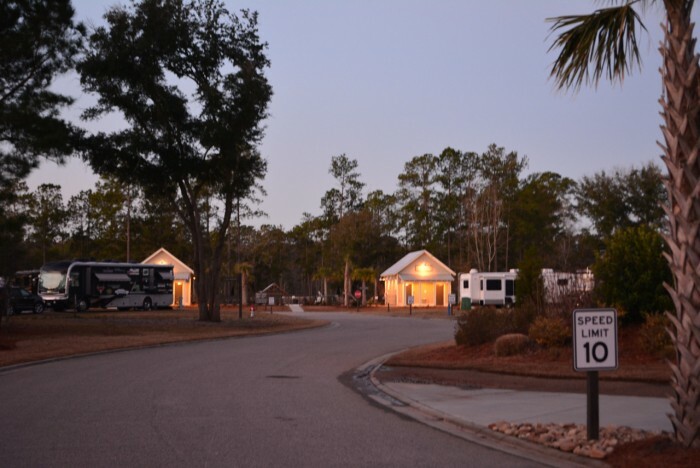 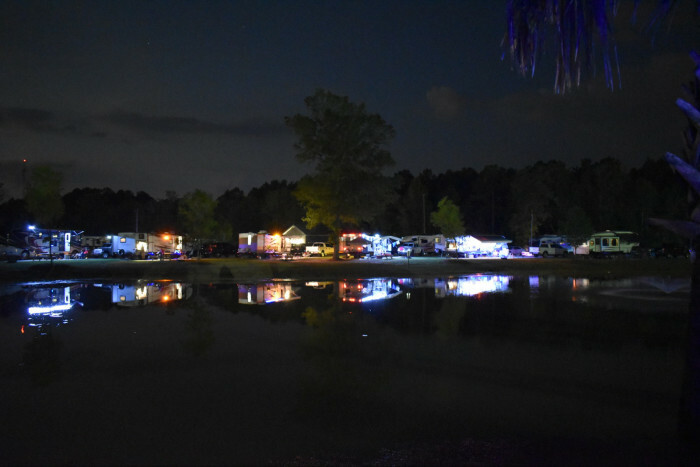 We camped at Colonial Pines Campground at Williamsburg Christian Retreat Center in a Travel Trailer. 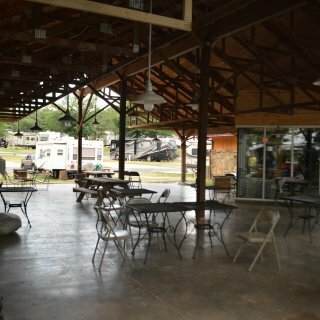 Two Drummers BBQ is 5 minutes away and very good, excellent smoked sausage and pork rinds come out still crackling. 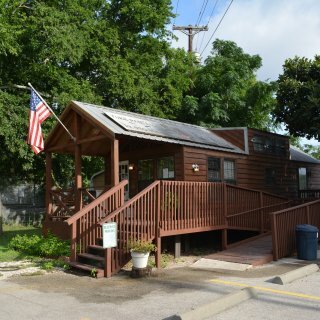 Our go to in Williamsburg is Food For Thought, very diverse menu, great food and wonderful service. 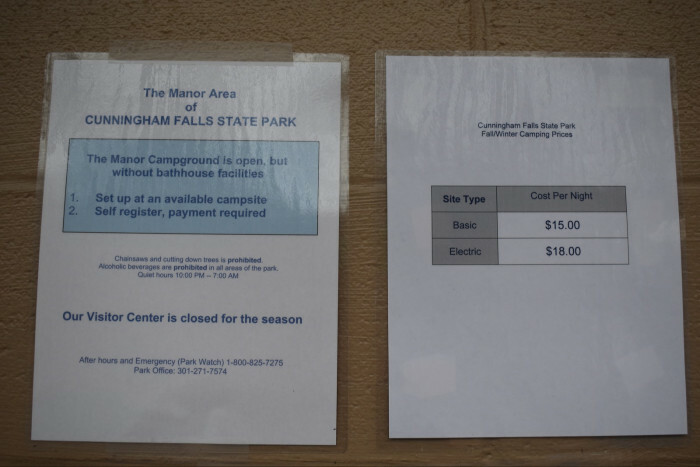 I find that my regards for this campground continues to go down over the years as the price for it as continued to go up with no improvements done to amenities provided. 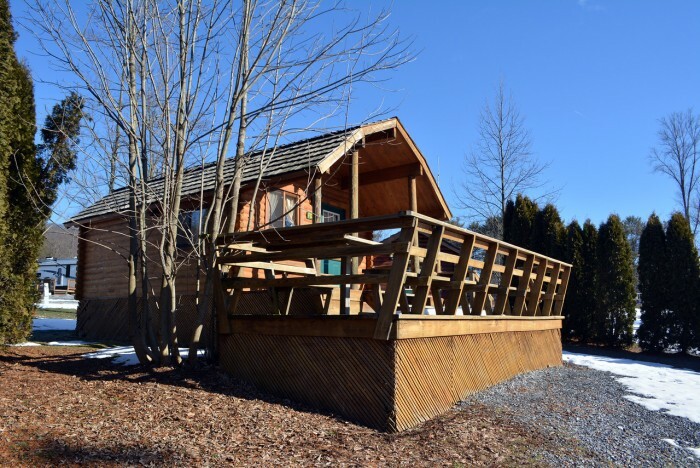 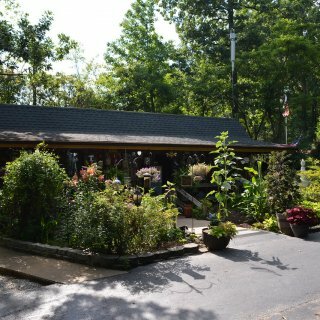 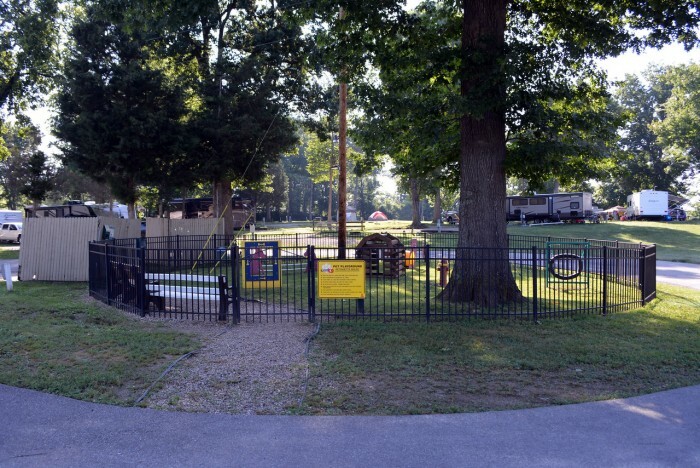 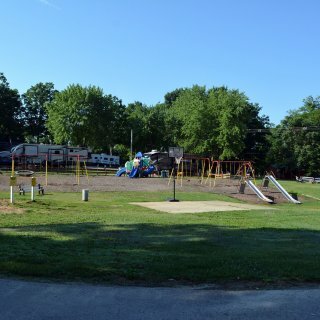 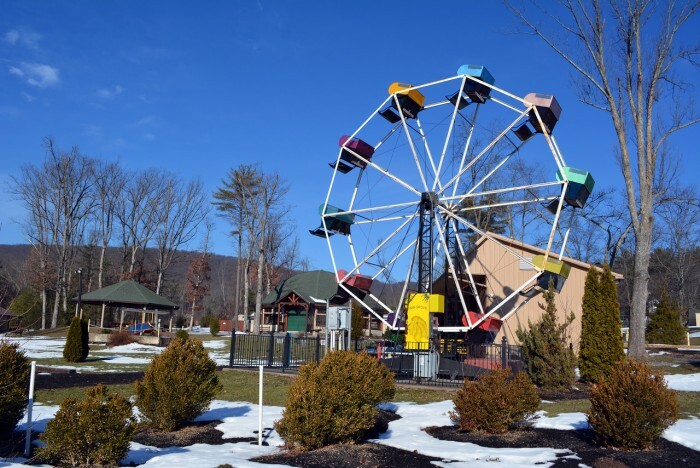 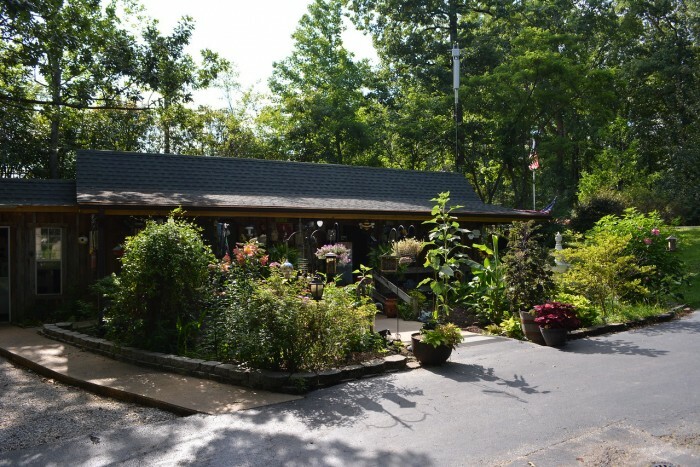 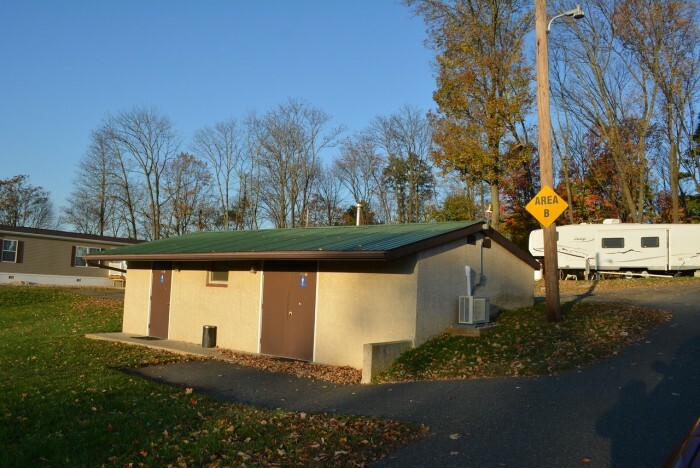 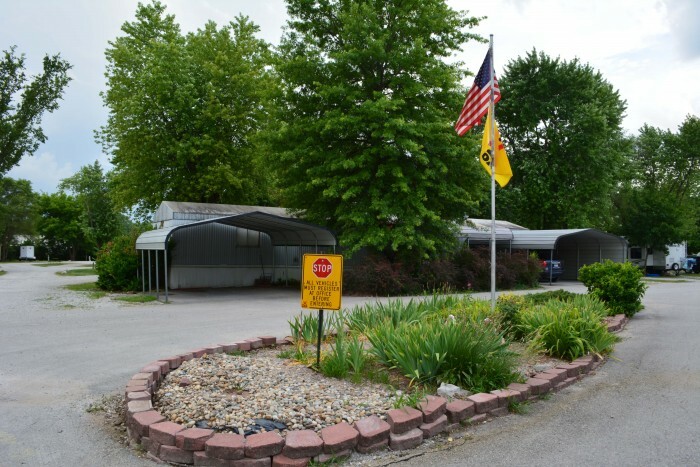 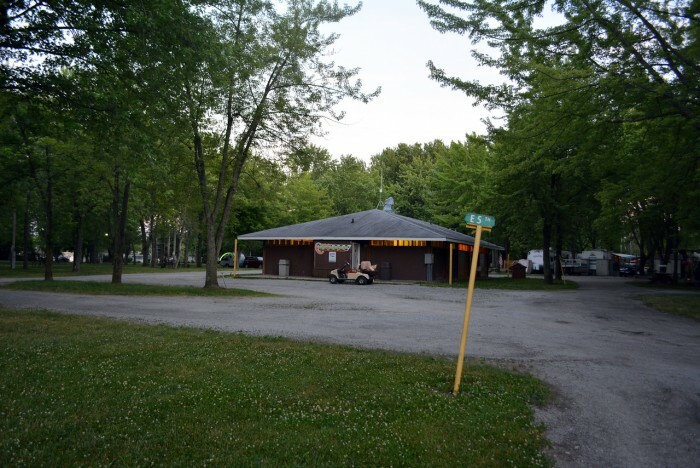 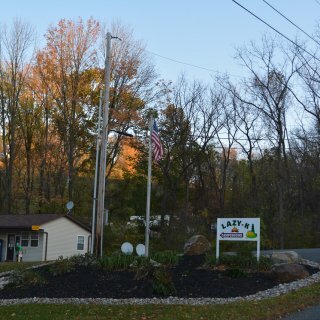 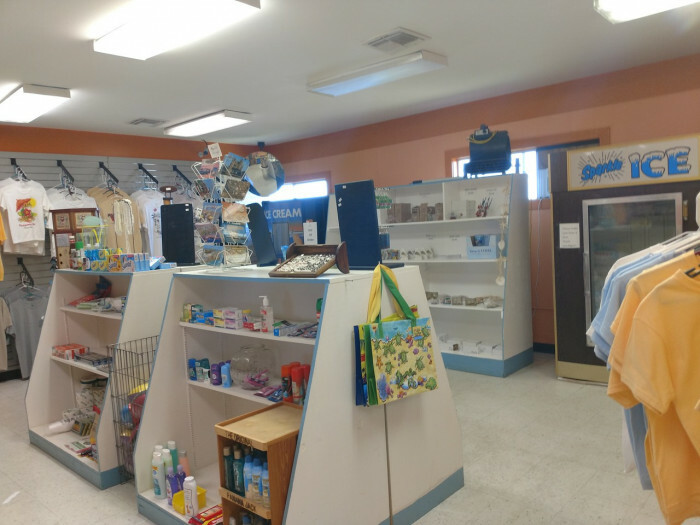 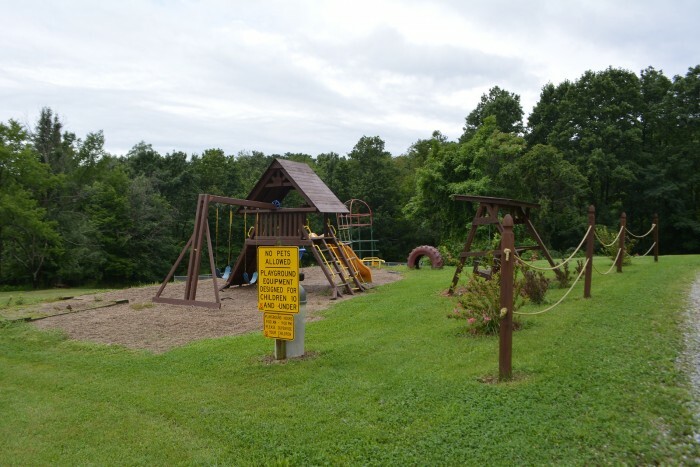 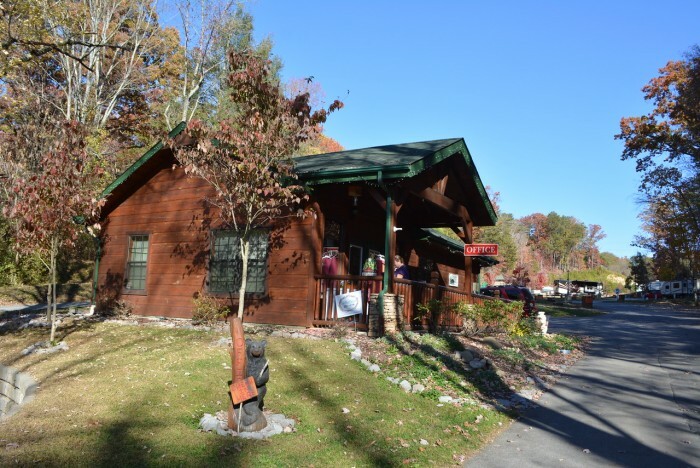 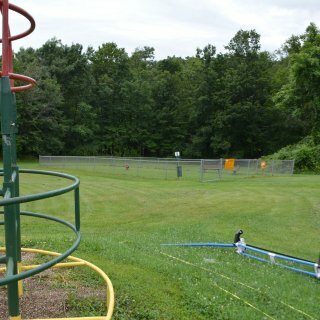 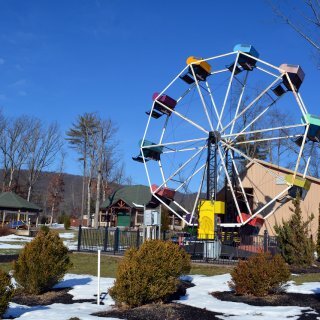 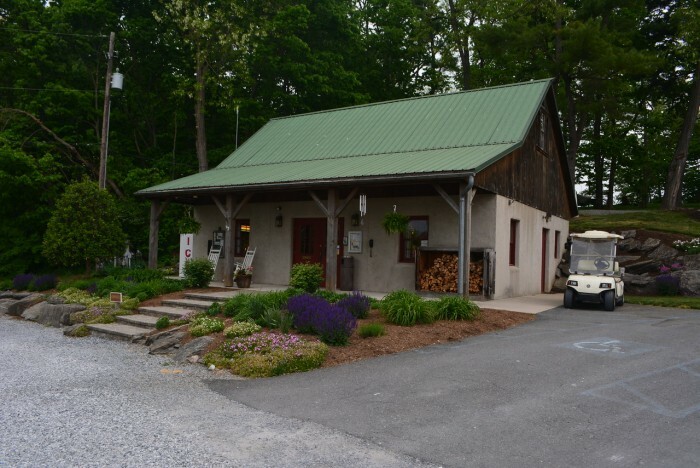 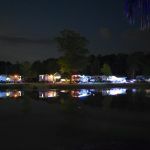 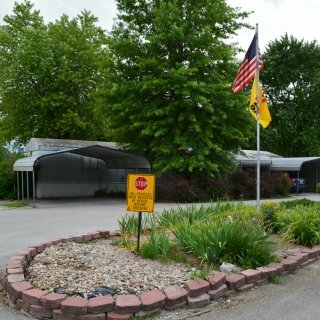 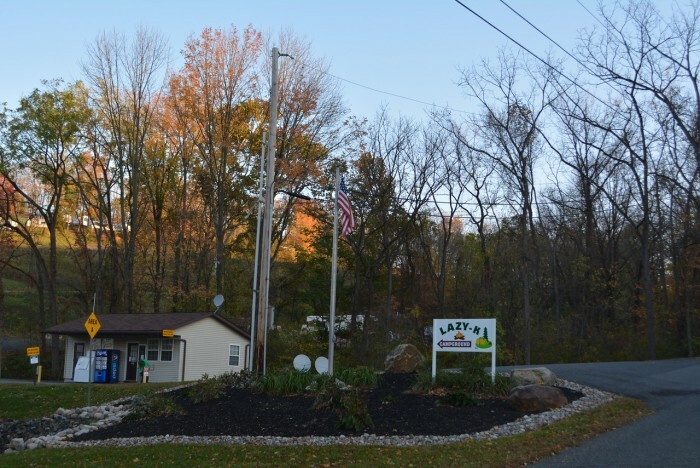 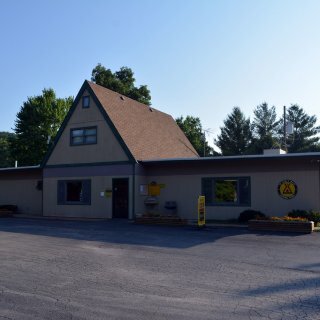 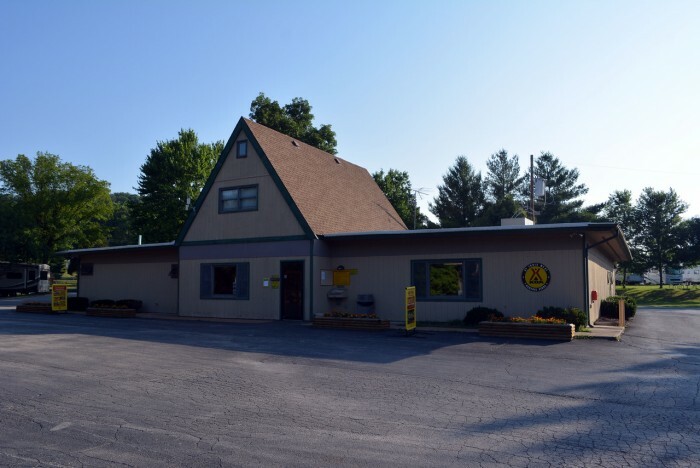 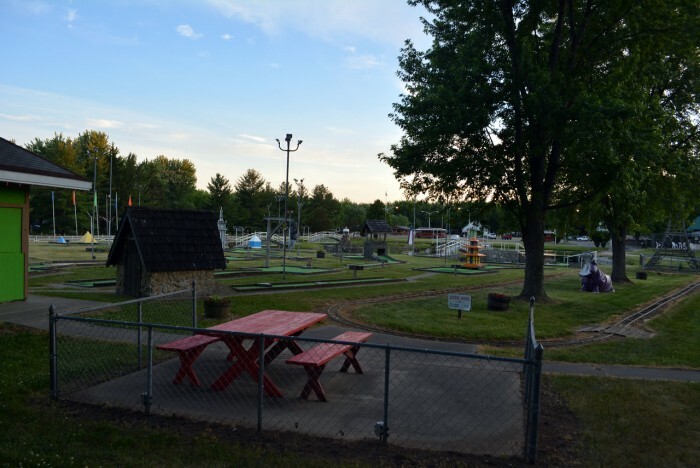 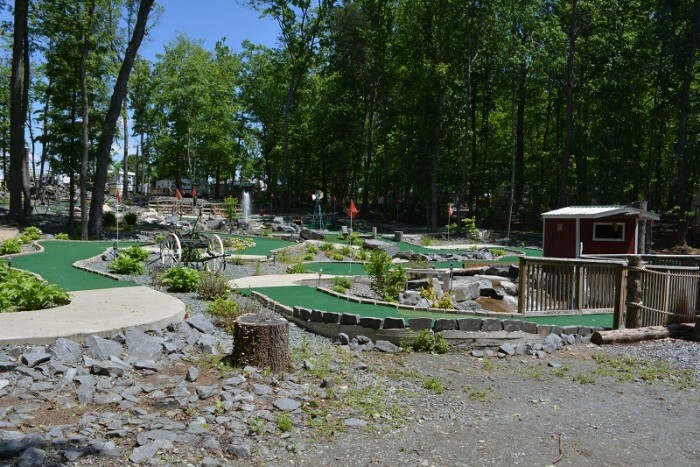 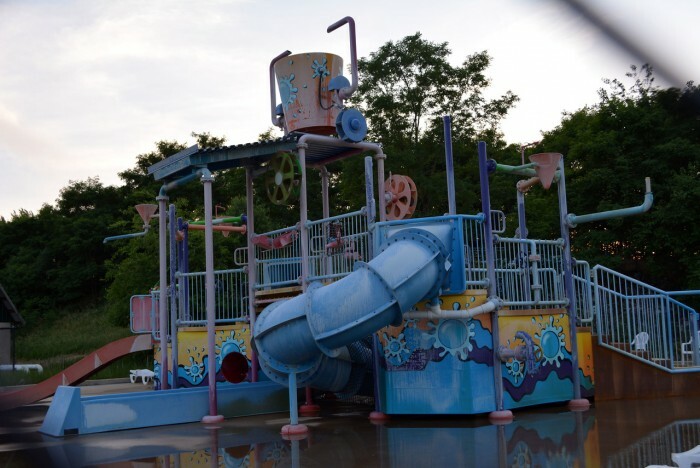 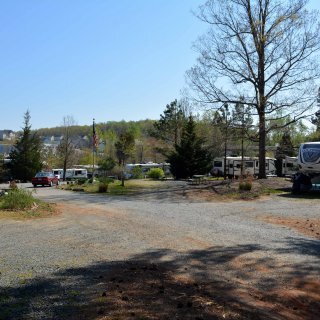 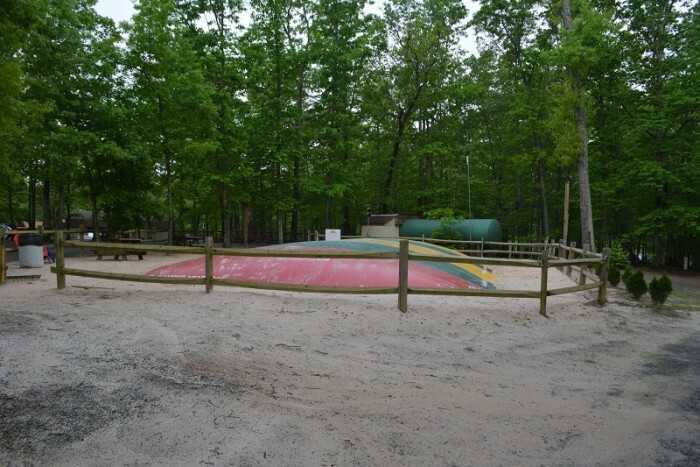 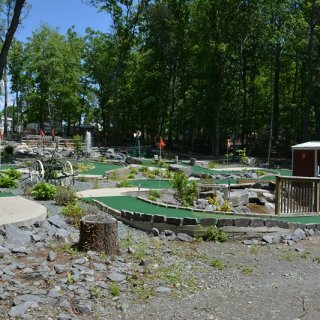 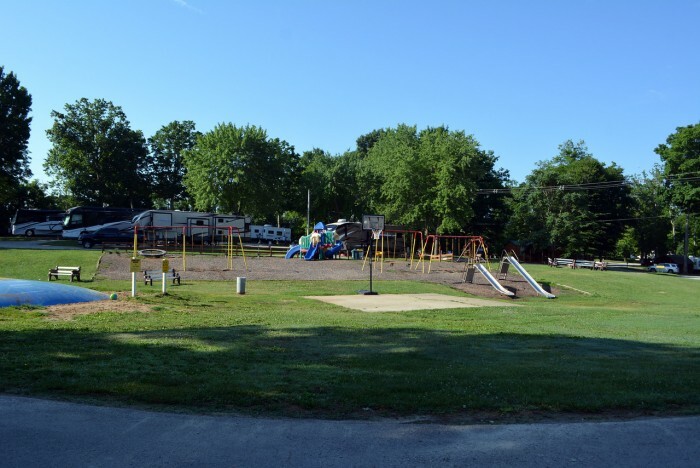 The campground's key feature is that it is right next to the amusement park, and Knoebels Amusement Park is an amazing place, a well loved and maintained throwback to a time gone by. 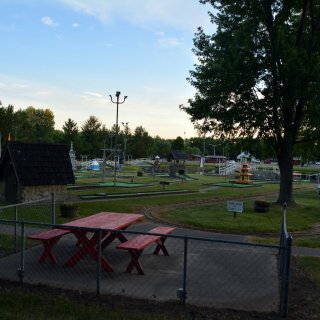 This isn't Disney or Six Flags or Cedar Point, this is a park like your parents and grandparents visited. 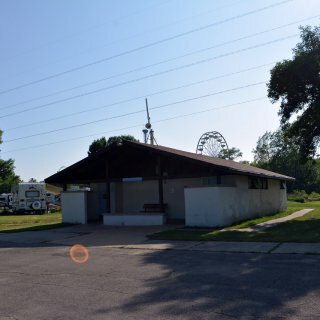 But I digress, this review is not about the amusement park. 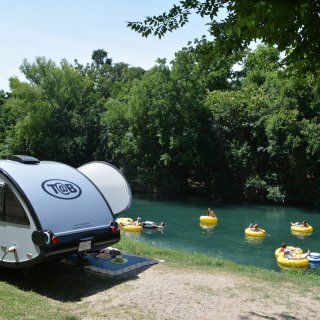 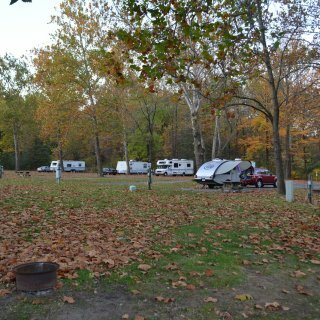 The campground is also like campgrounds your parents and grandparents went to, but at a modern price. 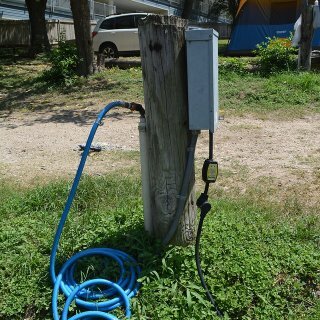 Sites are often cramped, rarely level, and offer only electric, though water is available and they have four dump stations. 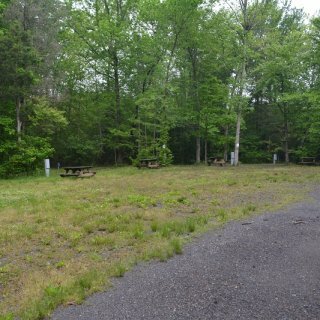 Site all also have picnic tables and fire rings. 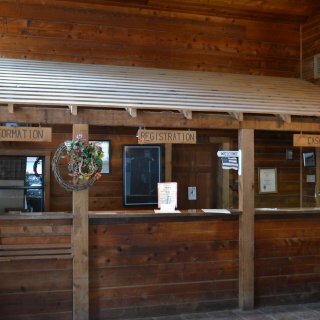 Check in is quick and easy, the park is operated by people that know their business and are used to high volumes of traffic. 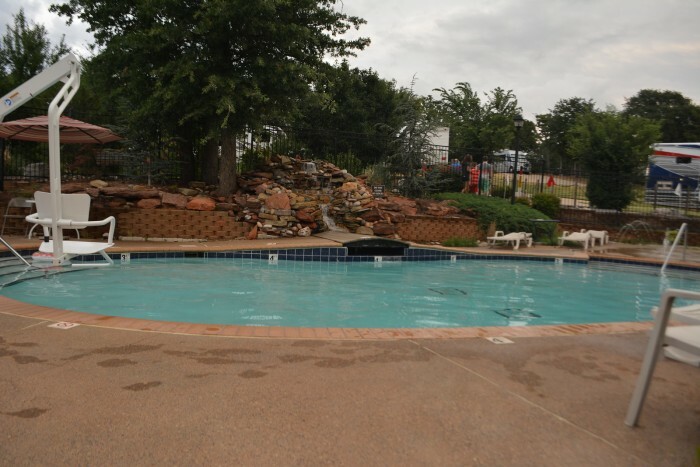 The staff is very friendly and do their jobs exceptionally well. 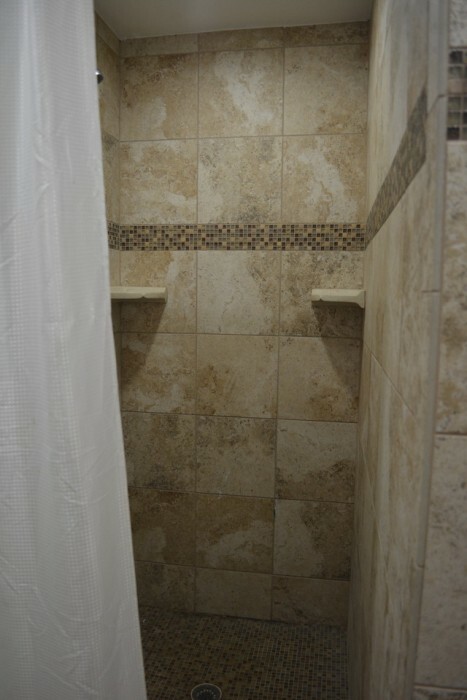 Shower houses are very dated but also kept very clean and never lack in hot water. 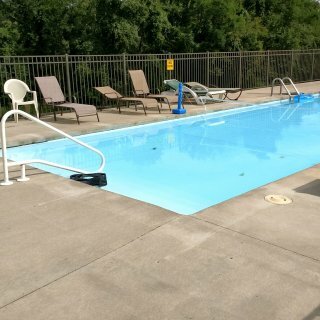 The tiny pool was closed on this visit. 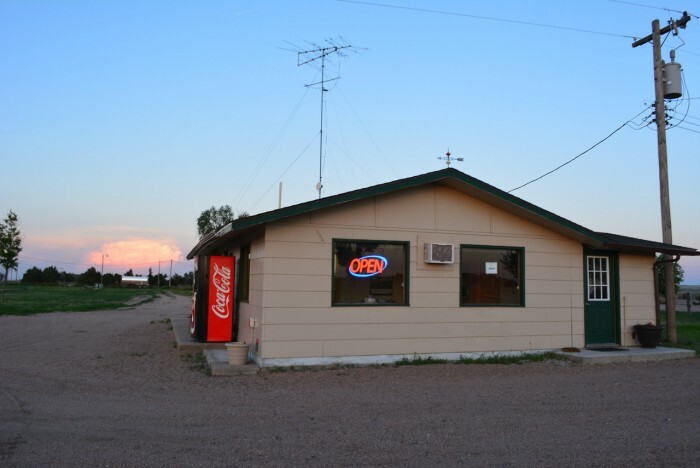 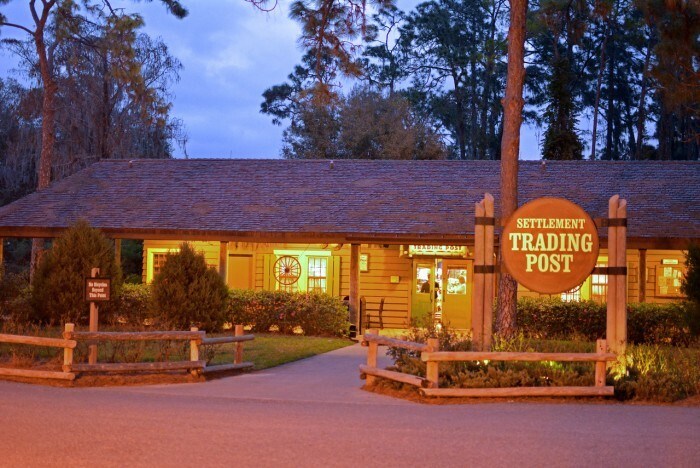 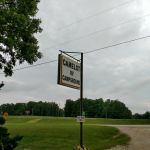 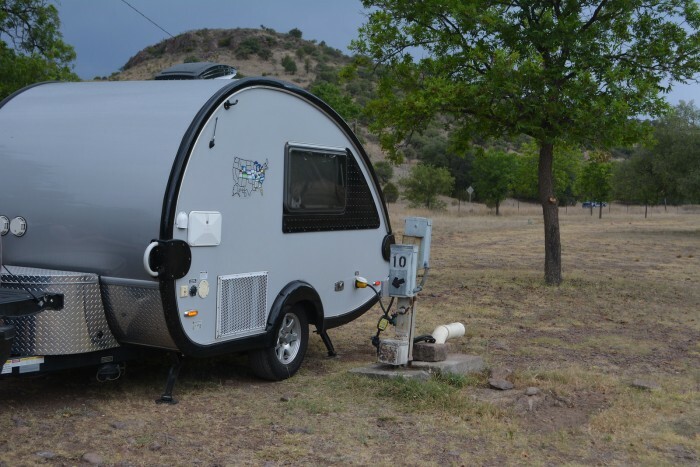 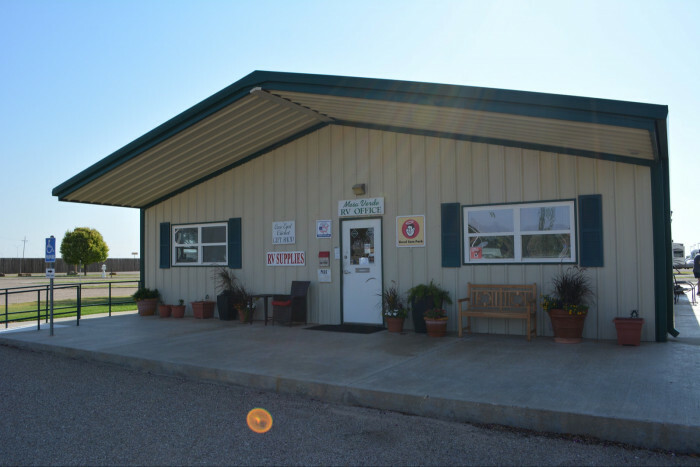 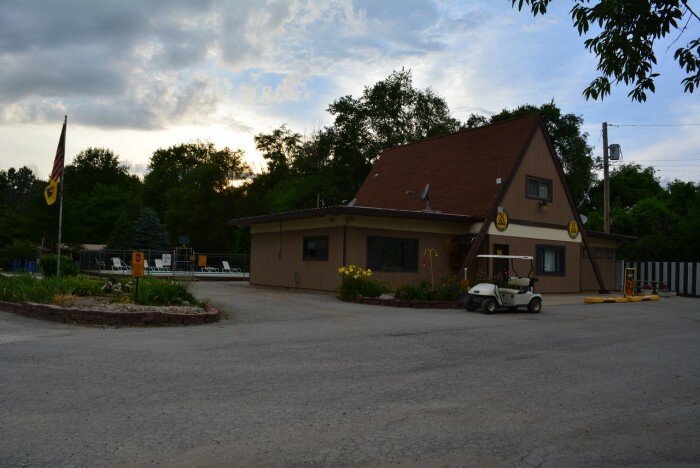 While I could go on and on about the price, I still love this campground for what it is and the convenience it offers, and will continue to return. 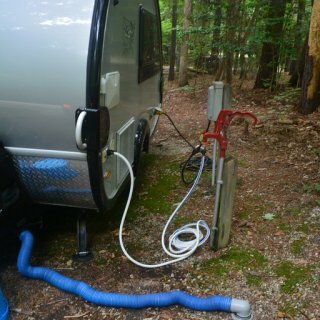 We camped at Knoebels Amusement Resort in a Travel Trailer. 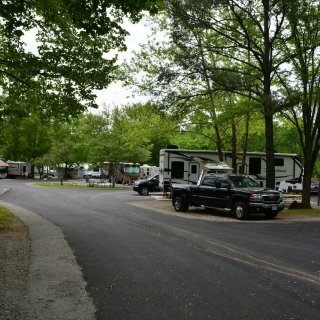 We used this campground as a stopover on our way to Charlotte after getting stuck in horrible Atlanta traffic. 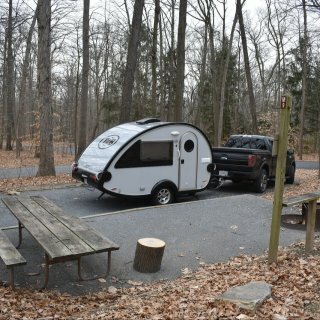 The had just one site available when we pulled in, a P/T W/E site. 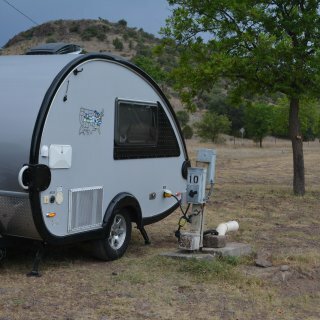 The site was gravel, fairly level and plenty long enough for our little unit, though a larger rig would have trouble. 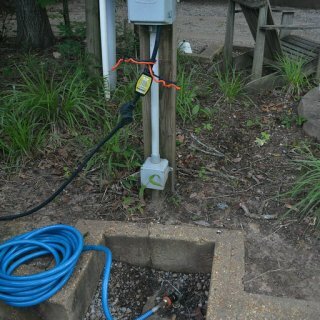 Water and electric worked as expected and were centrally placed. 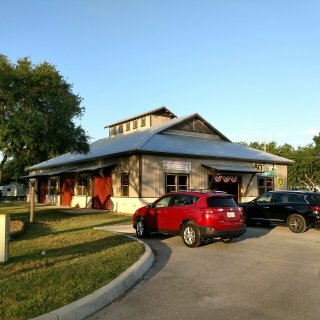 Check-in was easy, the pleasant woman, who was also the owner, had no trouble looking up my KOA membership, and recommended an excellent restaurant just down the road. 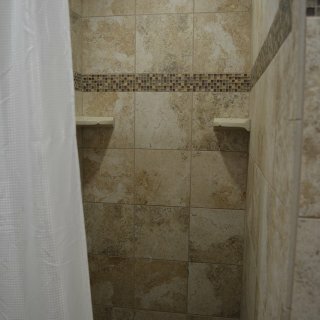 Shower house was clean and had some updates, well stocked, and had plenty of hot water. 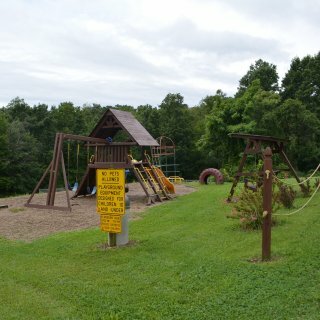 Overall the park was a good stopover point for us. 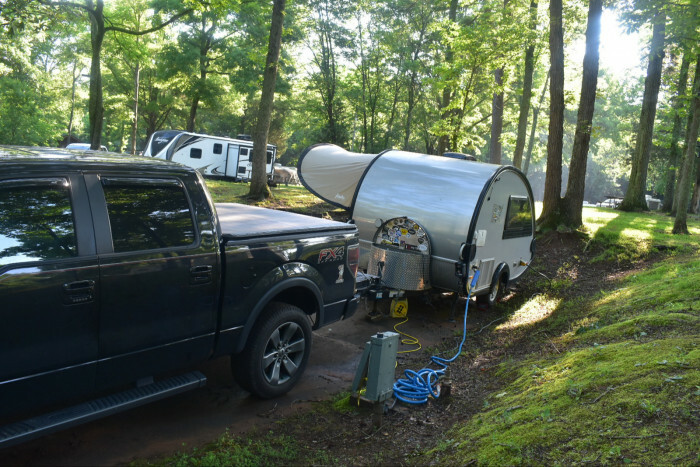 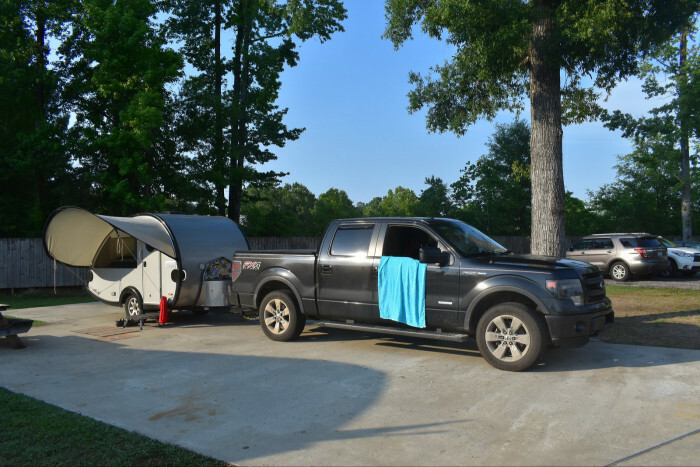 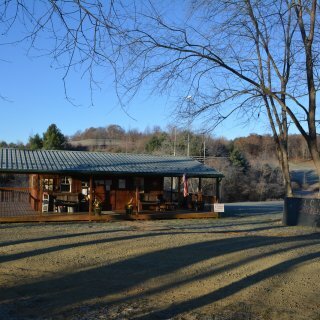 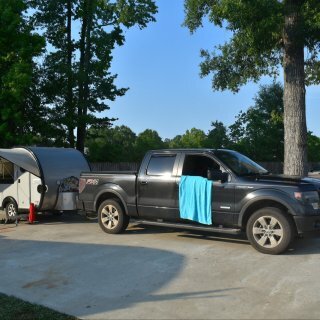 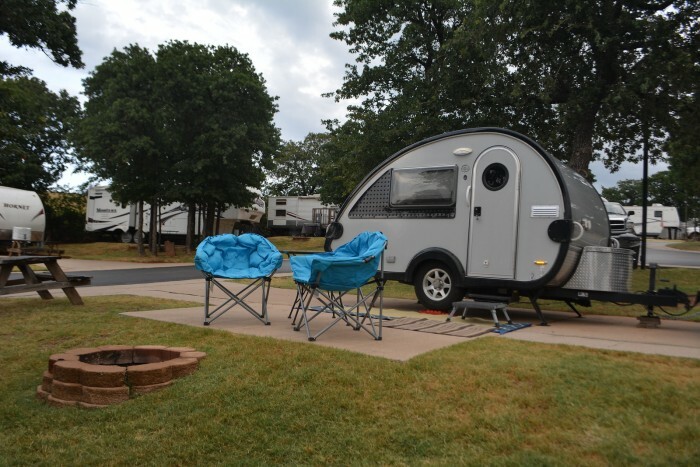 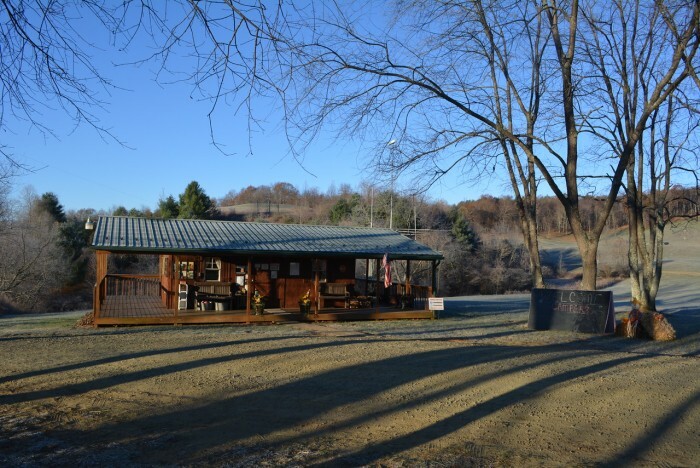 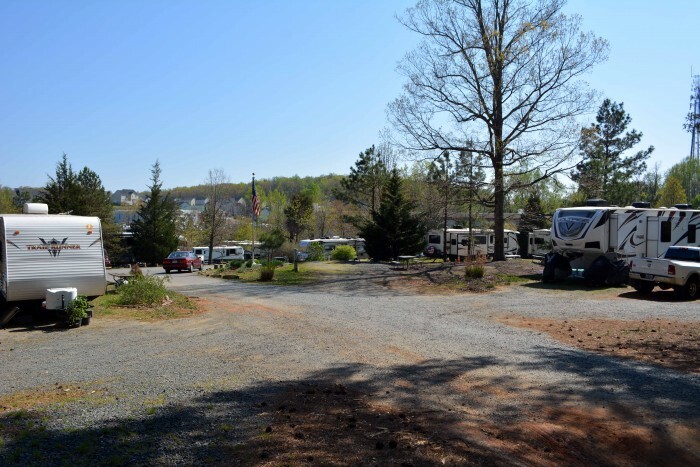 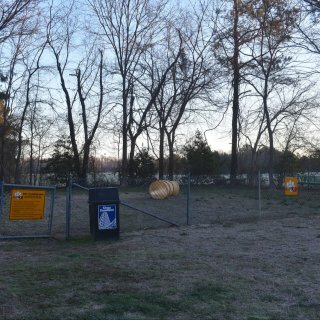 We camped at Anderson / Lake Hartwell KOA in a Travel Trailer. 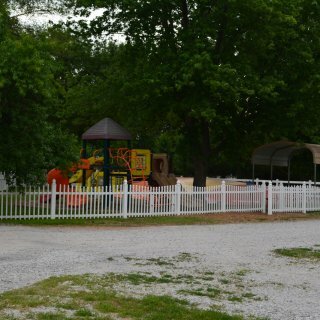 We came in on a Saturday morning without a reservation but they still were able to get us a site. 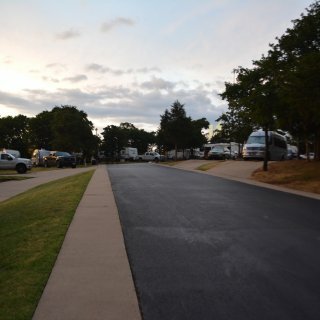 Site was a level back-in FHU, the first two thirds paved and the last part dirt. 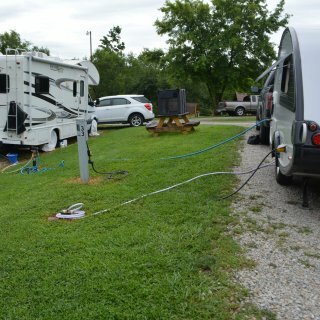 Hook-ups were in the middle of the site and all in good working order. 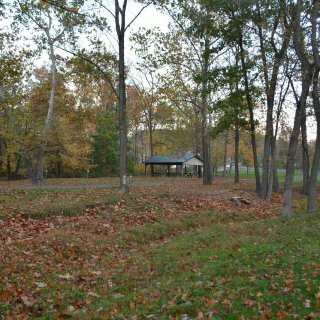 The site was surrounded on three sides by a five foot hill which offered some privacy and was well shaded. 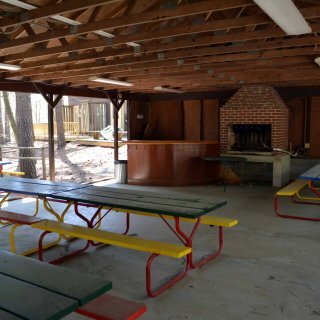 Picnic table and a charcoal grill are provided, no ground fires were allowed. 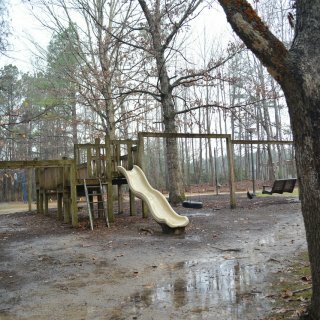 The site did get pretty muddy after a heavy afternoon rain. 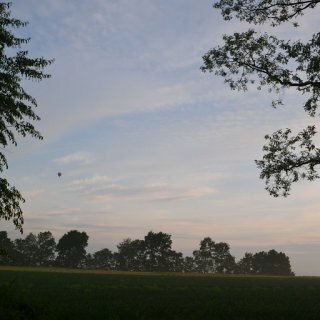 It got very buggy in the evening. 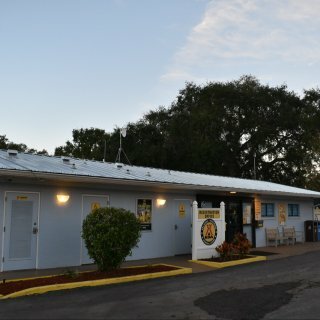 Check-in was easy and staff was friendly. 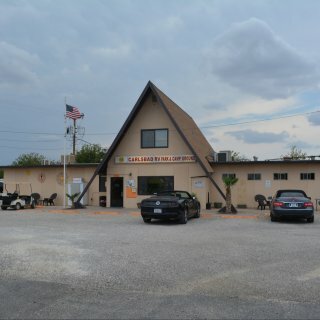 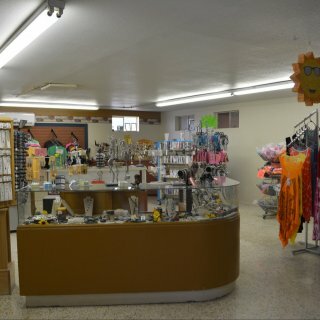 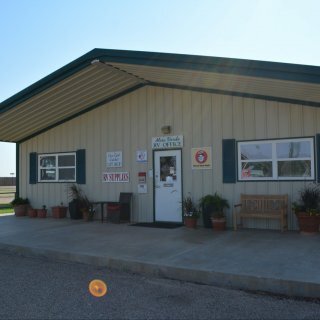 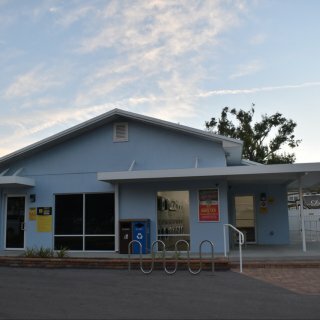 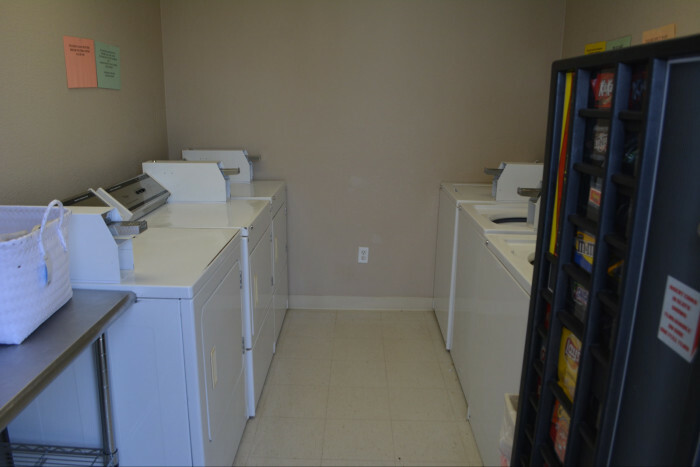 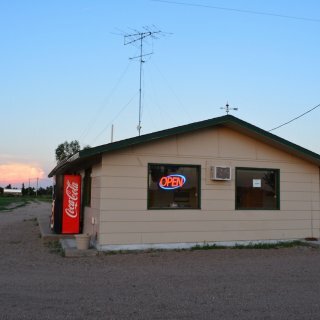 The office doubles as an OK stocked store and a recreation center with a nice sitting area. 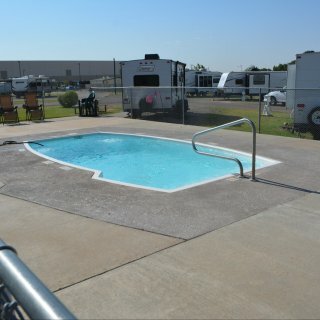 Nice pool with lifeguard is next to the office, and shower house is attached in the back. 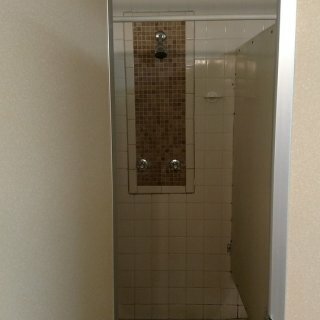 Showers were clean and modern. 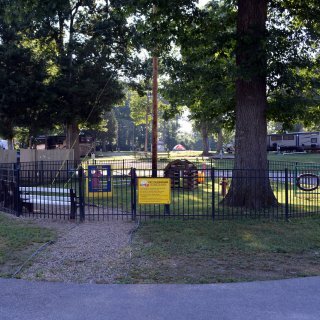 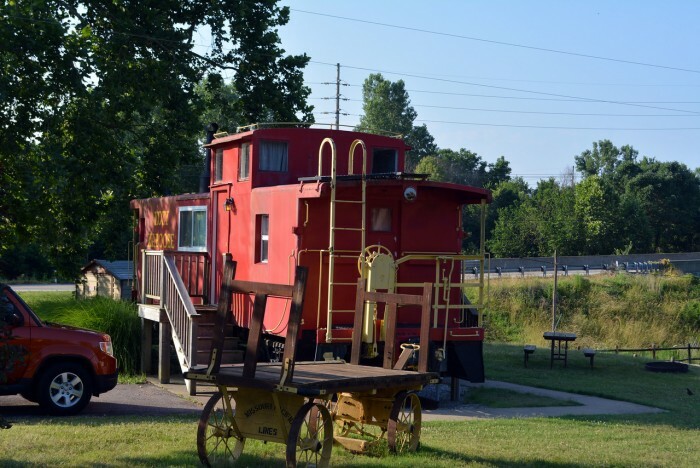 The campground offers a free shuttle to the amusement park next door. 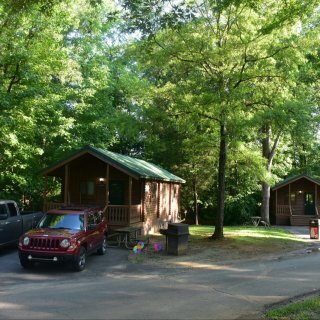 Overall a decent campground, though a bit pricey. 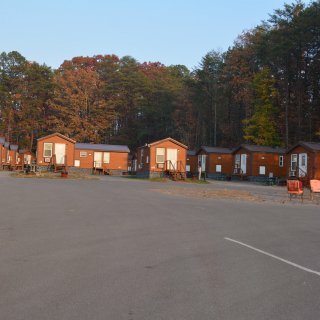 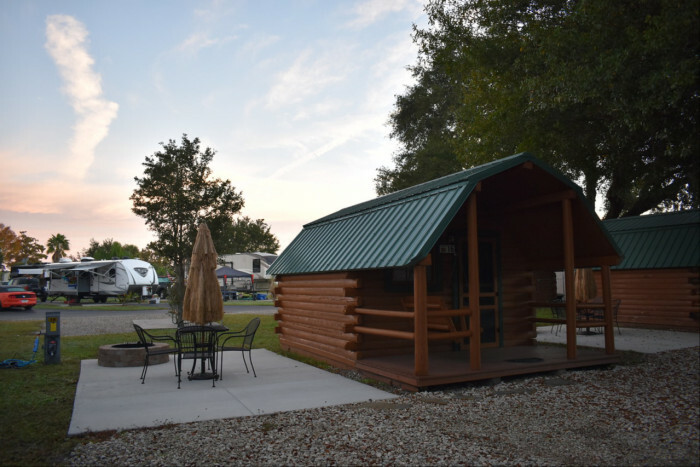 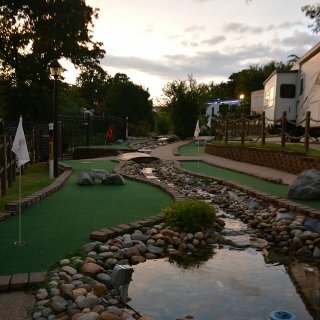 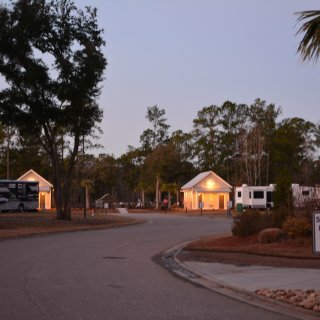 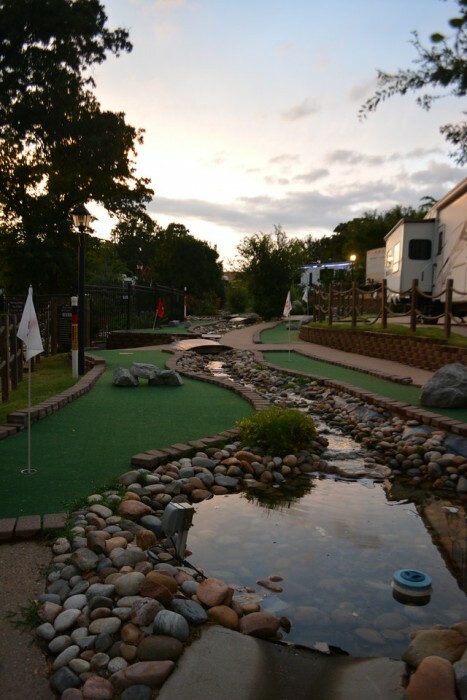 We camped at Carowinds Camp Wilderness Resort in a Travel Trailer. 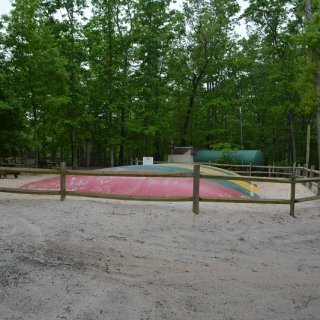 Carowinds is the main draw, with a shuttle to take you to the park. 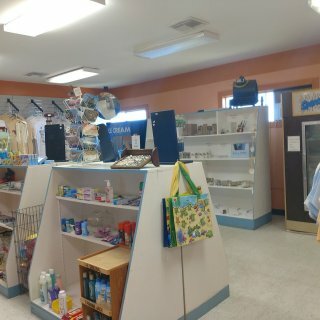 Lots of shopping and eating close by. 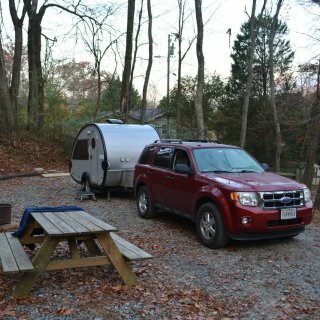 A solid campground for an overnight while passing through the area. We arrived later without a reservation. 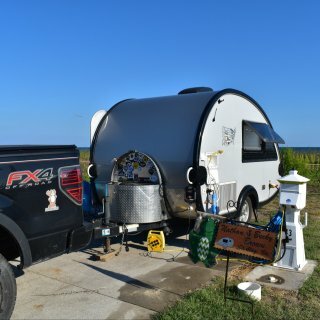 We were none the less greeted by the friendly owners, checked in and placed in a small pull through that was just perfect for our unit. 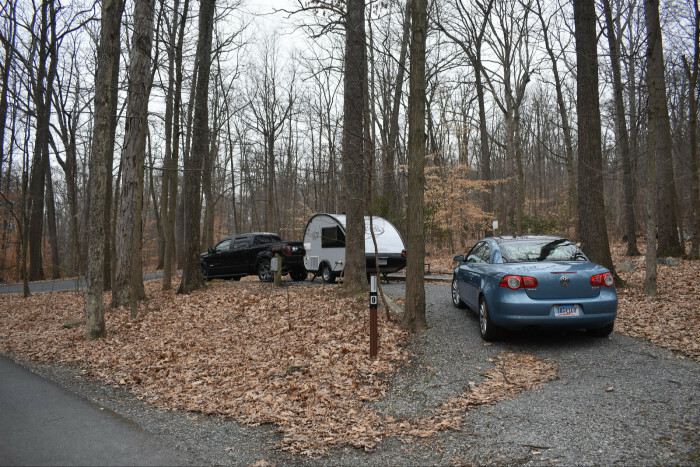 The site was level, gravel, and had full hookups that were centrally located and worked properly. 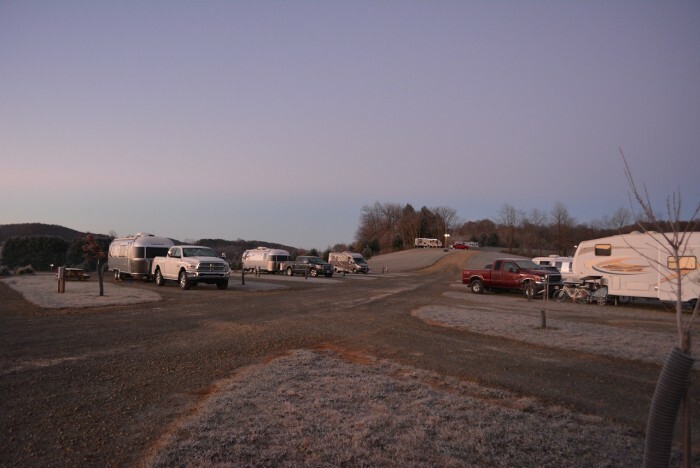 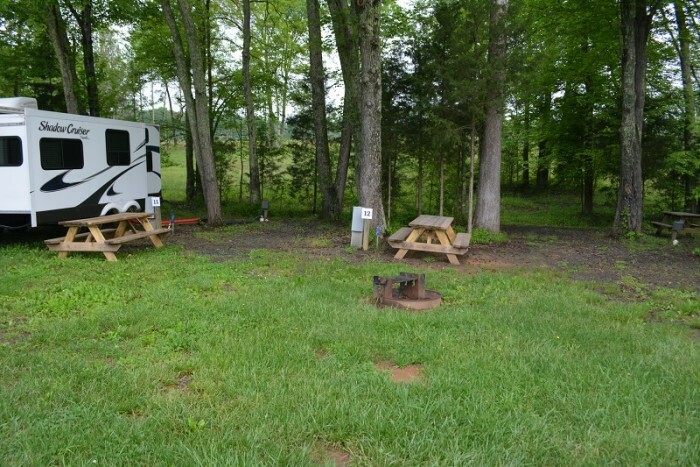 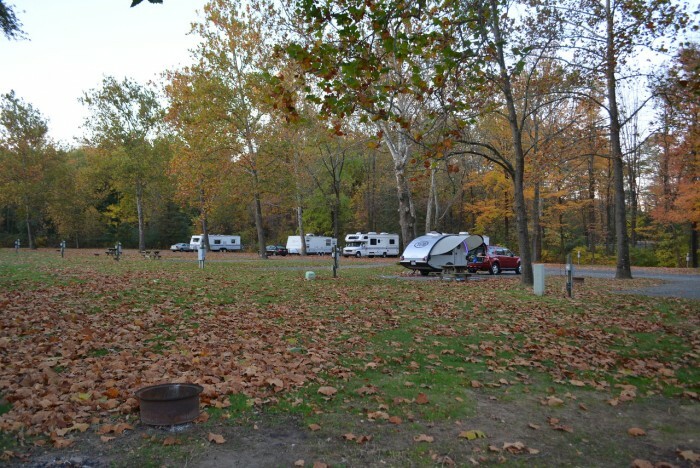 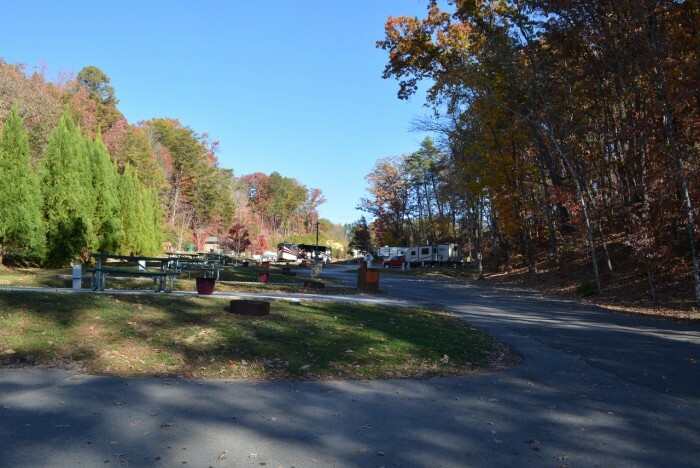 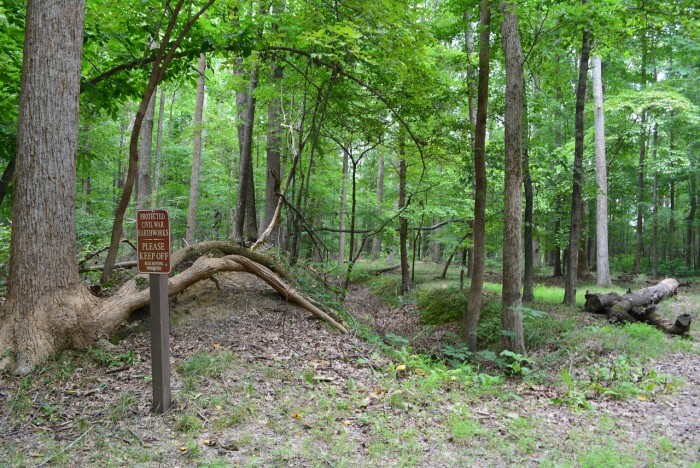 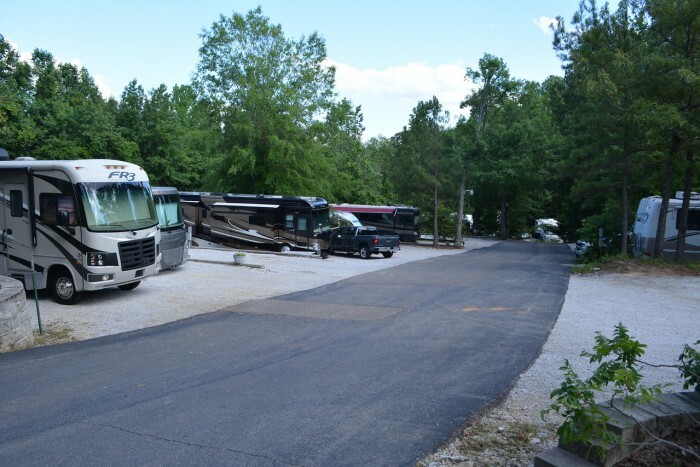 The campground is basically divided into two areas, an upper and lower area. 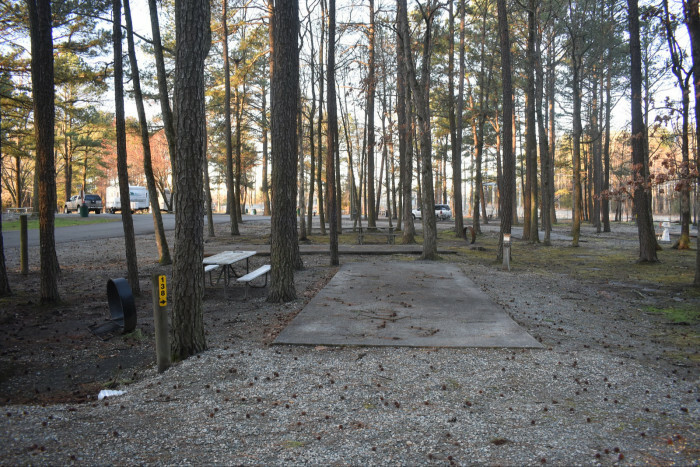 The upper area is smaller, tighter, and wooded, while the lower area is wide open and can accommodate large rigs. 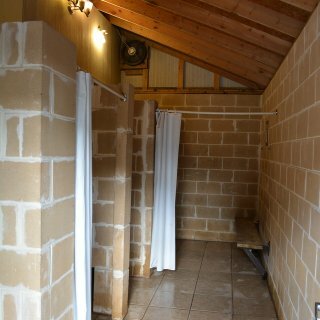 The shower house was small but very clean, and we made use of the little laundry at the back of the office, which all functioned properly. 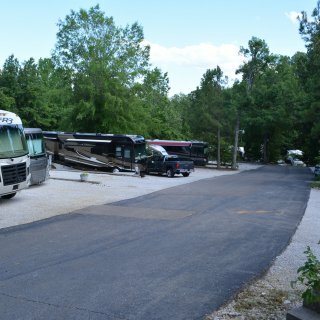 Campground is cash or check only. 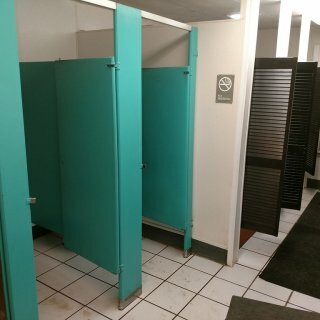 Would stay again if passing through. 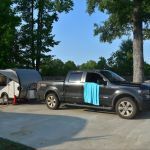 We camped at Camelot RV Campground in a Travel Trailer. 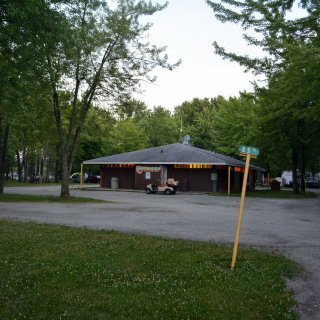 This is a gem of a municipal park, reasonably priced considering it is sitting right on the beach. 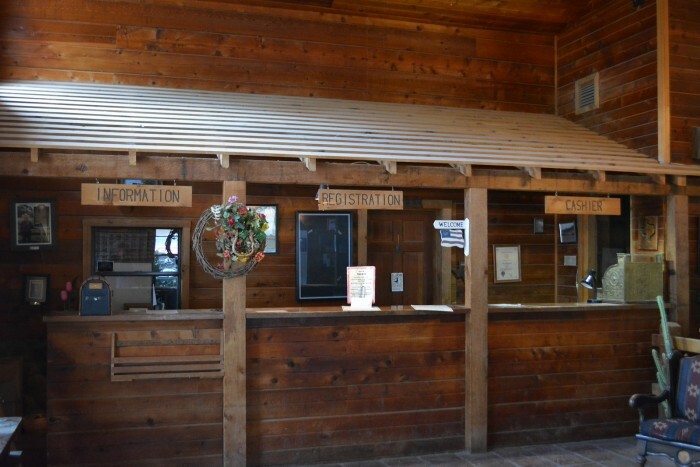 Check-in was friendly and easy, what would be expected at a busy tourist park. 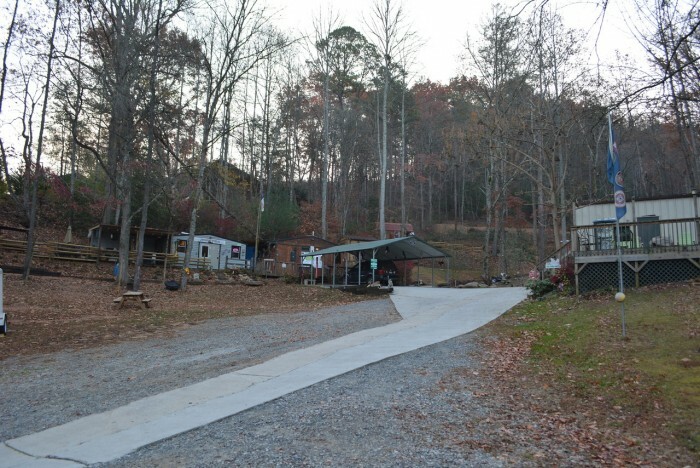 The roads are paved and easy to navigate, and the sites are level concrete pads, though they are tightly packed together. 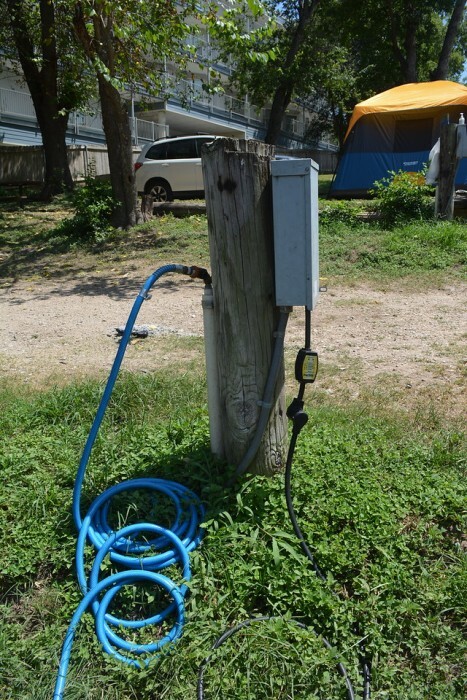 Hook-ups were centrally located on the sites, appeared to be fairly new, and all worked as expected. 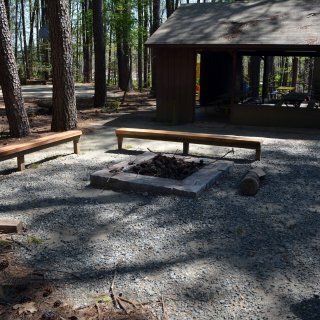 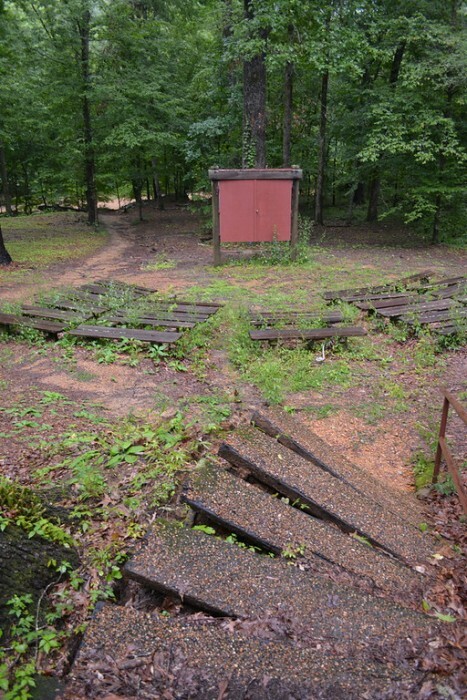 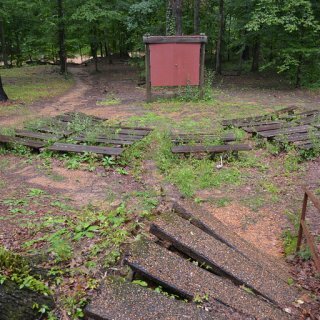 The site includes a patio, picnic table, and charcoal grill, but no fire pit. 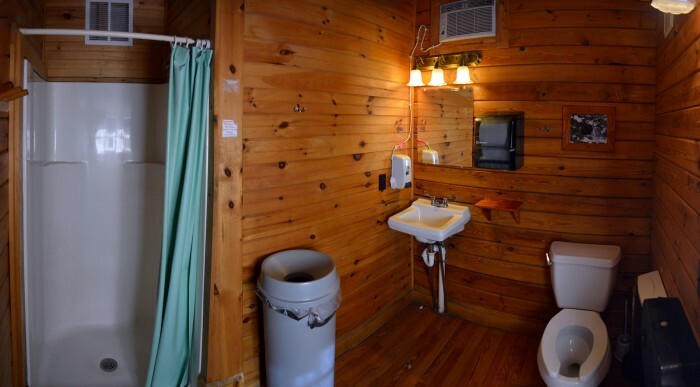 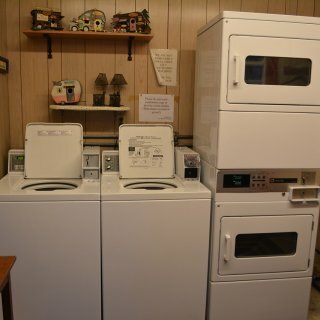 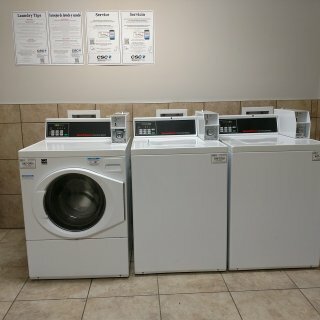 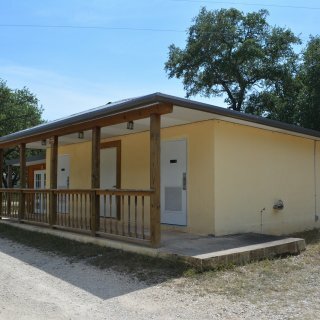 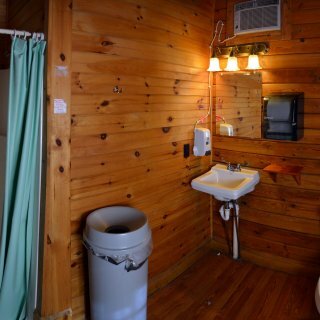 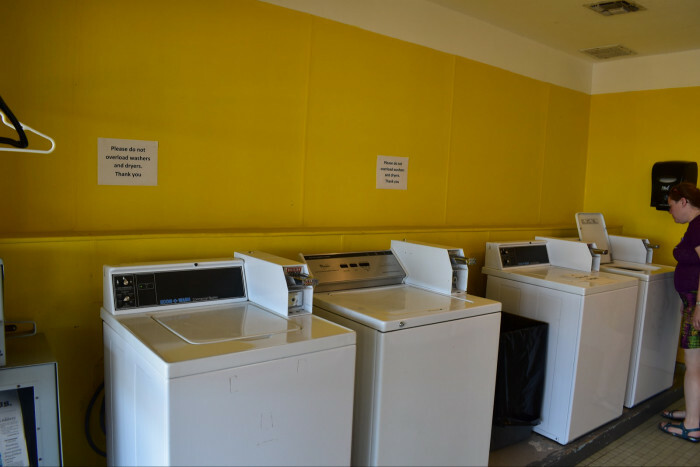 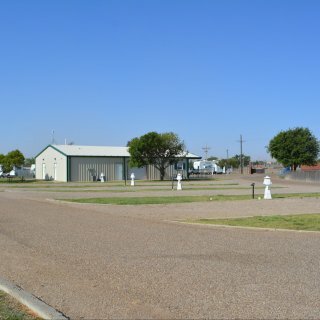 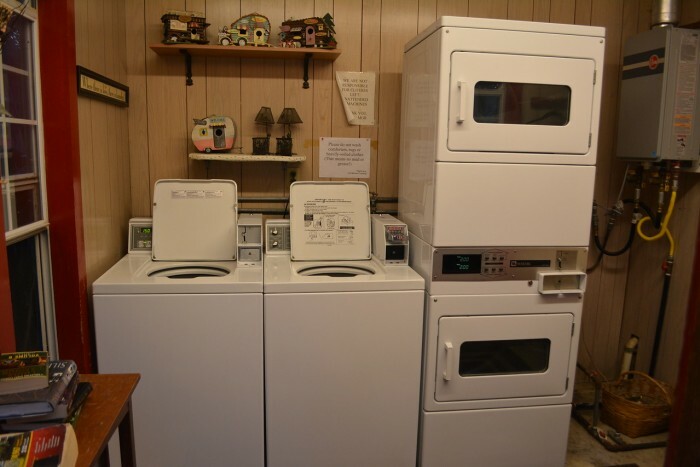 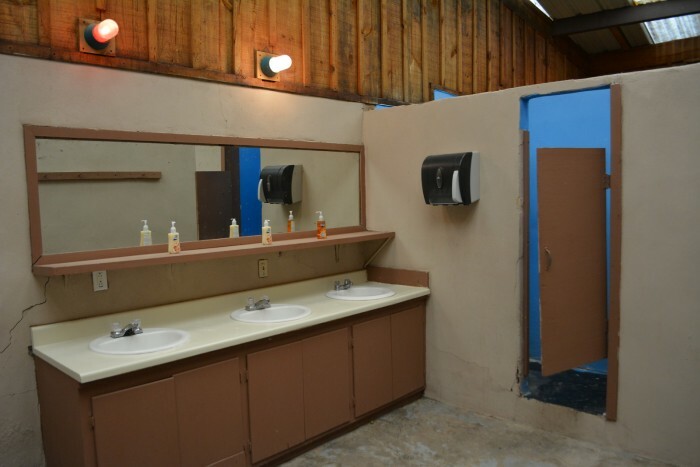 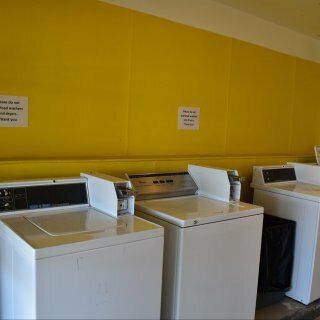 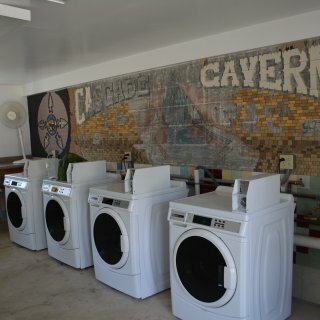 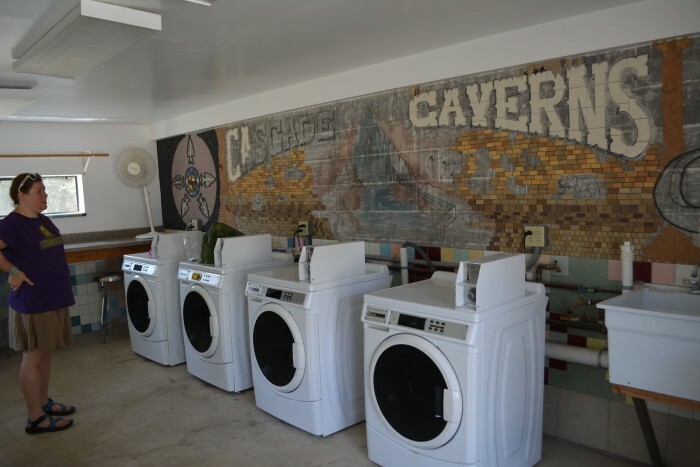 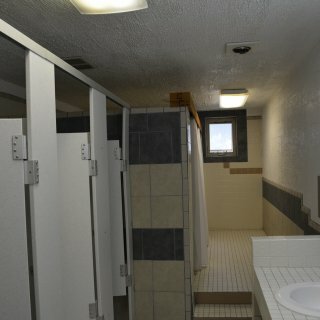 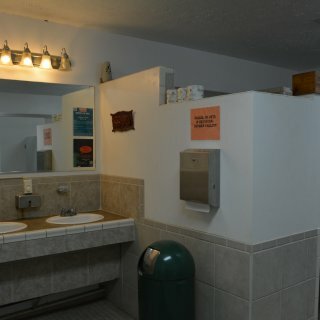 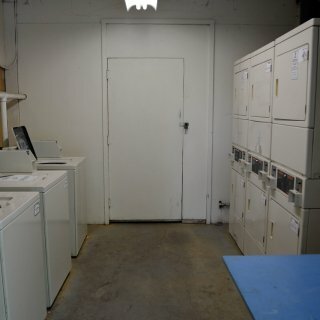 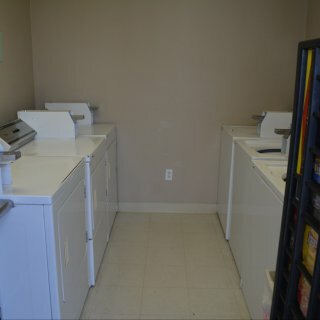 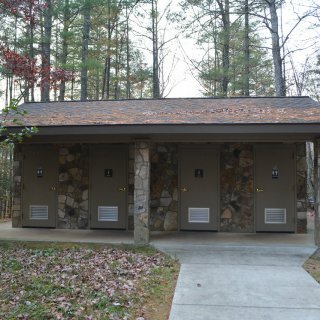 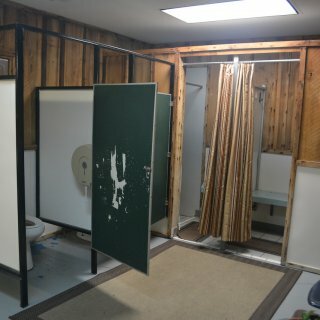 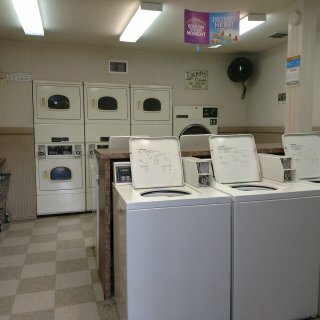 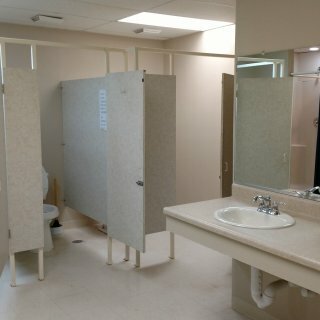 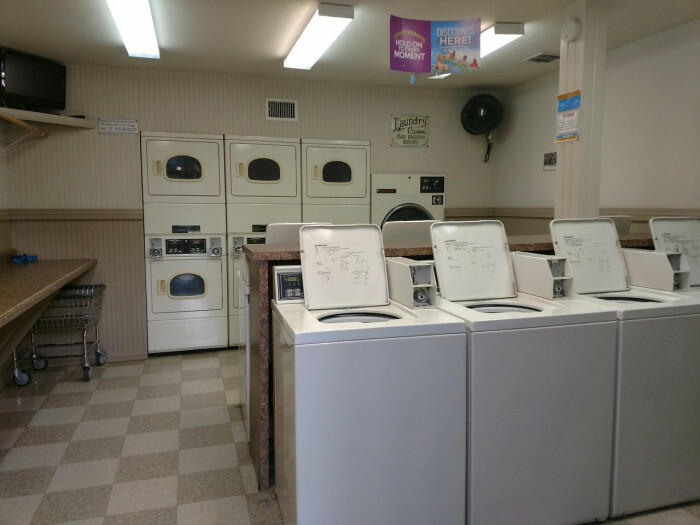 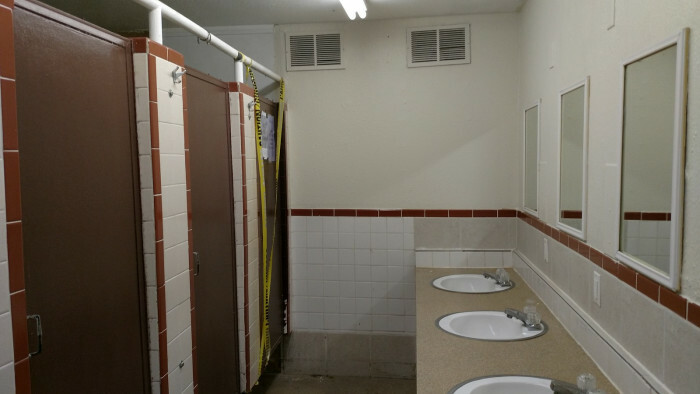 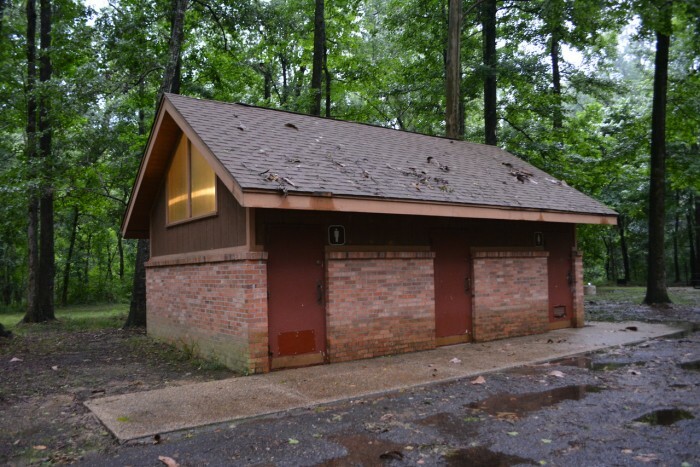 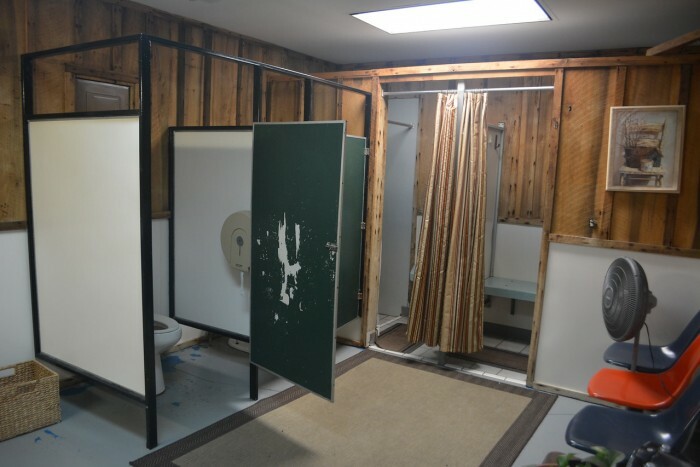 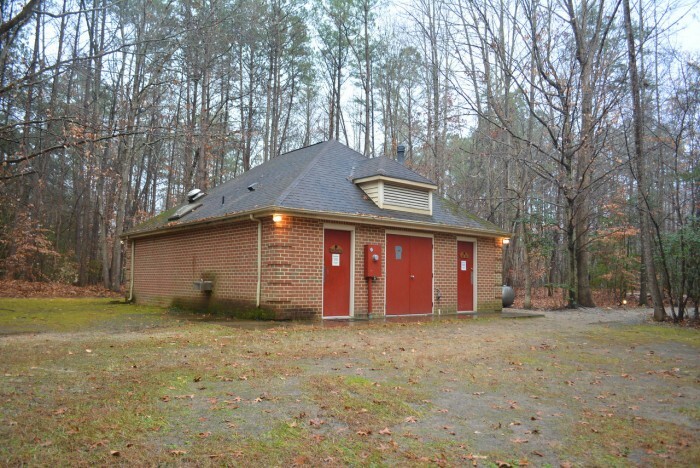 Amenities at the park are limited and basic, there is a small, clean laundry, and the shower house was basic but clean. 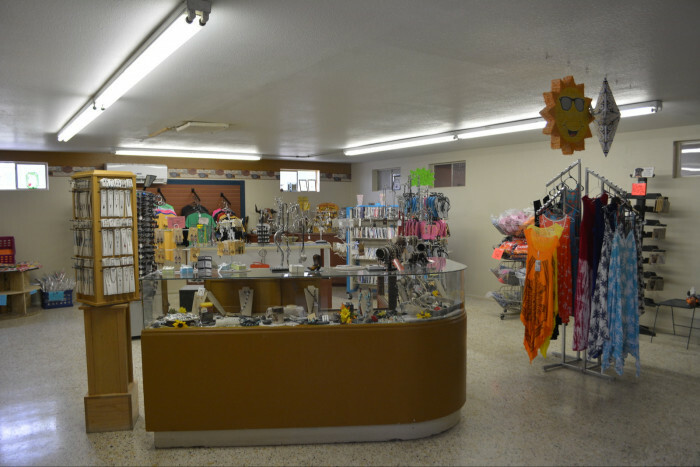 They also have a small store which carries mostly souvenirs. 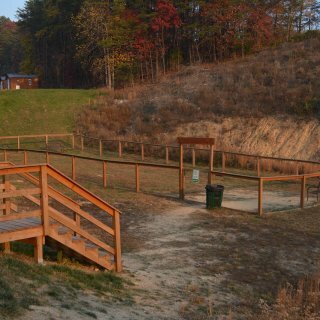 The park's real attraction is the beach, which is just over a sand dune and accessed by a walkway. 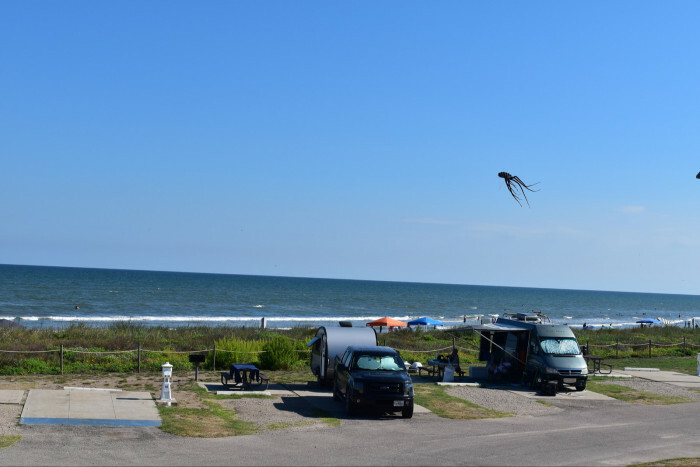 A walk along the beach, dipping your toes into the warm gulf waters is a must. 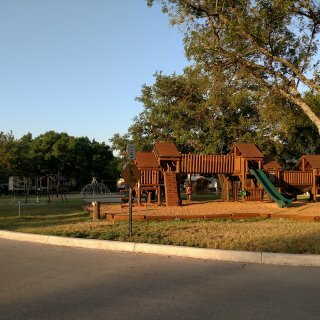 We would love to return to this park again. 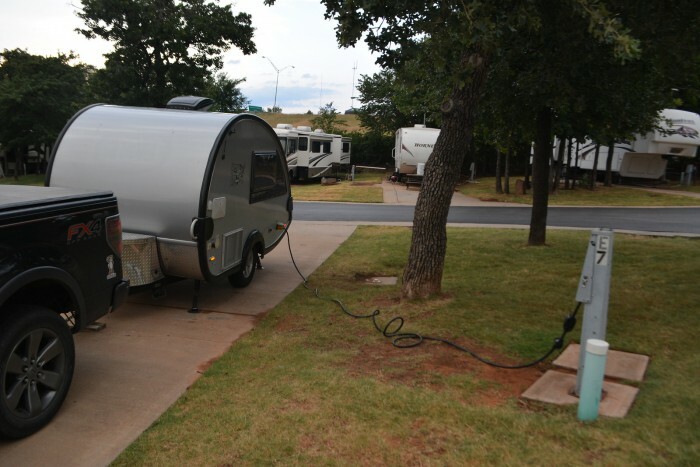 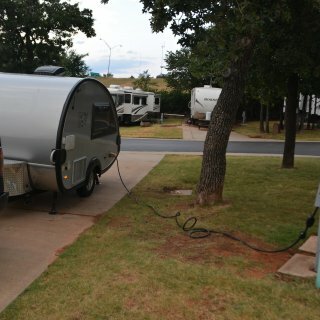 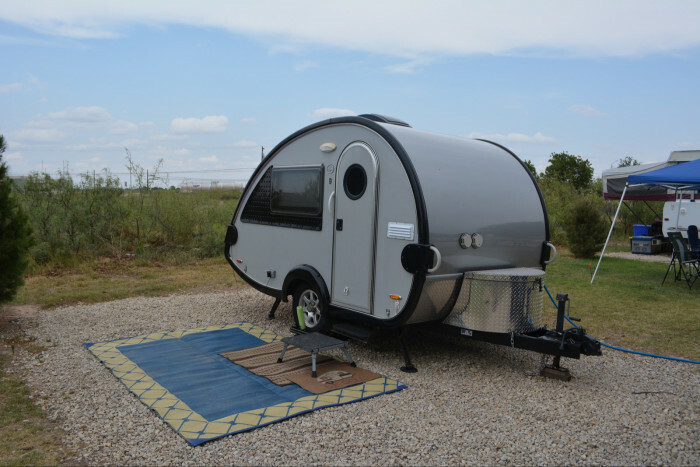 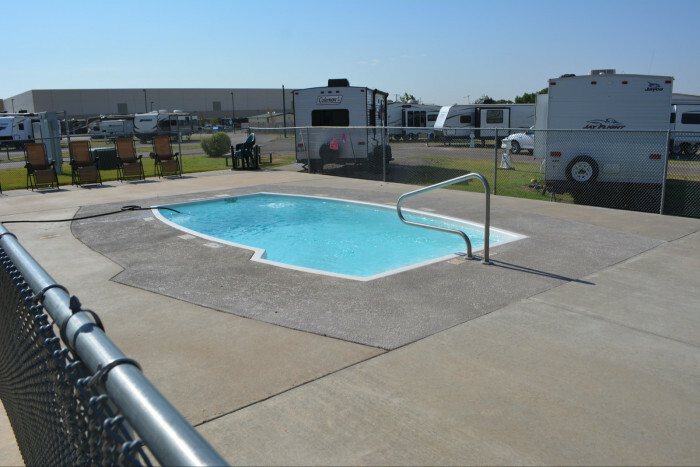 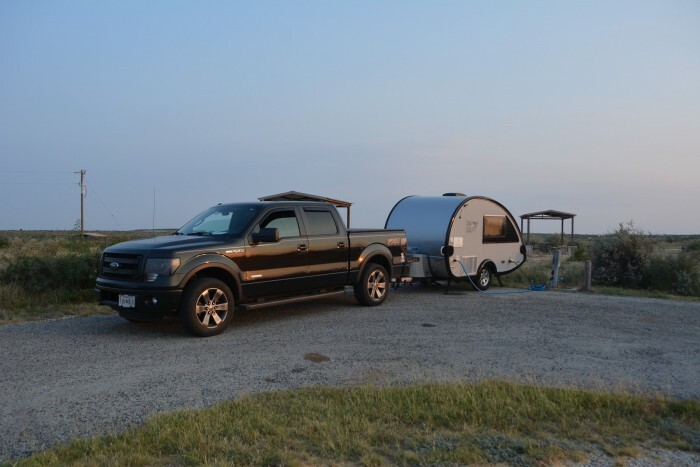 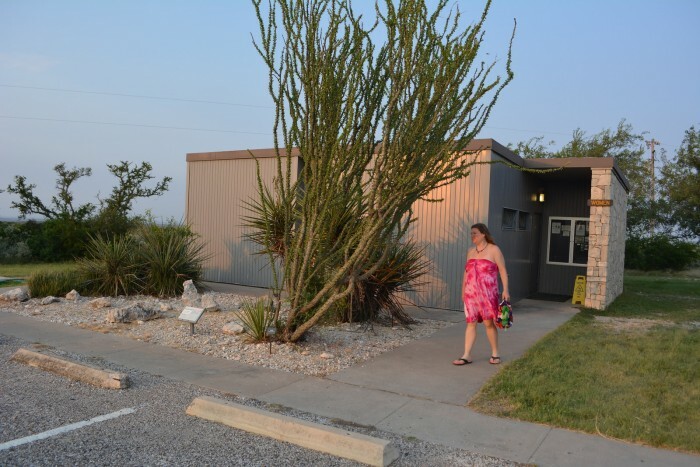 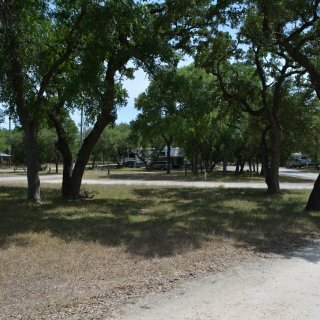 We camped at Dellanera RV Park in a Travel Trailer. 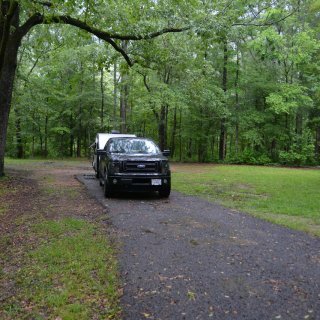 One of the nicest state parks we have ever stayed in, though a bit pricey, the park offers many amenities. 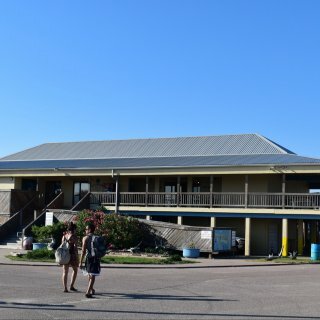 Check-in was easy, we were early but the friendly host was able to check us in to a different site than we were originally assigned as it was not yet vacated. 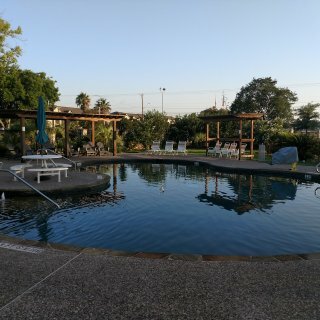 We stayed just one night, but she said we would want to stay longer, and she was right. 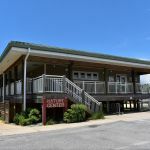 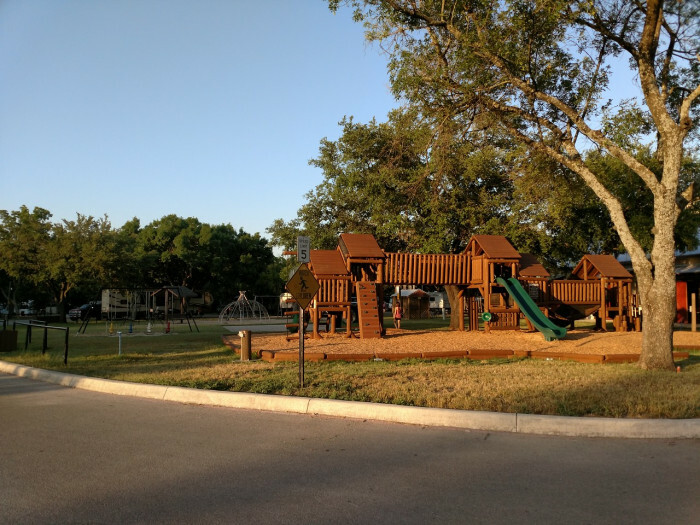 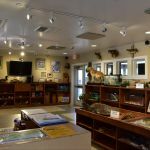 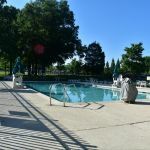 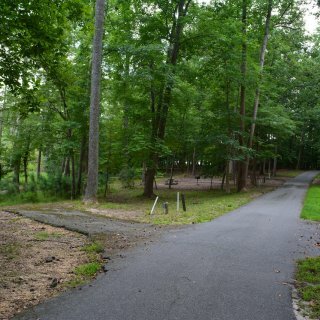 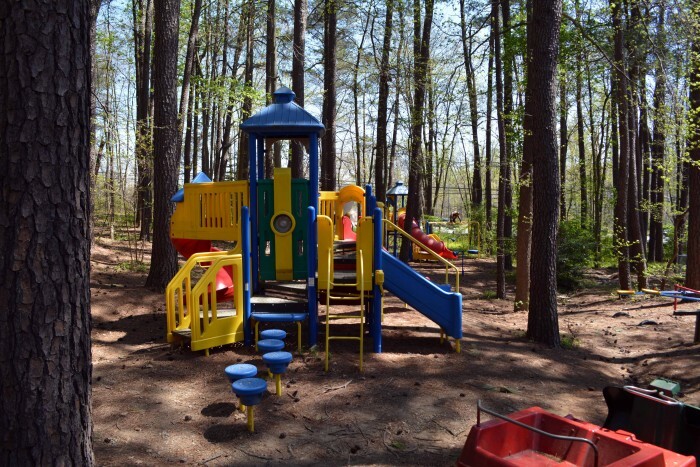 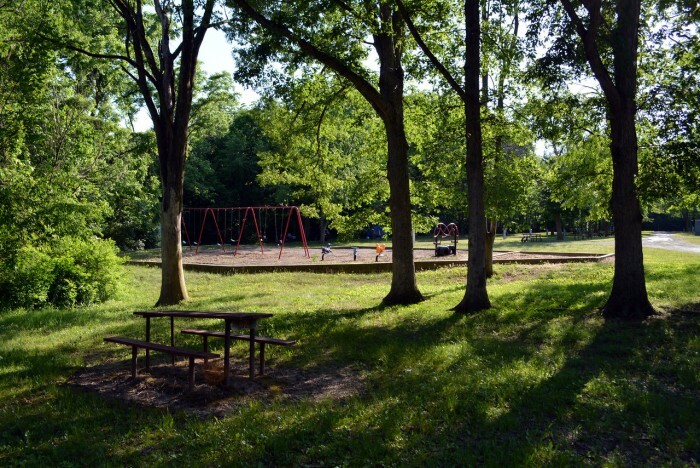 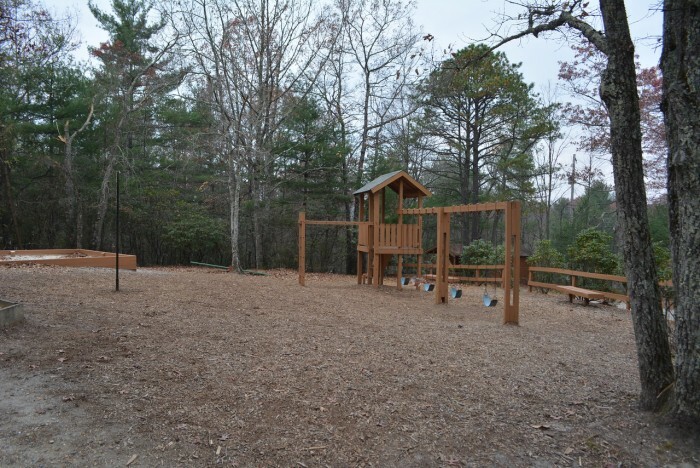 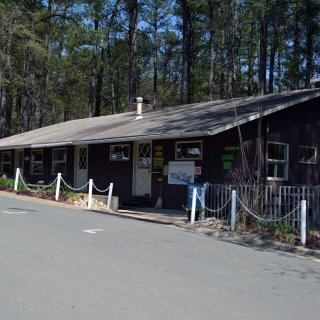 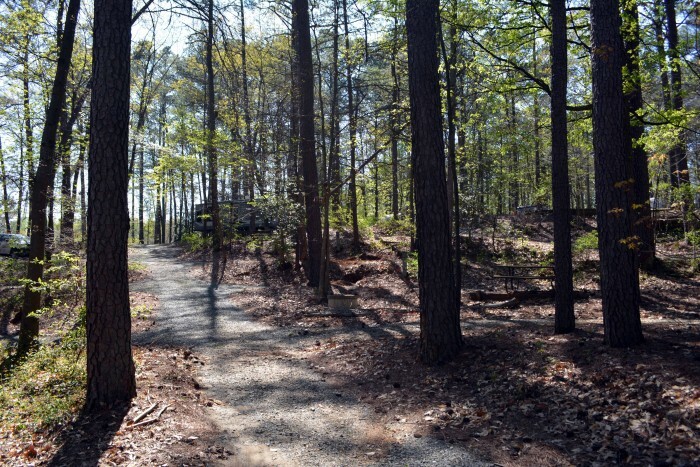 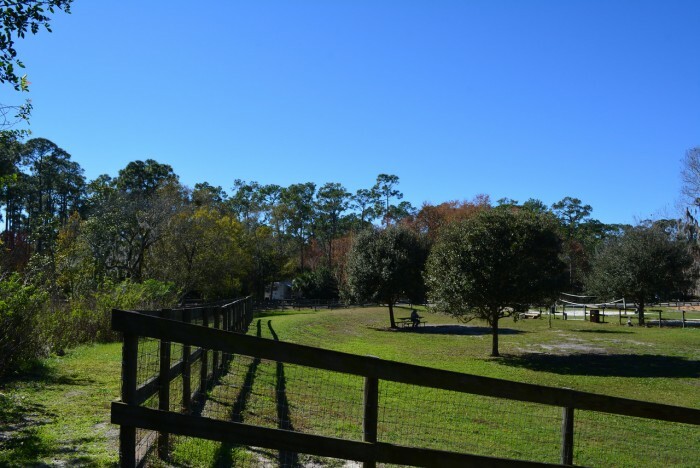 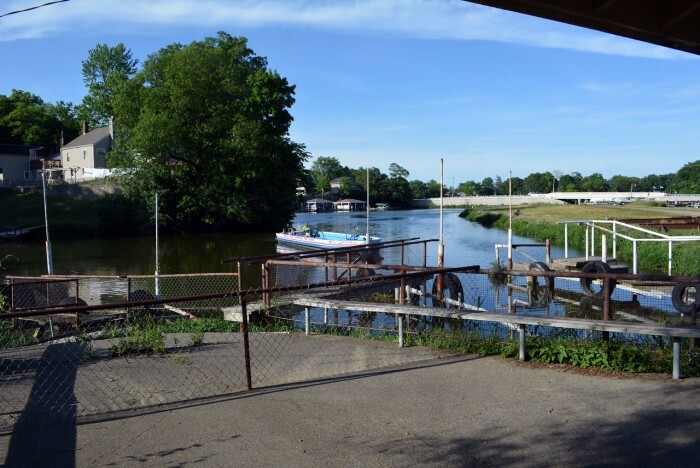 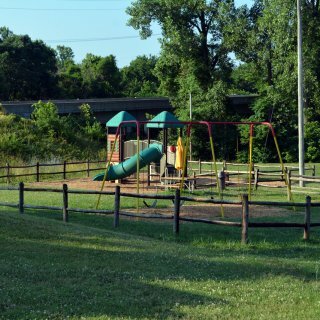 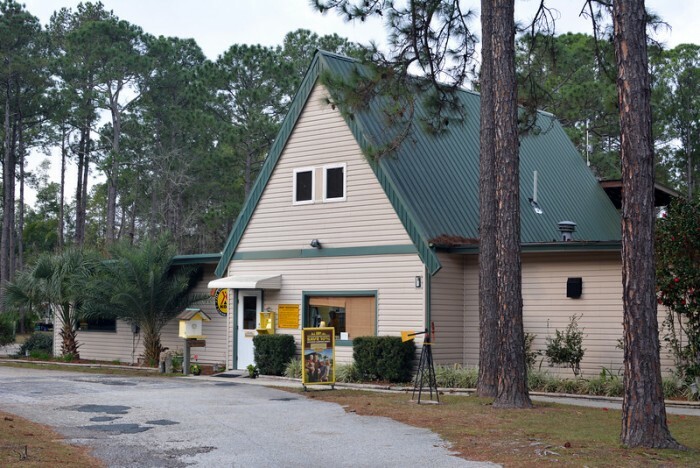 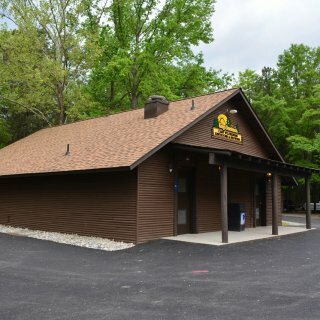 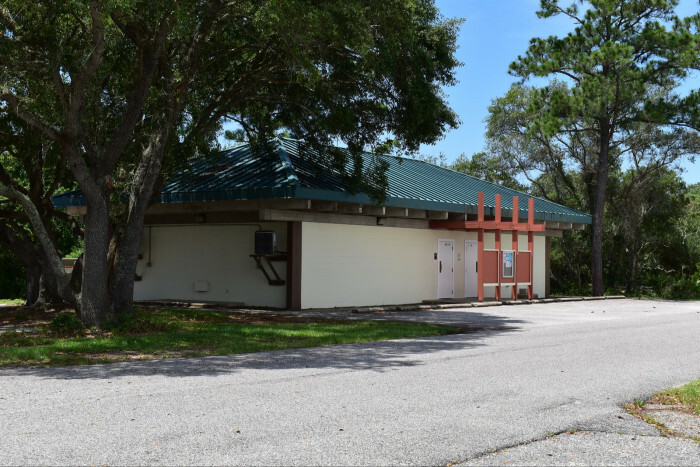 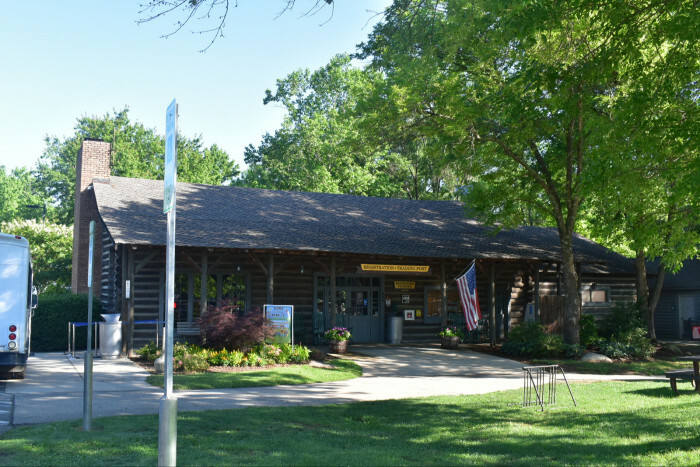 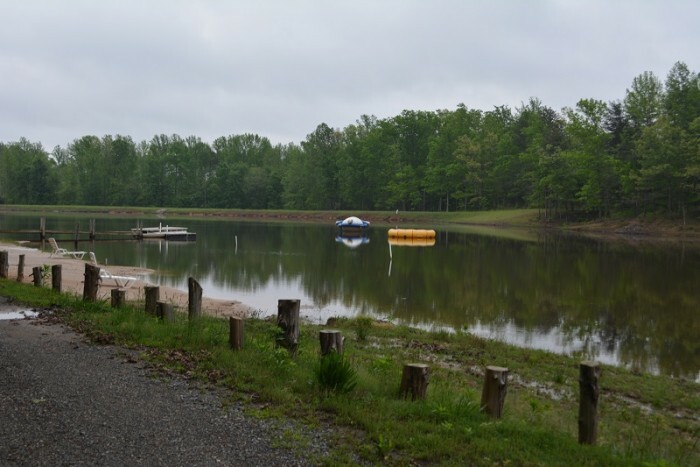 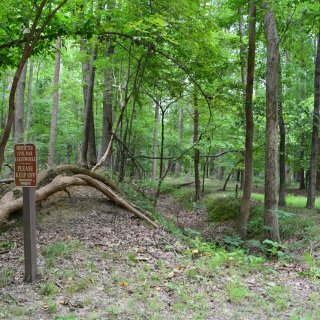 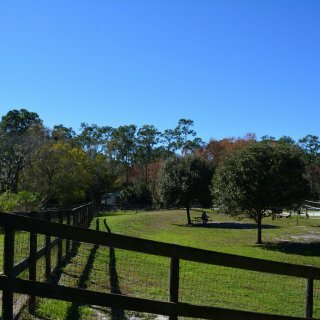 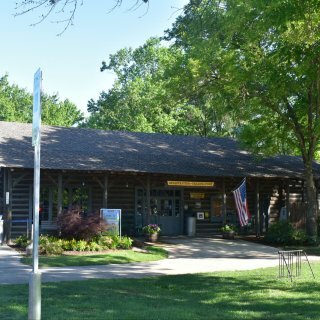 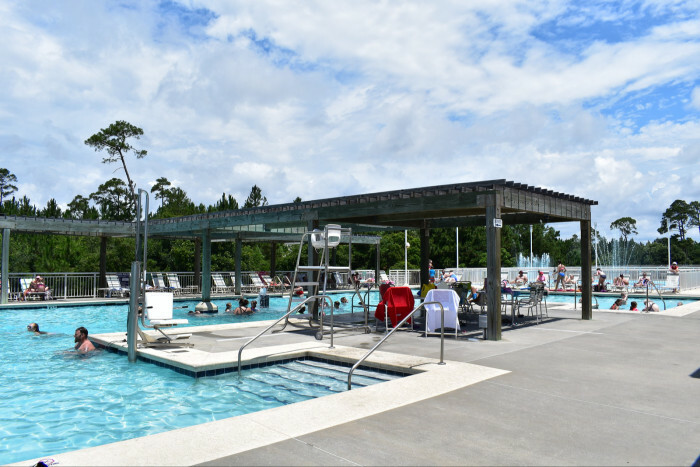 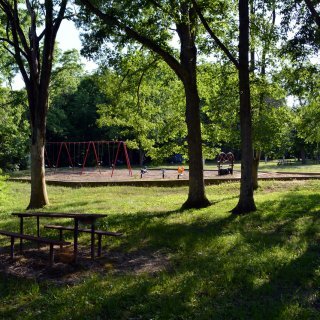 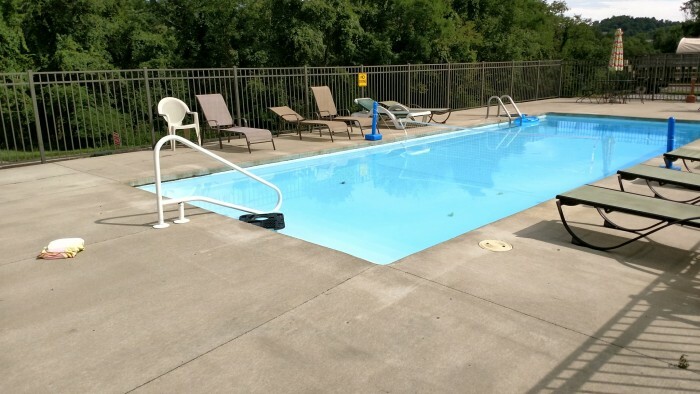 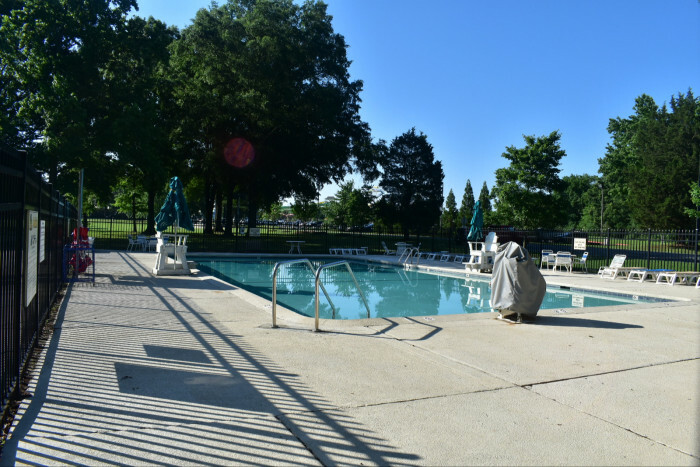 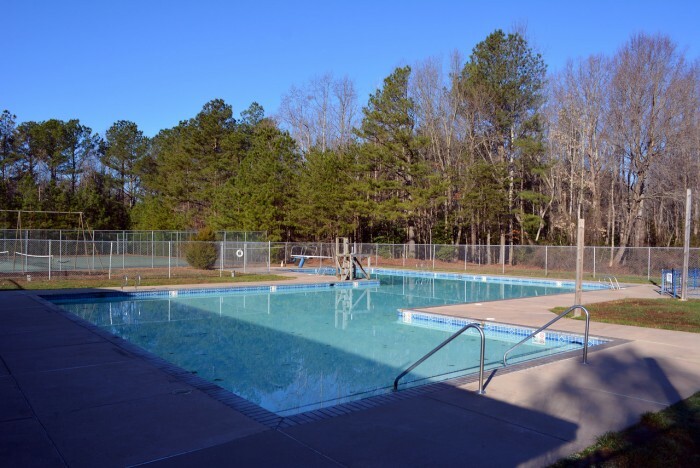 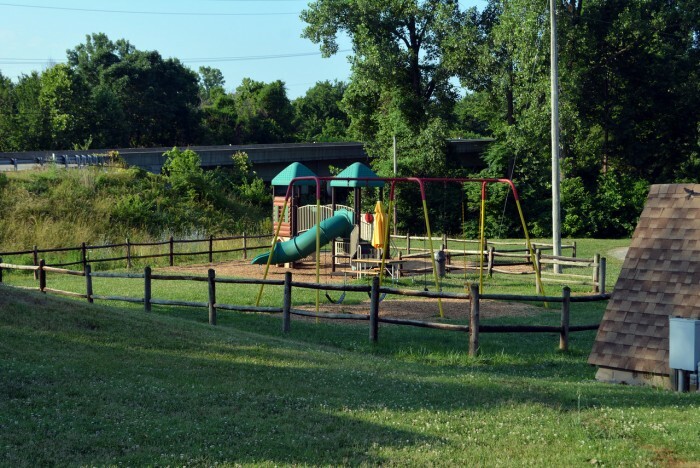 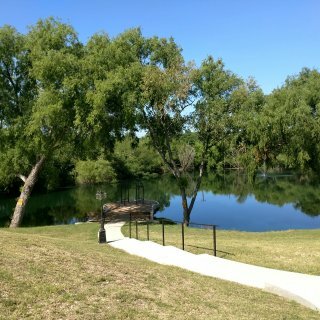 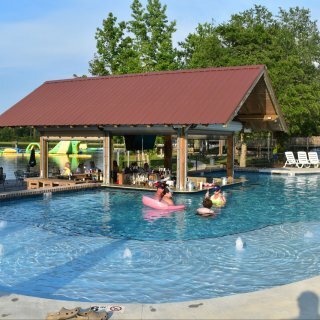 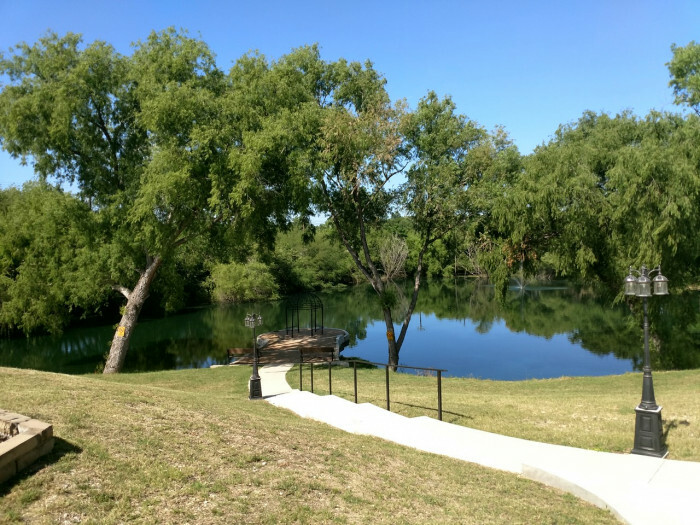 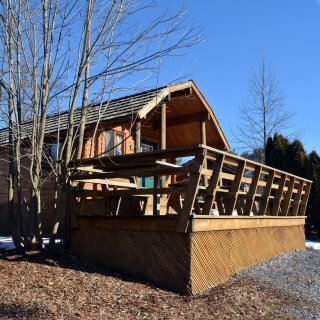 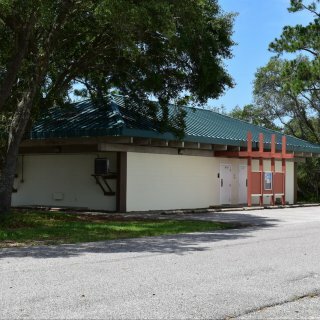 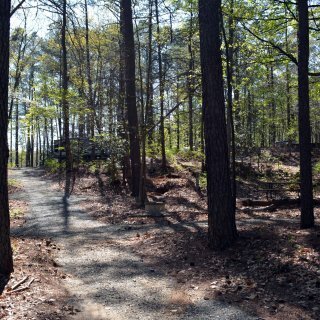 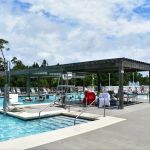 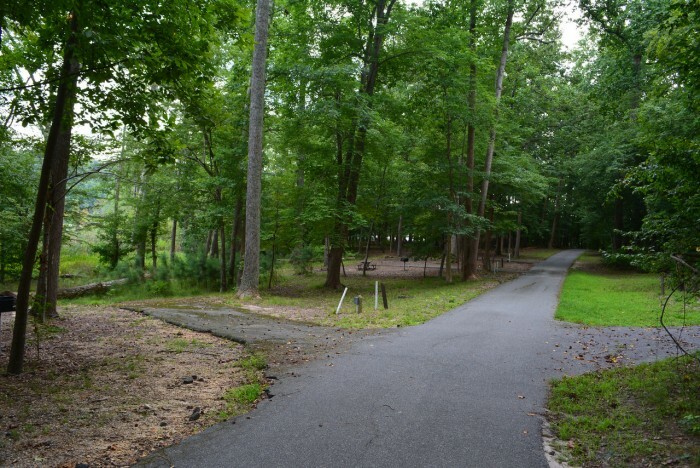 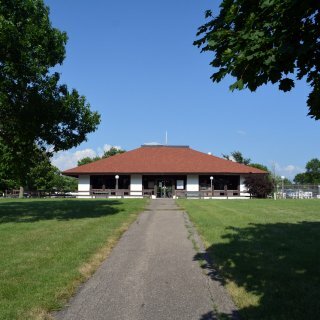 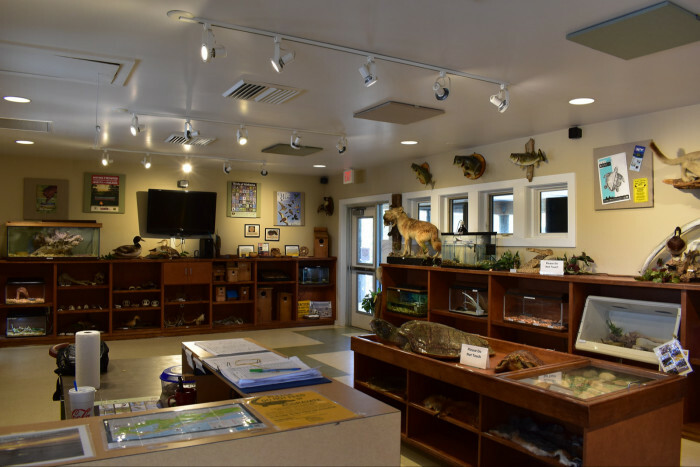 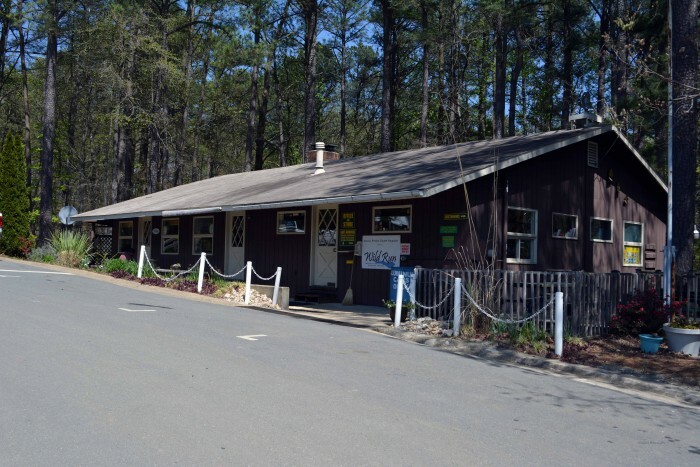 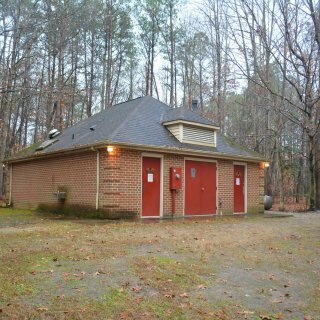 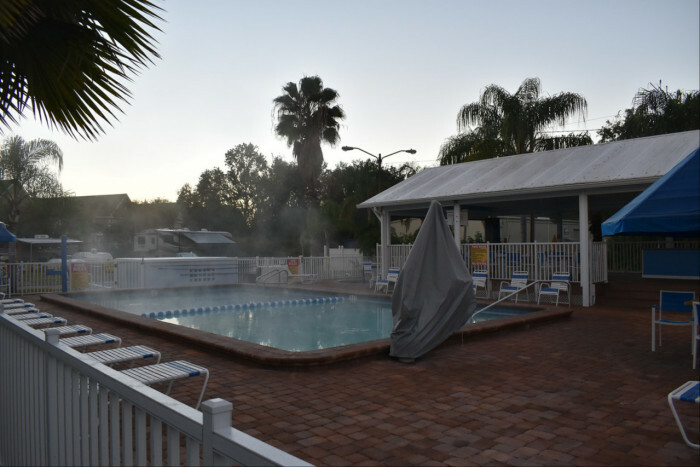 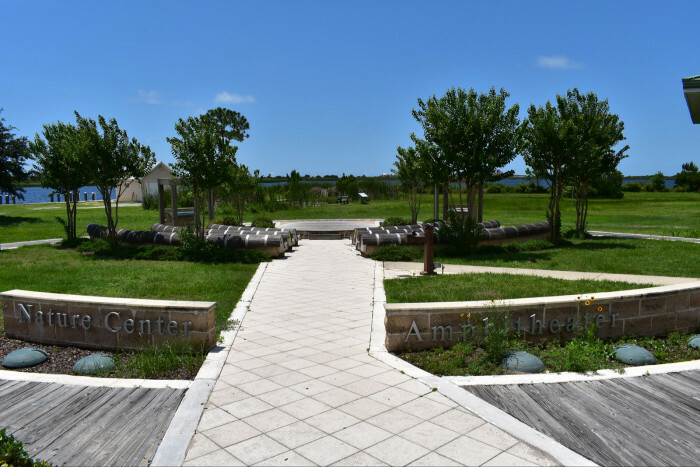 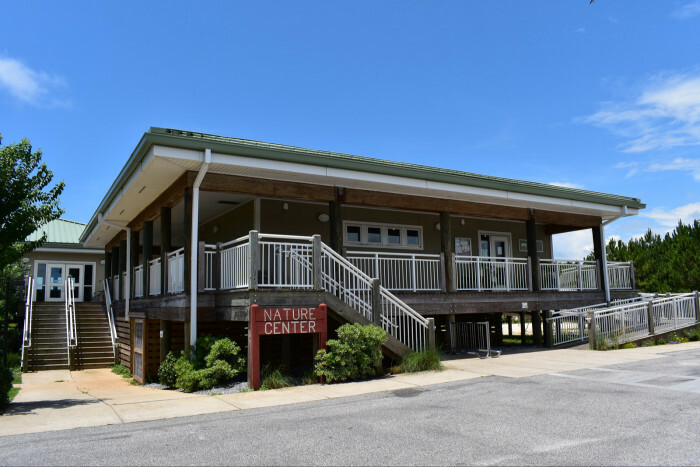 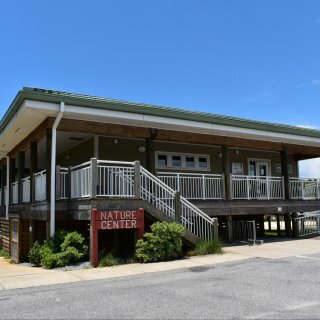 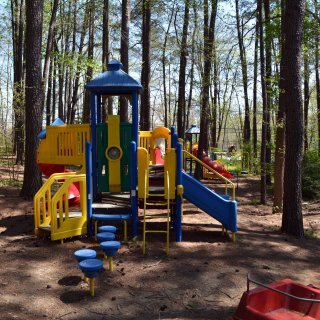 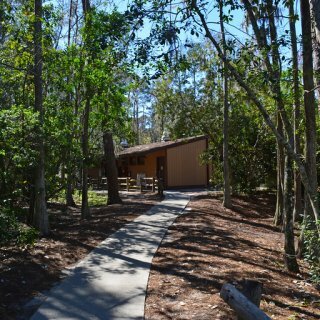 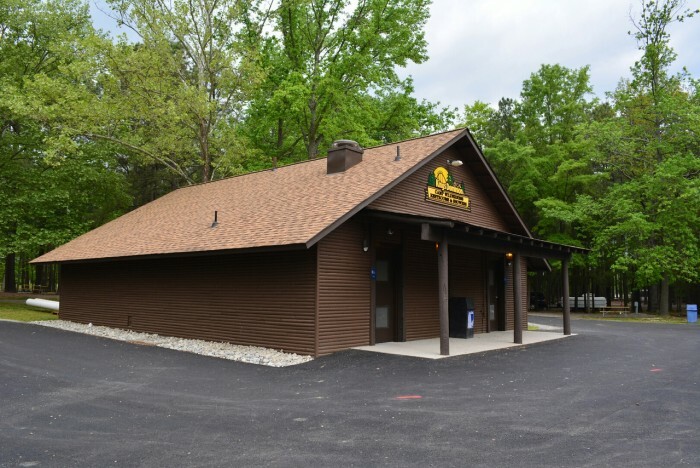 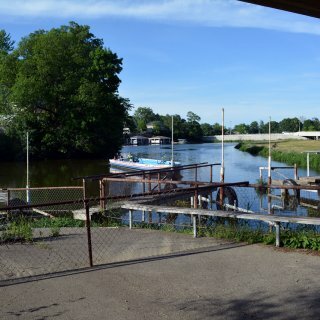 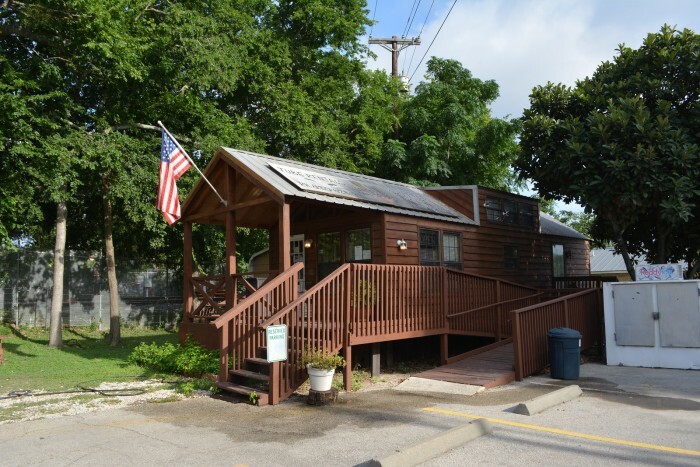 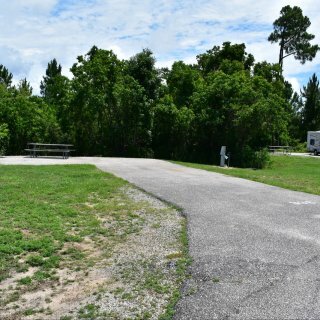 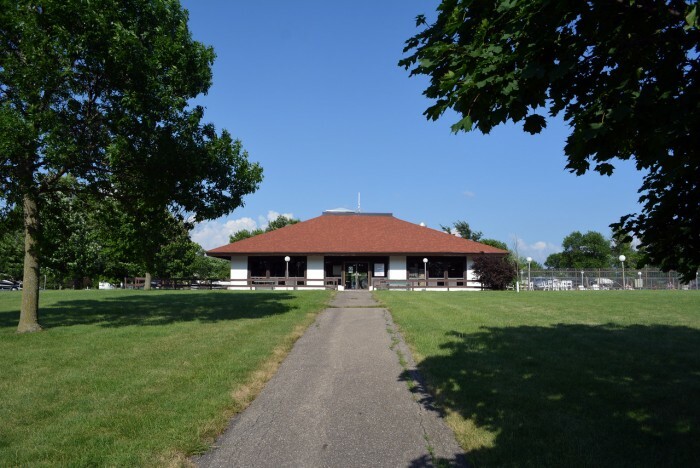 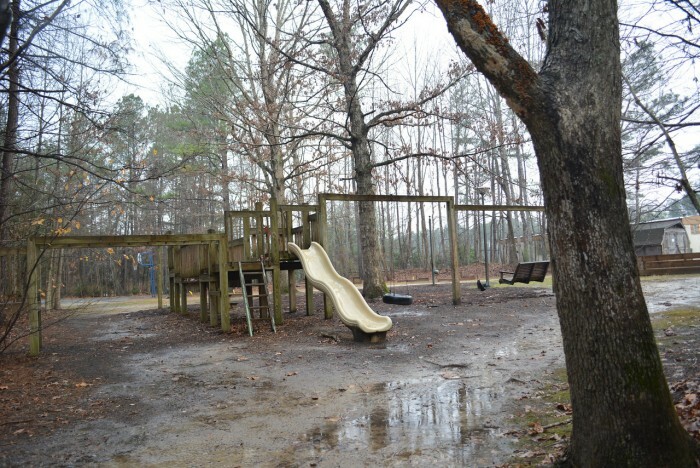 The park has a beautiful pool, nature center, walking trails, fishing pier, beaches, a lake with boat rentals and amphitheater, all meticulously maintained. 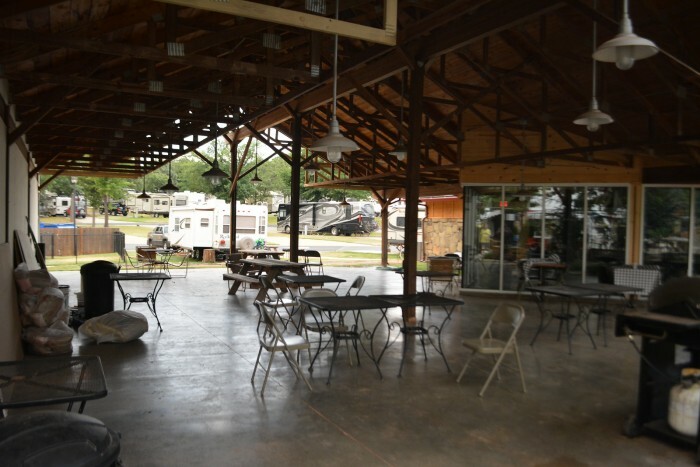 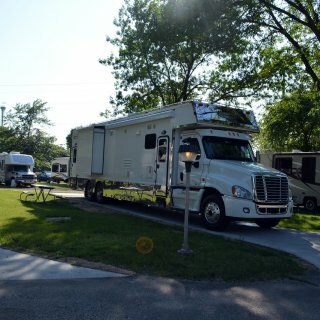 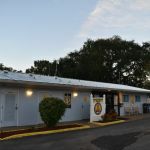 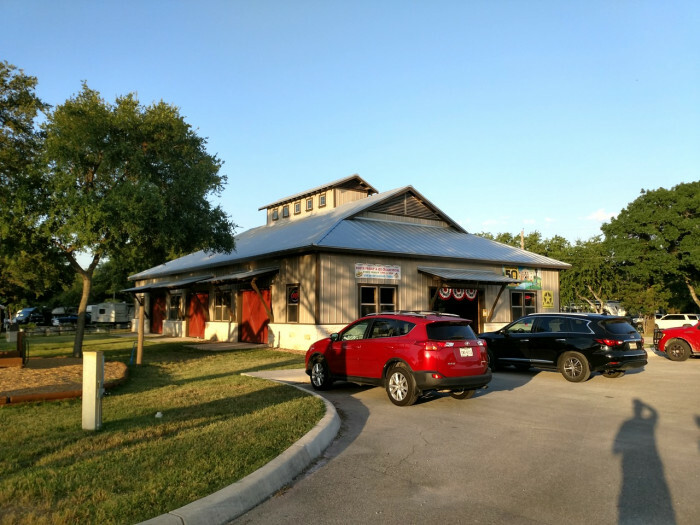 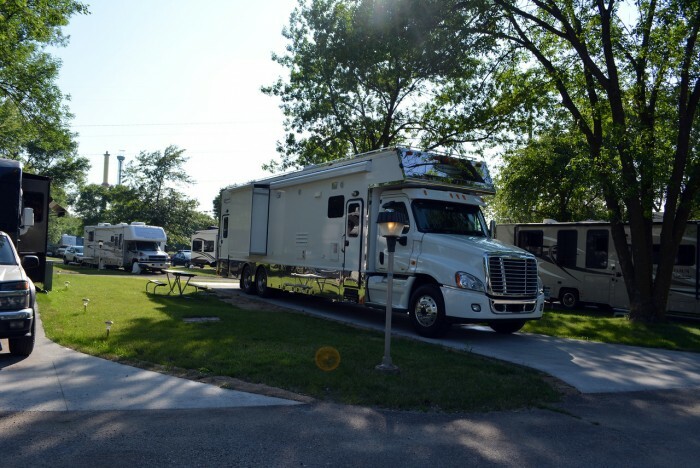 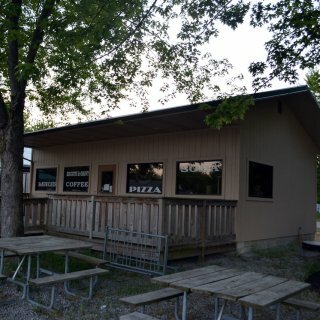 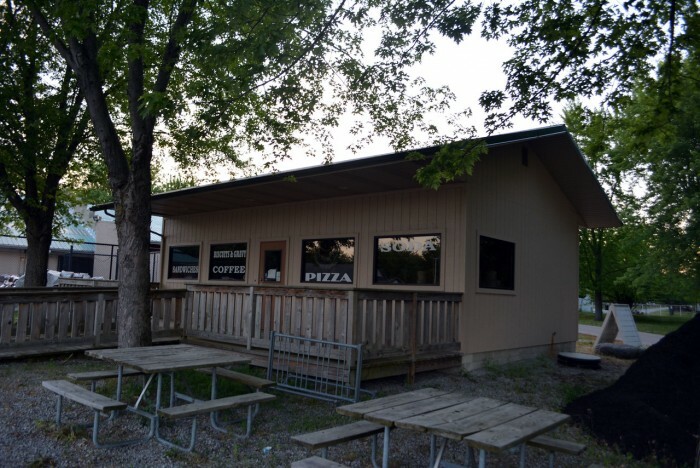 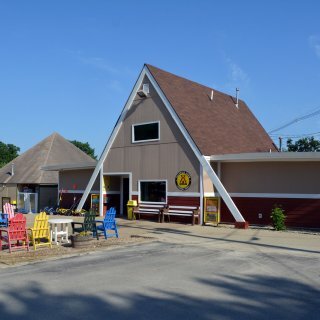 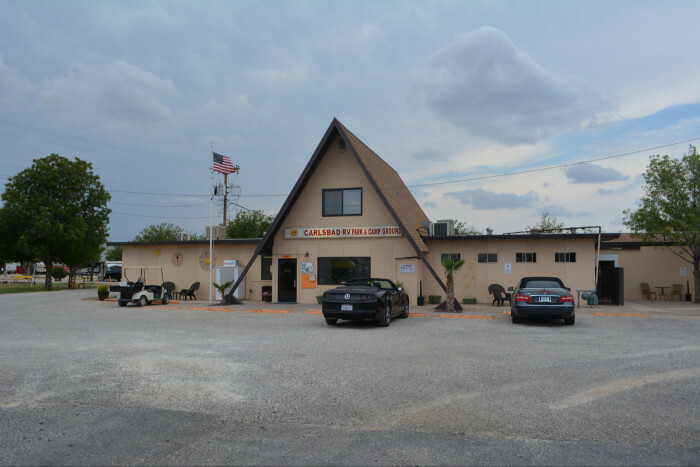 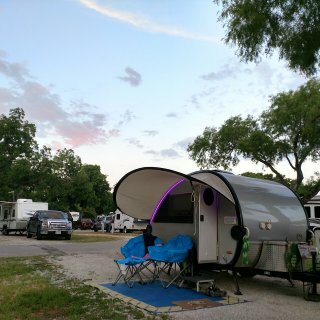 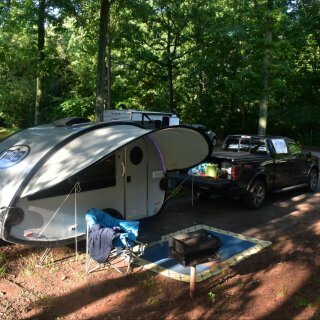 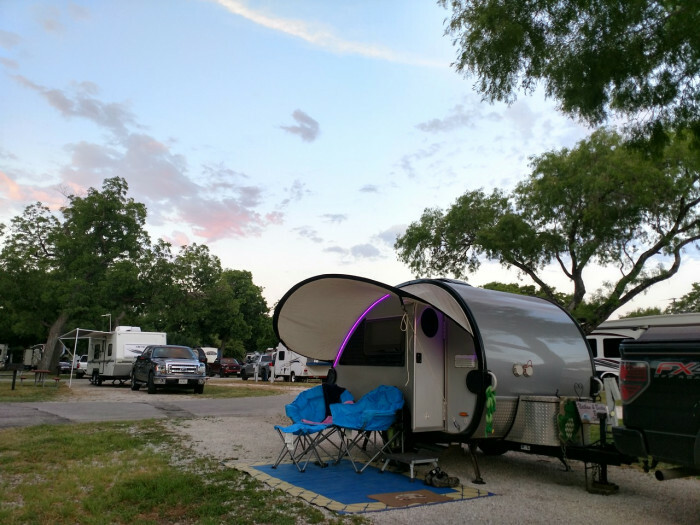 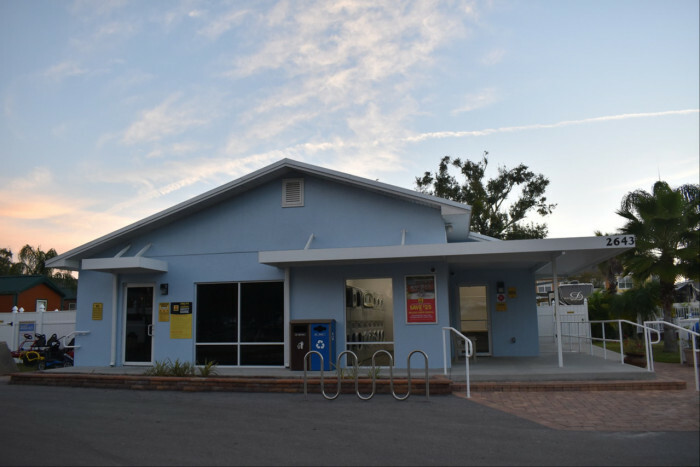 The roads were easy to navigate and sites generous, with a mixture of open and shaded sites, all paved to include a patio space, and centrally located hook-ups. 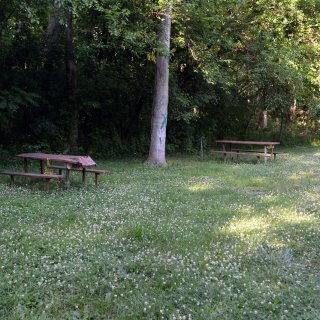 There was a picnic table but no fire ring. 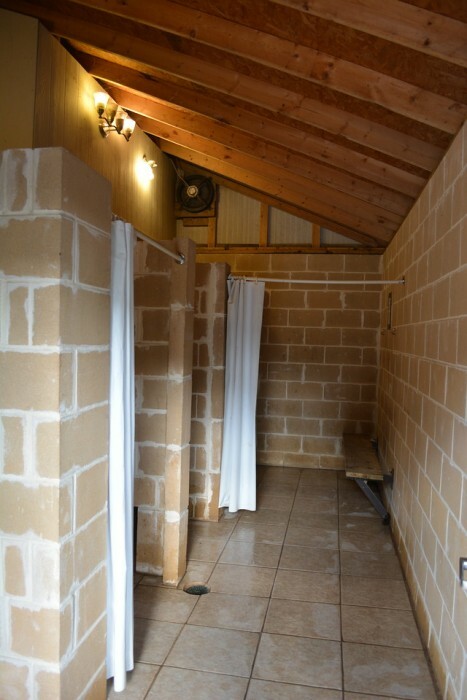 Shower houses were spartan, but spacious and spotlessly clean. 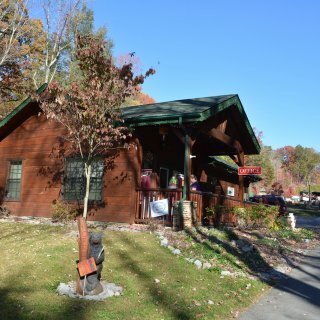 We enjoyed our single night and would stay again. 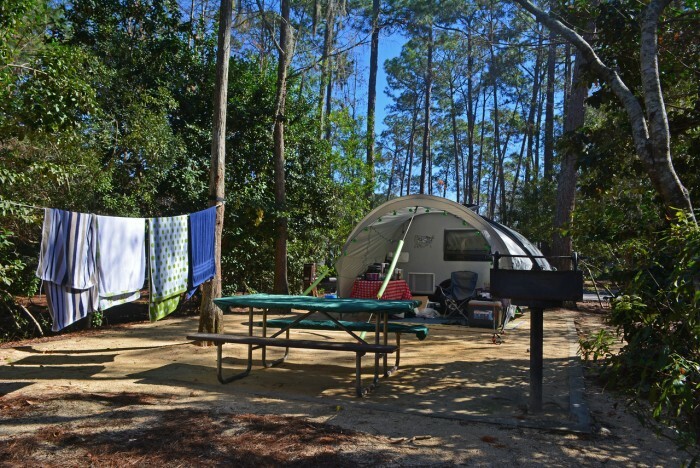 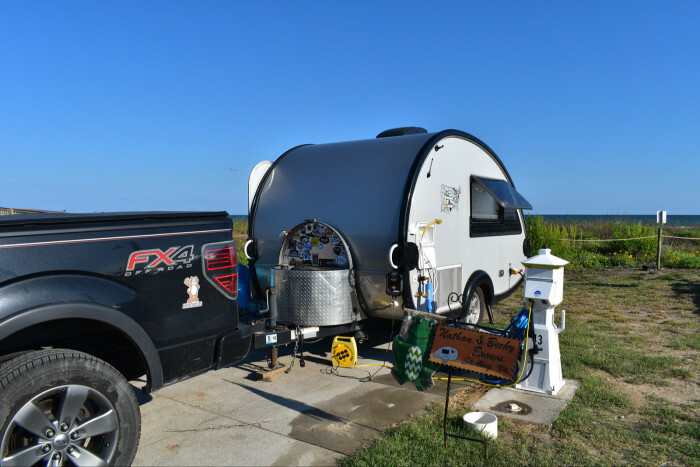 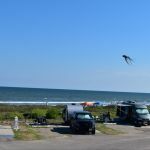 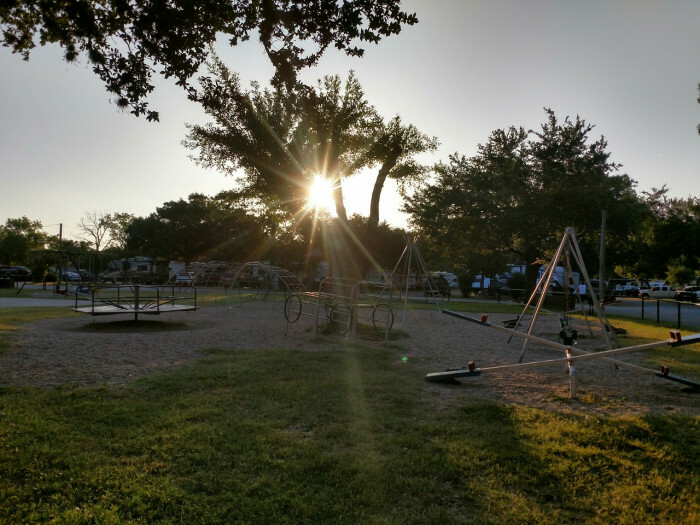 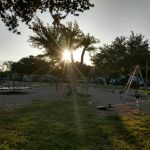 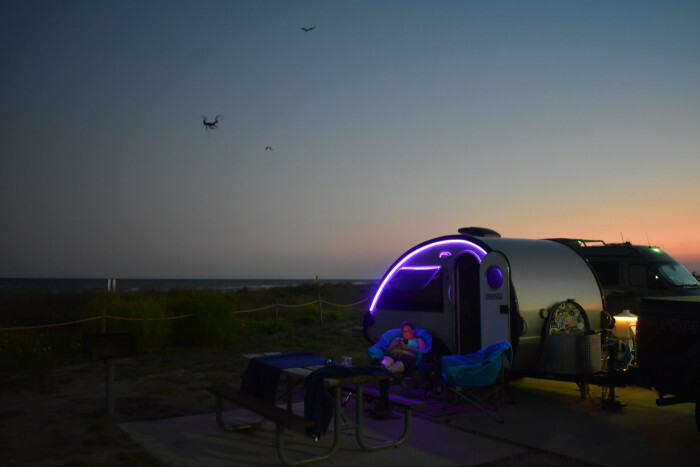 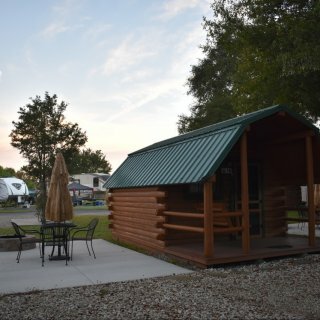 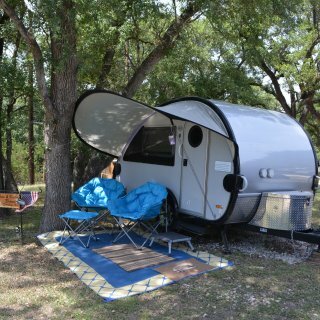 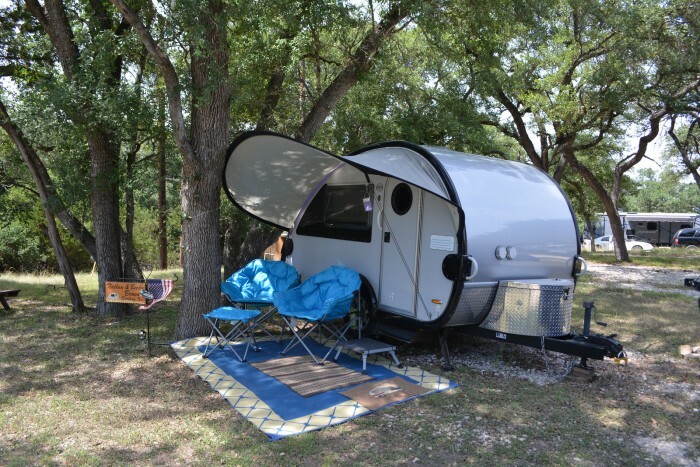 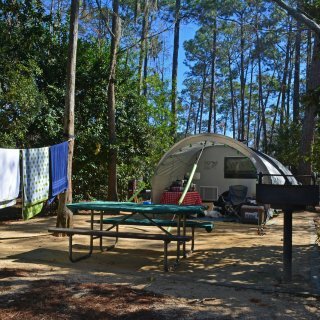 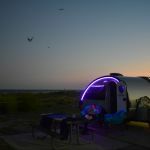 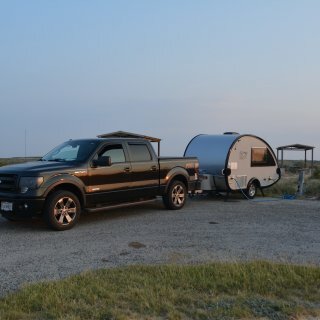 We camped at Gulf State Park Campground in a Travel Trailer. 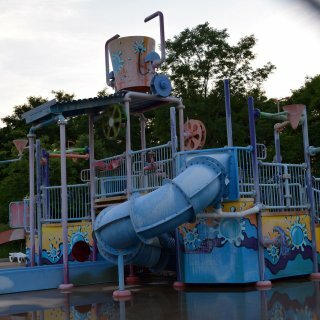 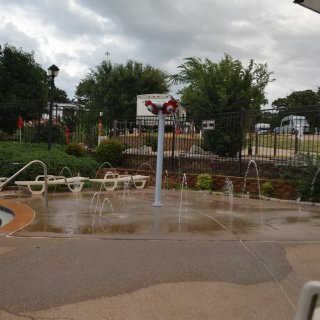 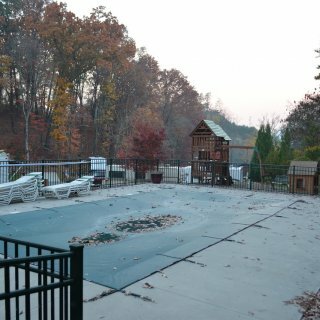 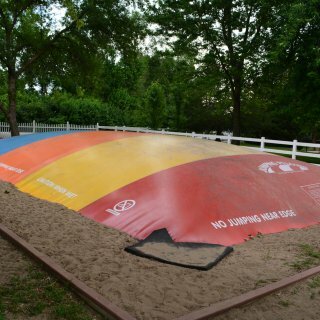 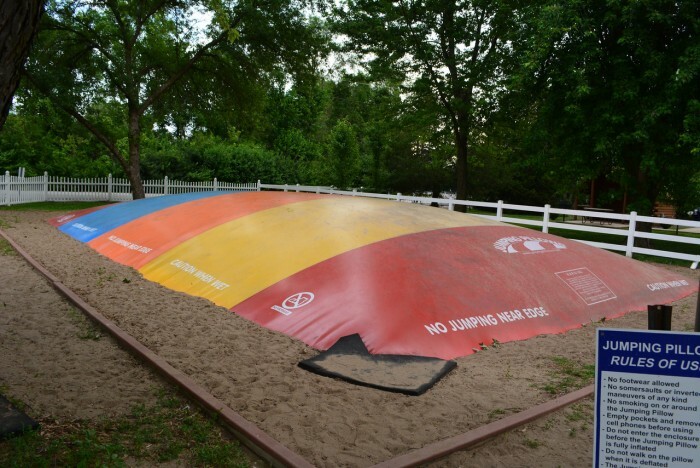 This is a resort quality park with some amazing features and amenities, but also with a few nagging issues. 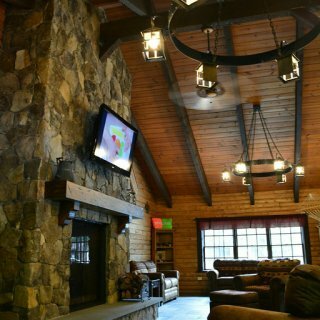 Check-in was a breeze and we were guided to our site. 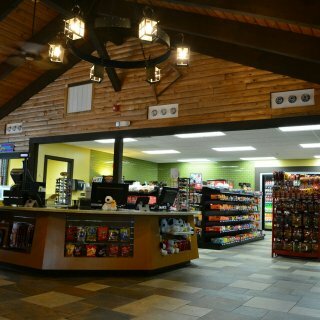 The staff as a whole was very welcoming and friendly. 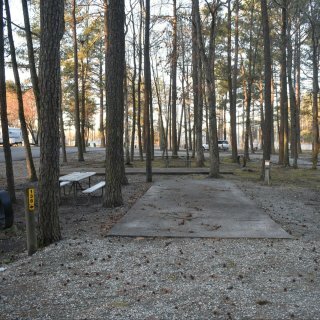 All sites are level concrete pads, not a bad site there. 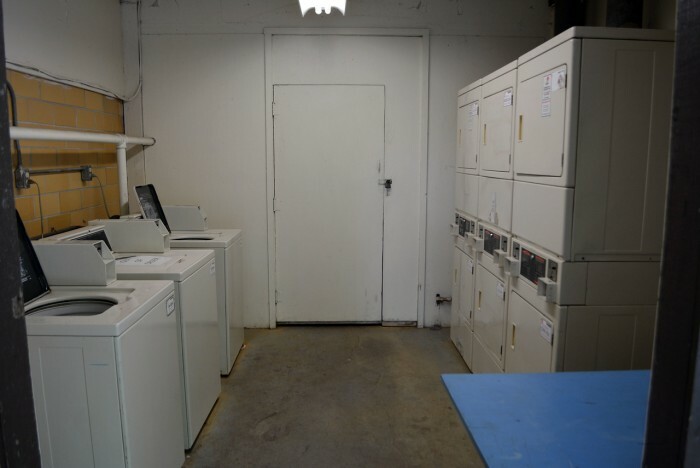 The pads are large and spaced well, and hook-ups were located well and in good working order. 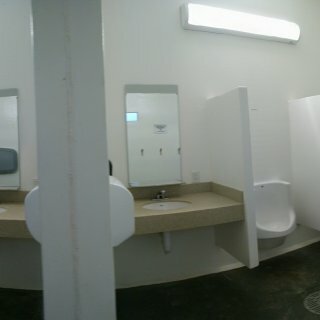 We arrived to find a lot of broken glass in out site, which we had to sweep up before setting up. 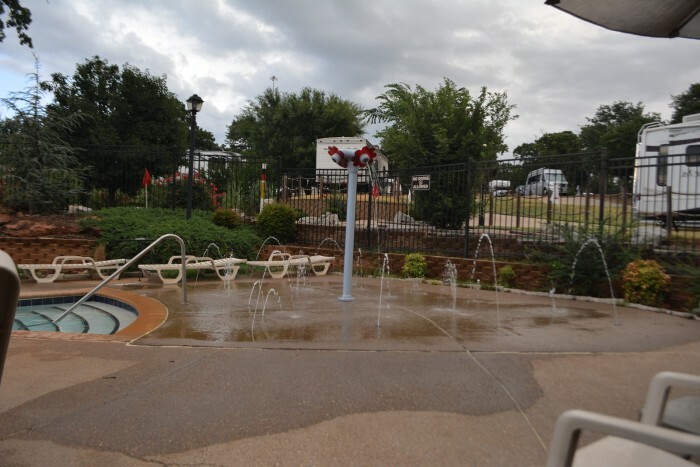 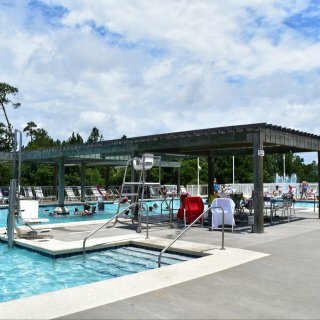 The main feature of the park are the pools and lazy river, which are centrally located. 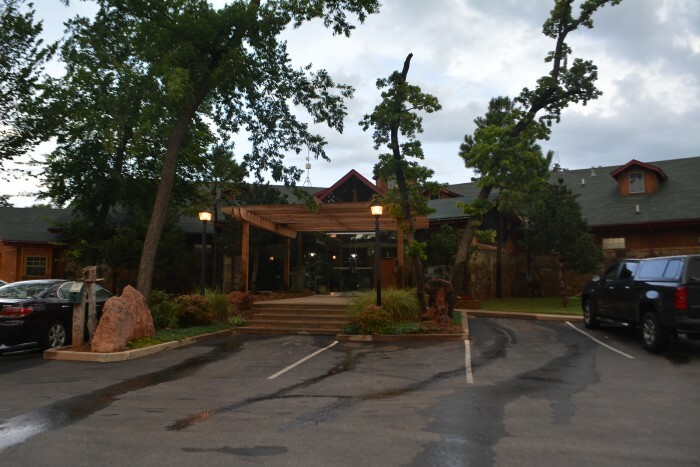 All are open late and included with your stay, and are open to those staying only. 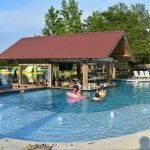 The lazy river is very nice and includes an adults only area with a tiki bar. 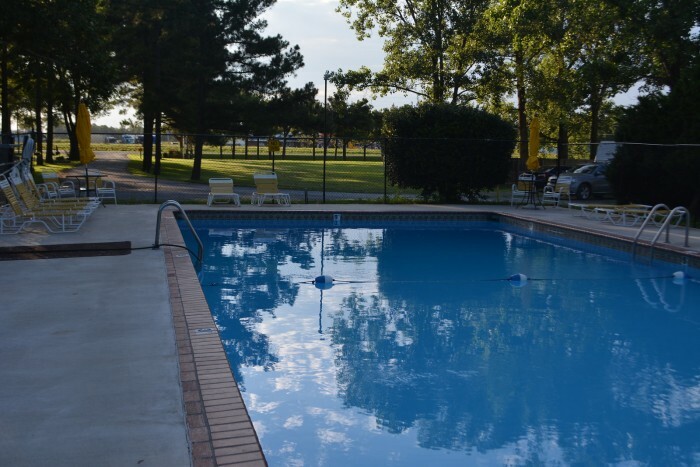 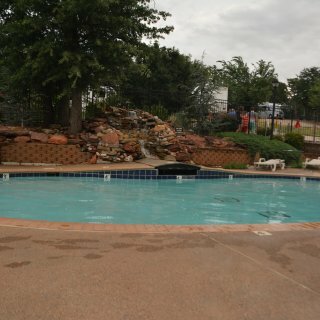 The pools include a family pool as well as an adults only pool, also with a bar. 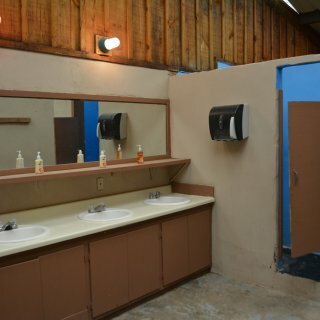 Drink prices were reasonable. 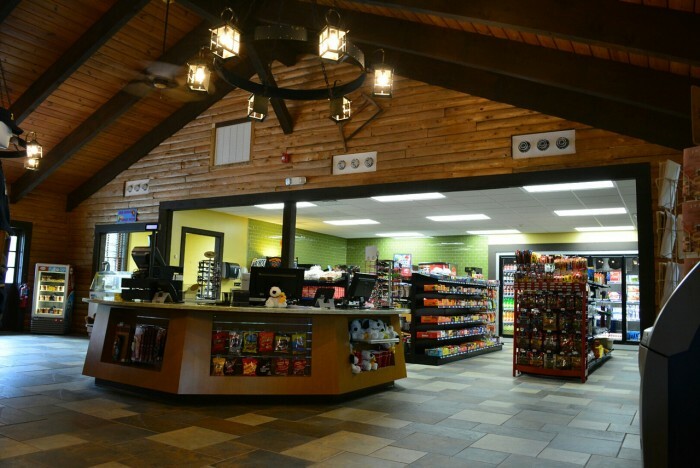 Hot tubs and a snack bar round out the area. 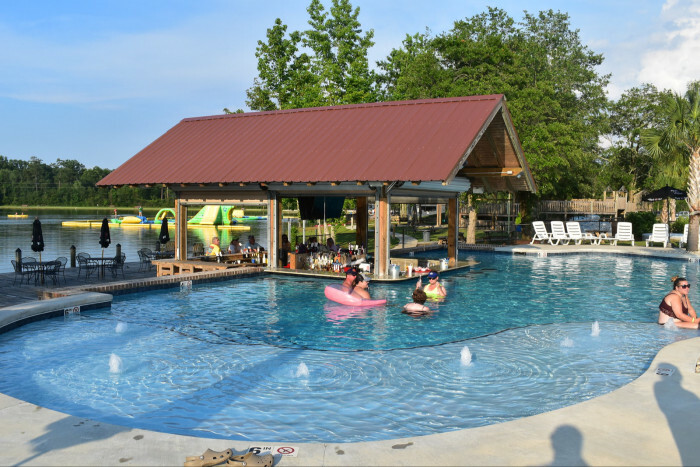 The lake offers more activities, including large floating play structures, which were an upcharge, and boat rentals. 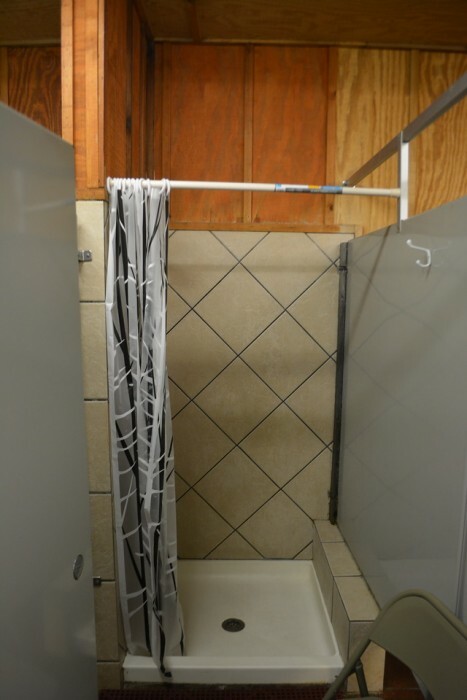 Shower houses were nicely appointed, with individual stalls, but were a mess after a day of kids running in and out. 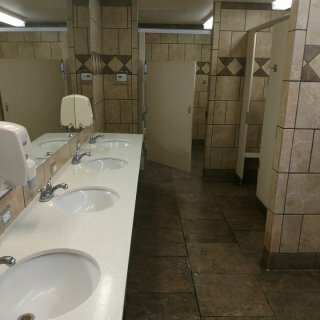 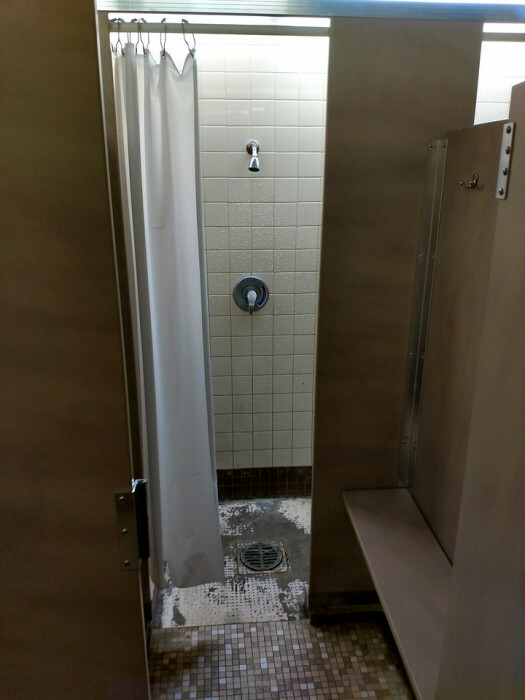 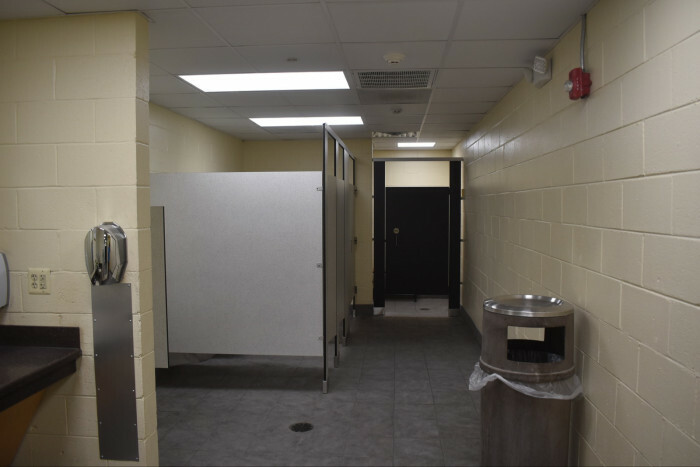 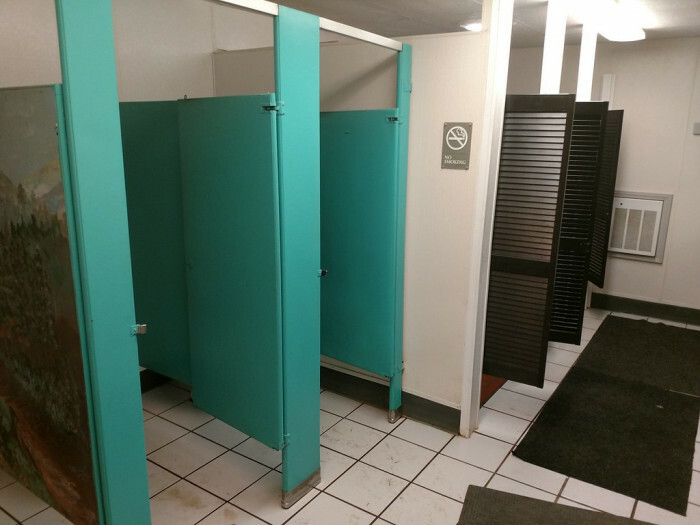 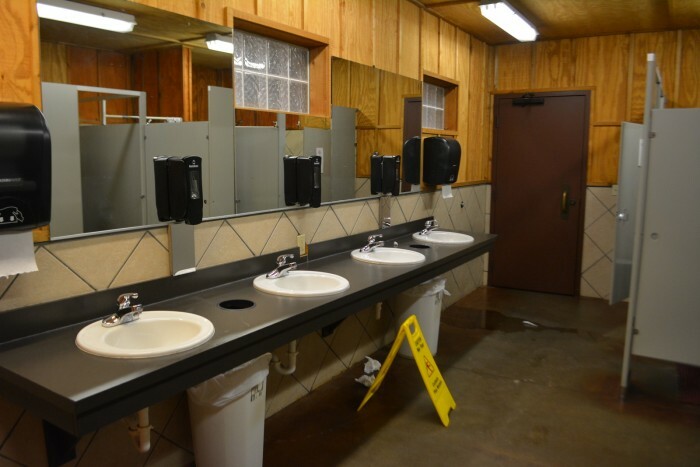 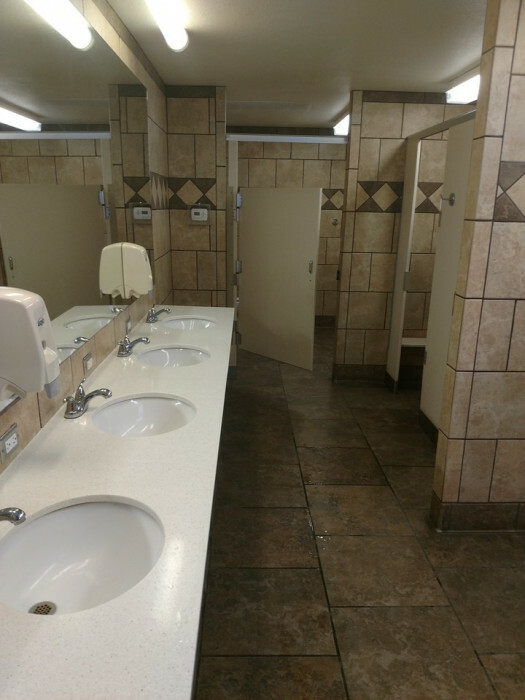 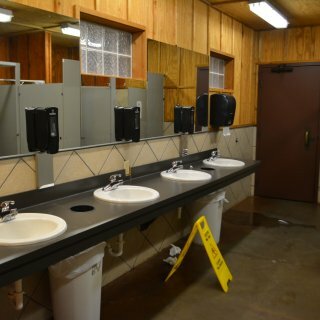 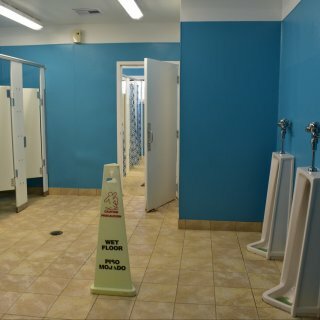 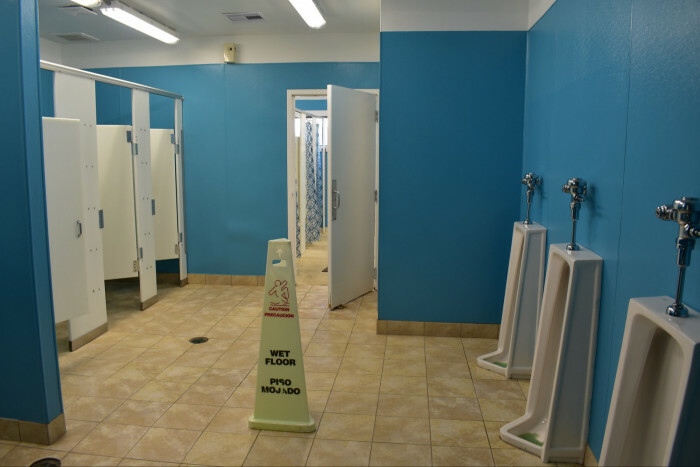 They also had a drainage issue, the floor in the stalls had a couple of inches of water that would not drain away. 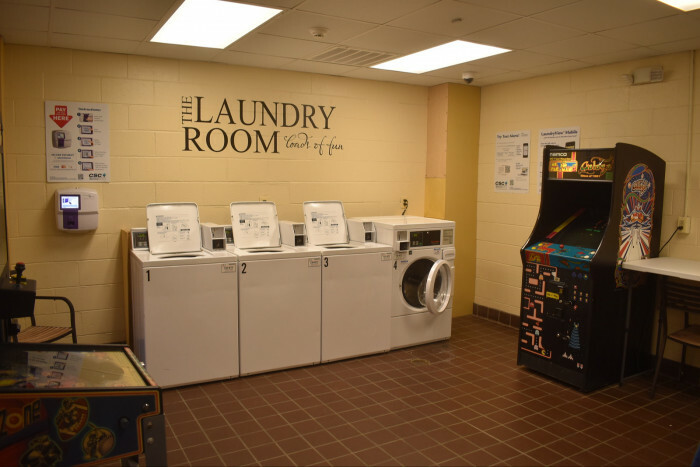 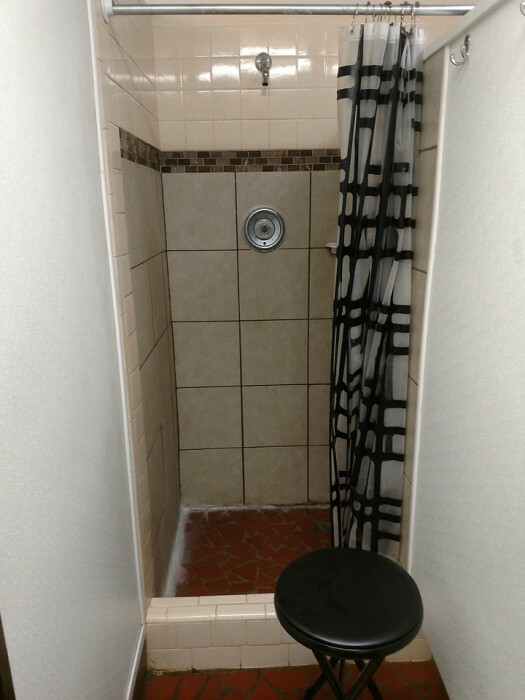 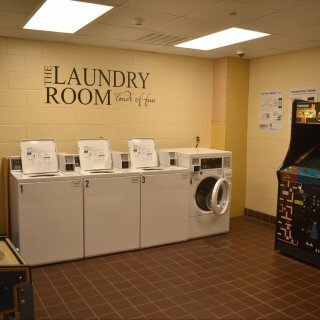 Each shower building also included a laundry. 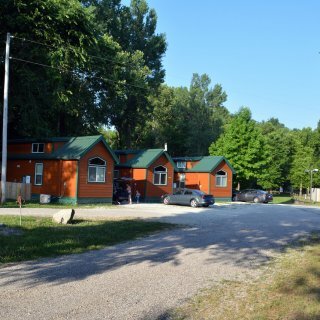 Overall we enjoyed our stay and would return if again in the area. 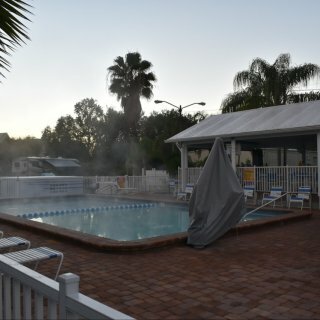 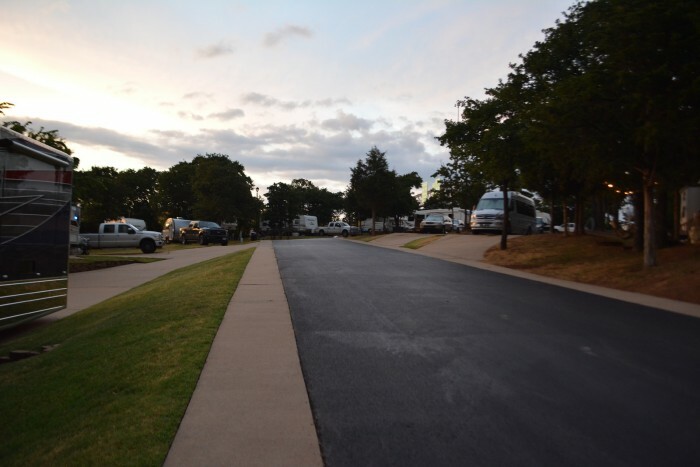 We camped at Reunion Lake RV Resort in a Travel Trailer. 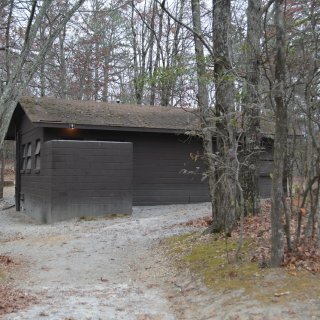 Shower house was closed for the season, a portapot was provided, but I did not use it. 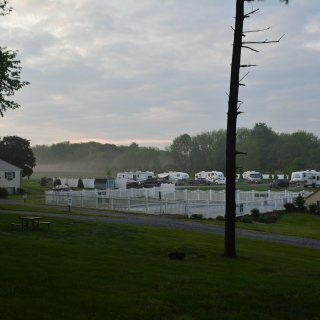 Campground was very dark but there was a good deal of road noise from Rt15, which continues all night long, but this was not an issue inside the camper. 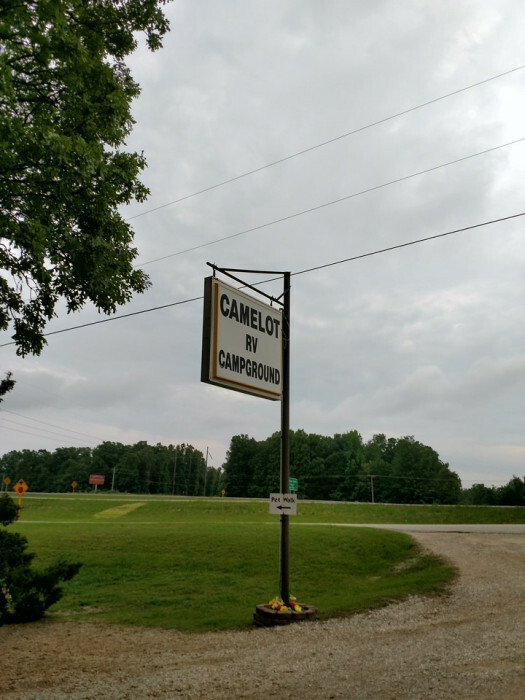 I saw no staff, and the campground was otherwise empty. 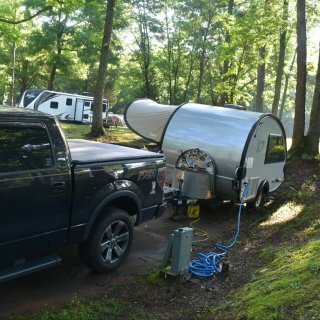 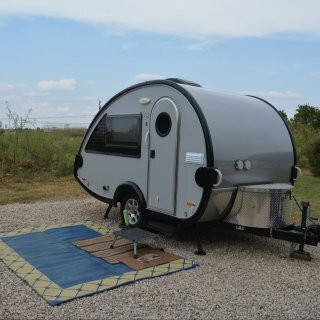 It proved to be a good place to overnight with my small travel trailer. 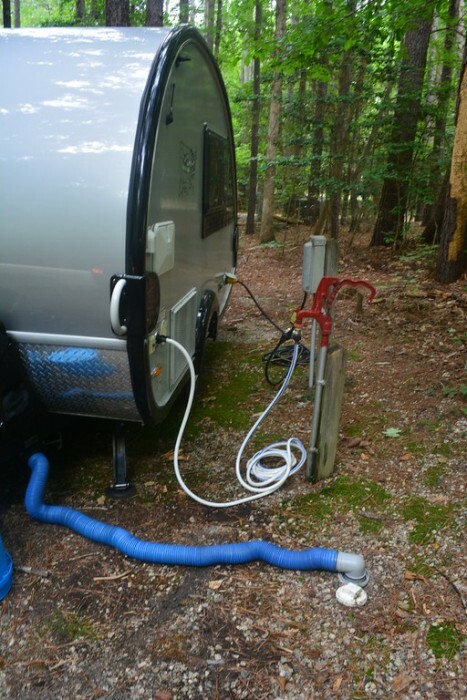 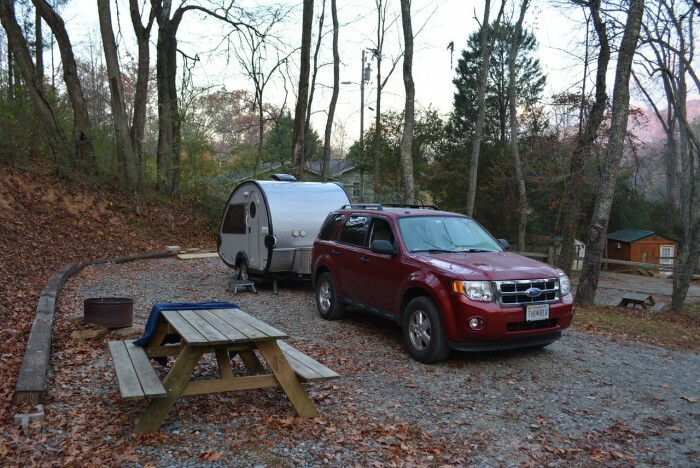 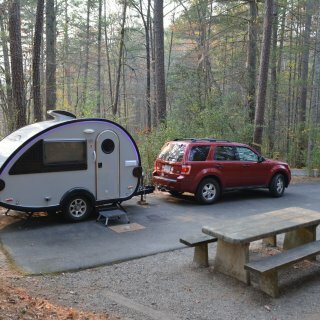 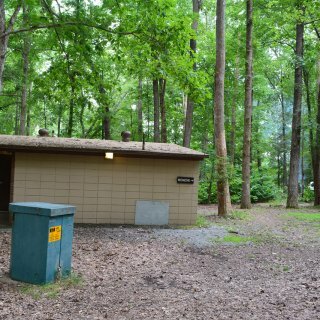 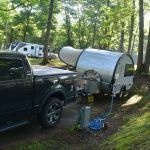 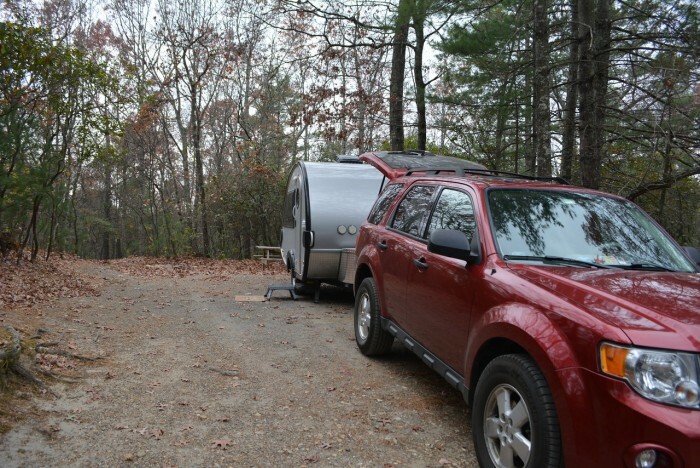 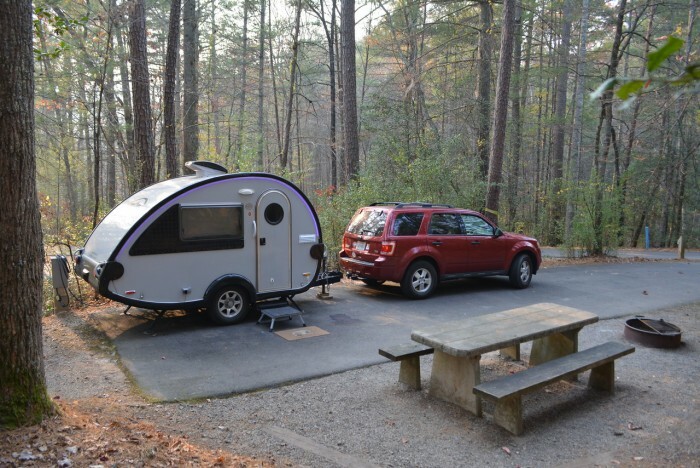 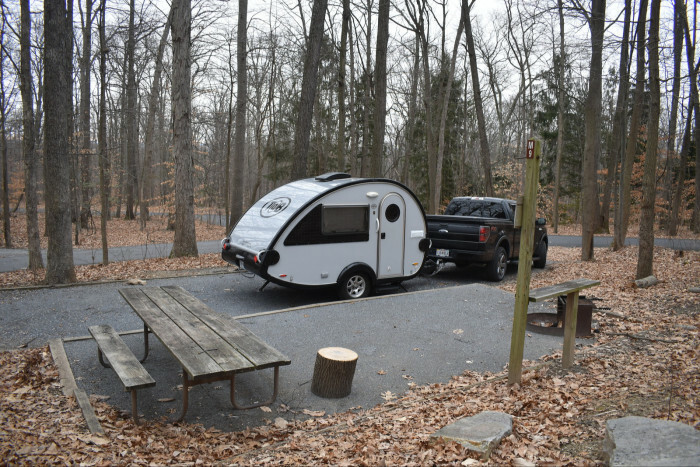 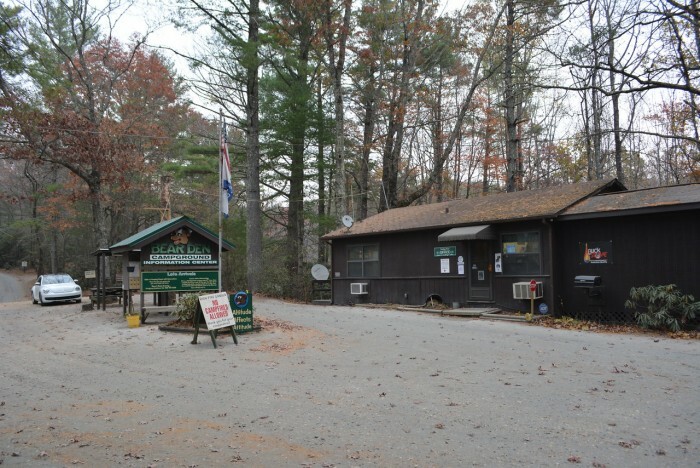 We camped at Cunningham Falls State Park - Manor Area Campground in a Travel Trailer. 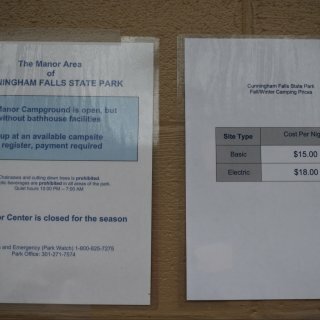 Lots of great hiking at Cunningham Falls State Park as well as neighboring Catoctin Mountain Park (NPS). 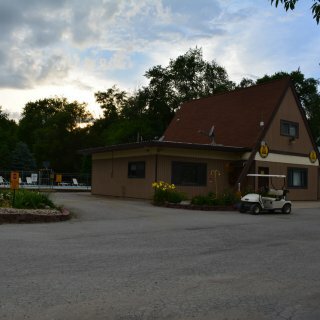 Restaurants and grocery are all very close. 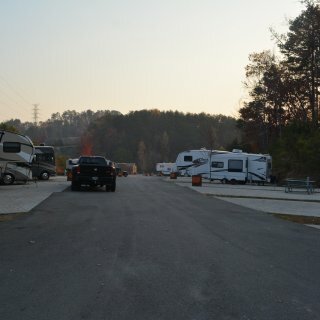 A large RV dealership is just south on 15. 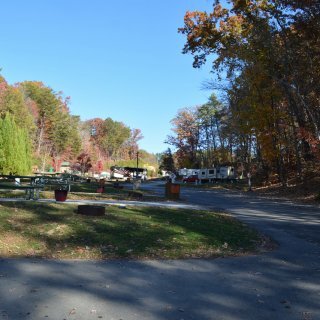 Very impressive campground for the price, $25 plus a $4 online booking fee, Lums Pond is convenient to Rt 301, DE Rt 1 and I-95, making it a great overnight stop when traveling through the area. 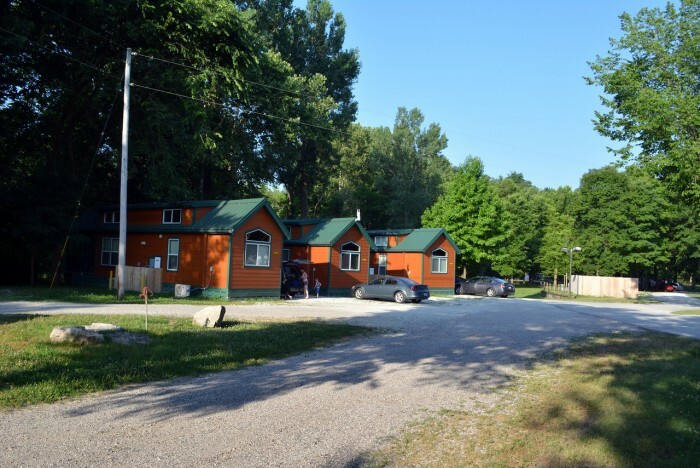 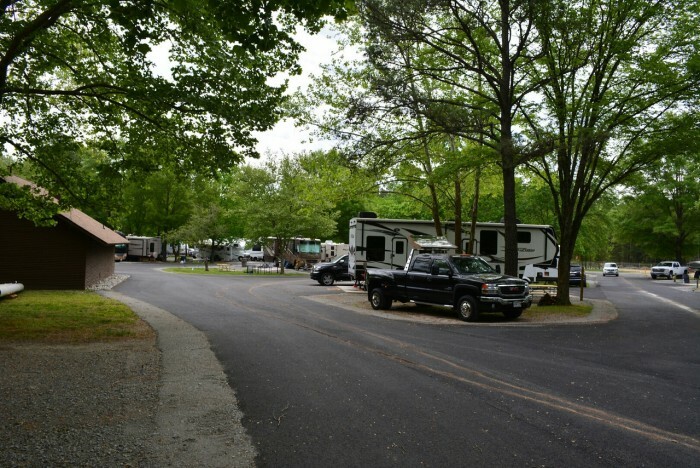 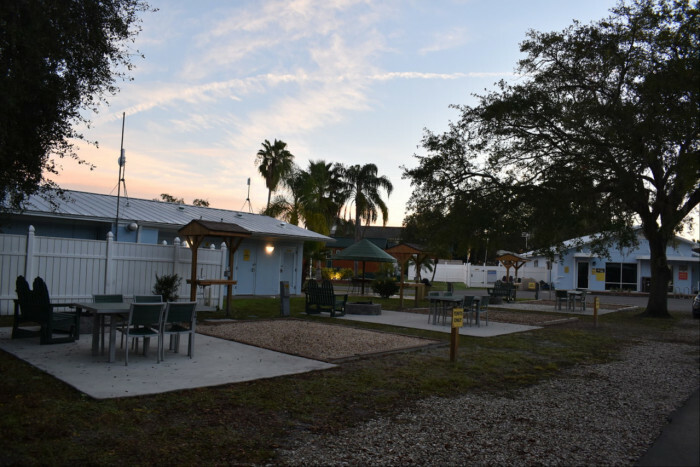 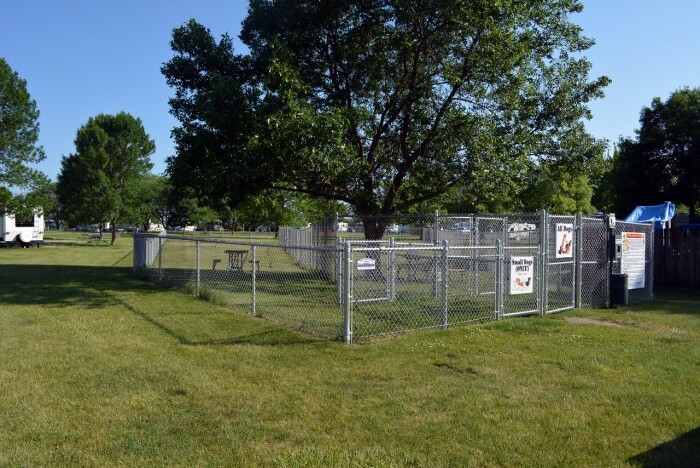 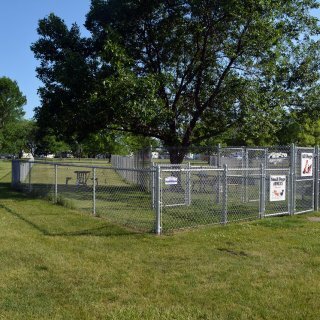 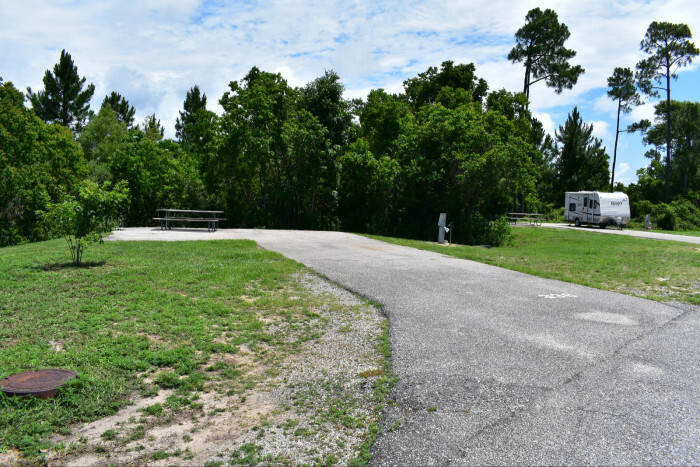 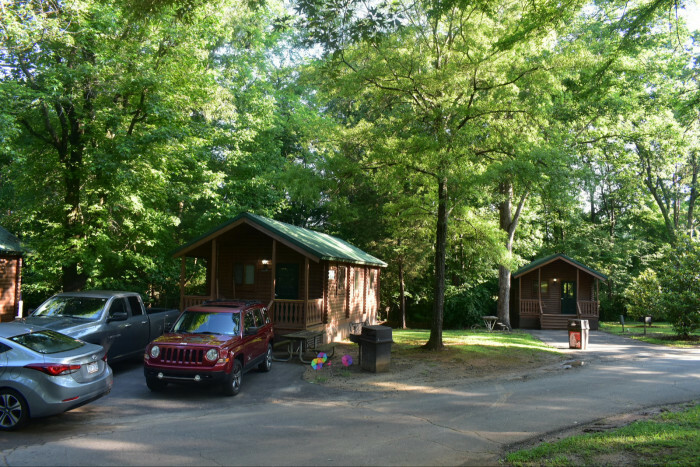 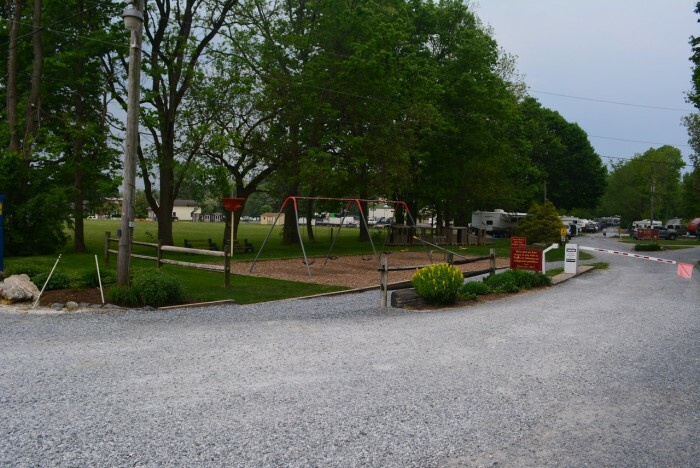 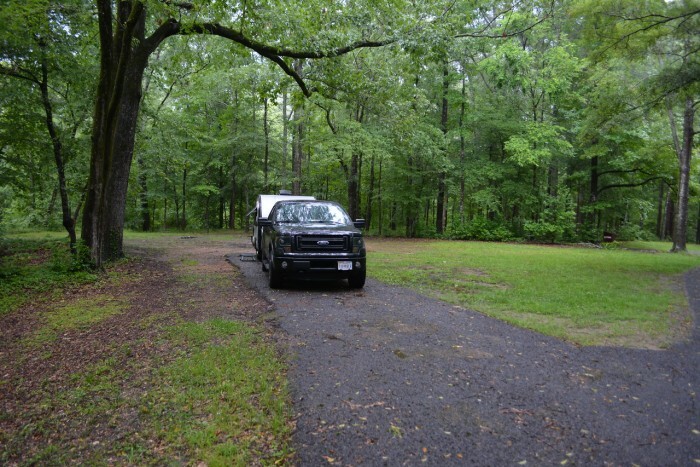 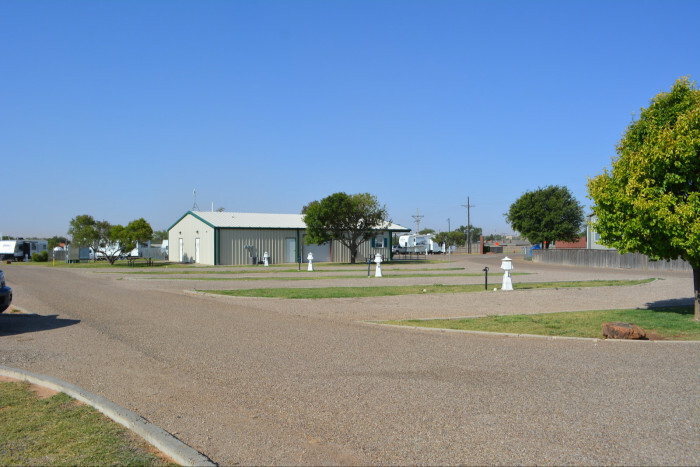 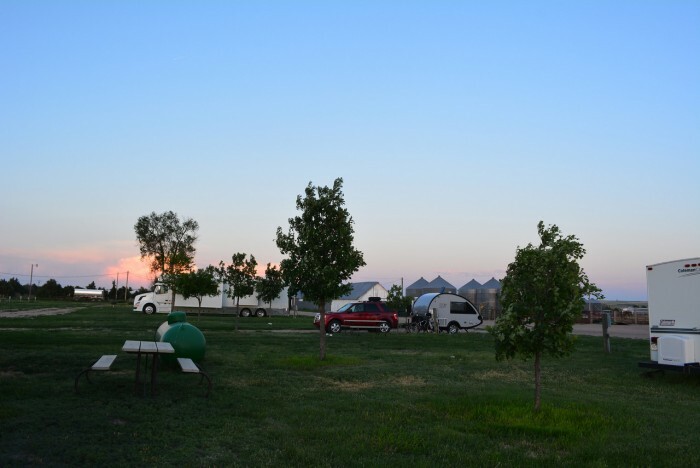 Entire campground has recently been renovated, with wide, paved and level back in sites, and lots of spacing between sites. 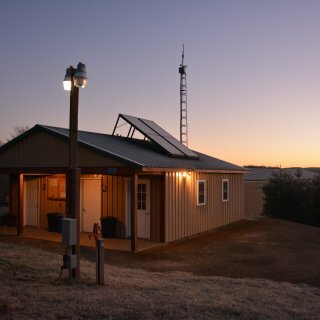 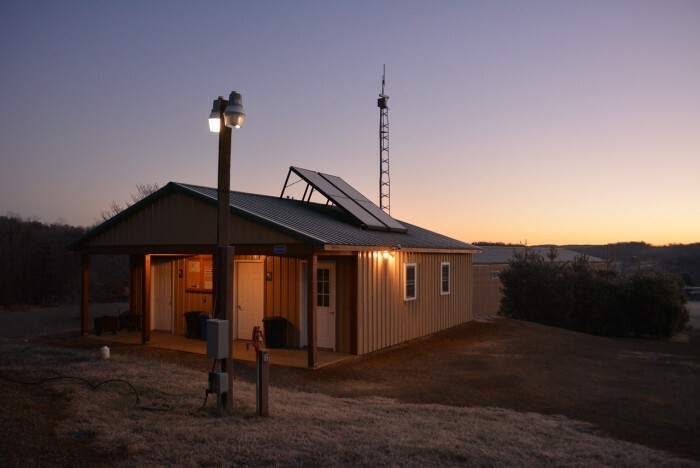 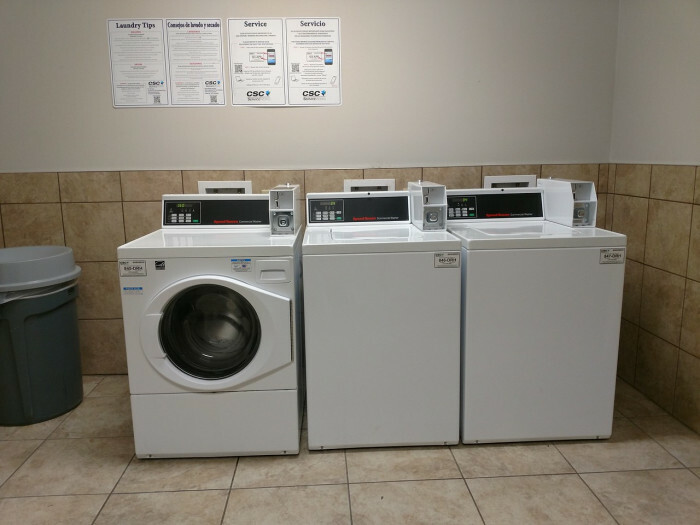 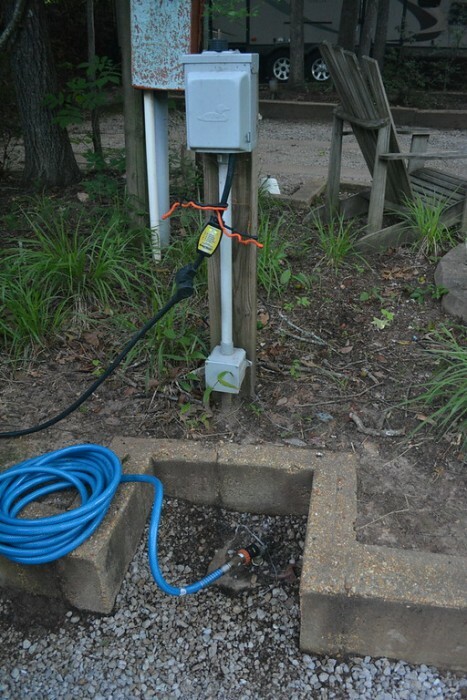 Each site has FHU, including 20, 30, and 50 Amp service. 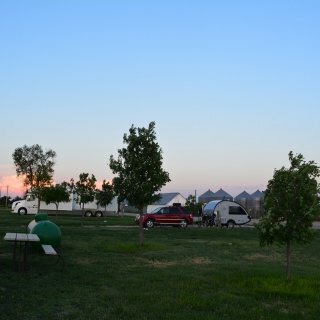 Most sites are in an open field, with little extra lighting, and very quiet at night. 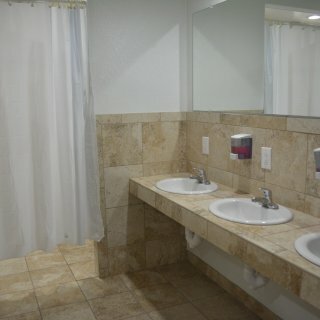 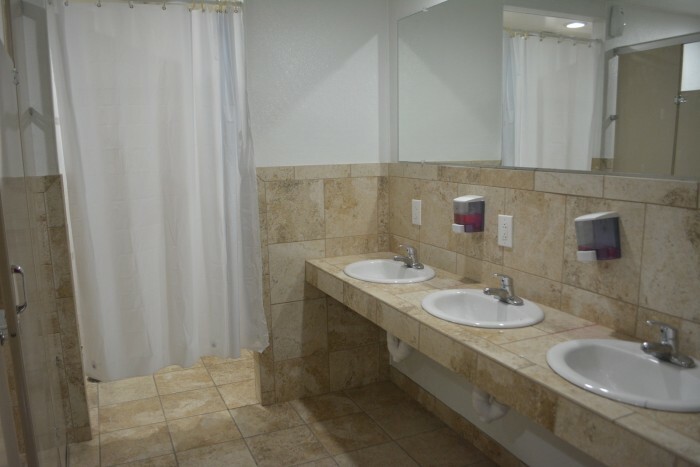 Shower house is very clean and modern, with separate shower rooms from the main bathroom. 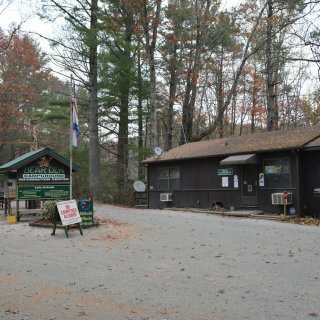 Camp hosts were friendly and helpful, never saw a ranger. 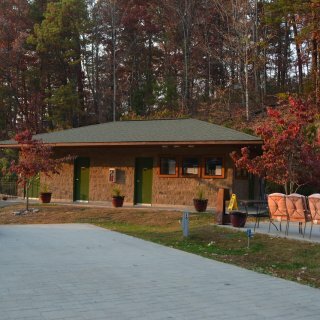 Park is open year round. 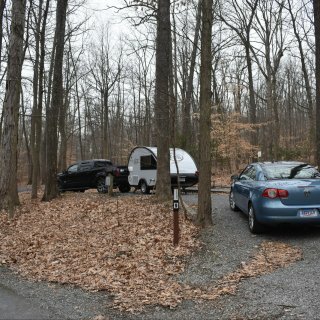 If planning a weekend stay you may want to book online, camp host commented that they have been full every single weekend since June. 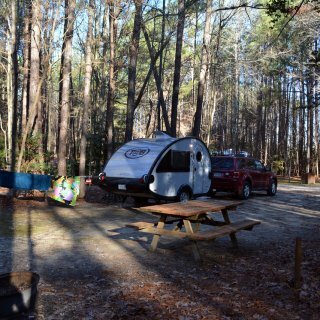 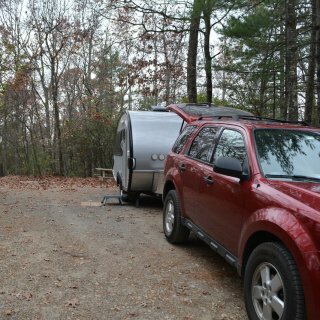 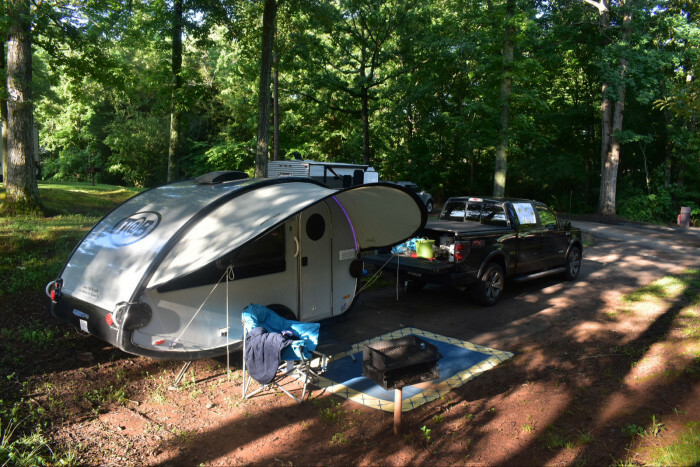 We camped at Lums Pond State Park in a Travel Trailer. 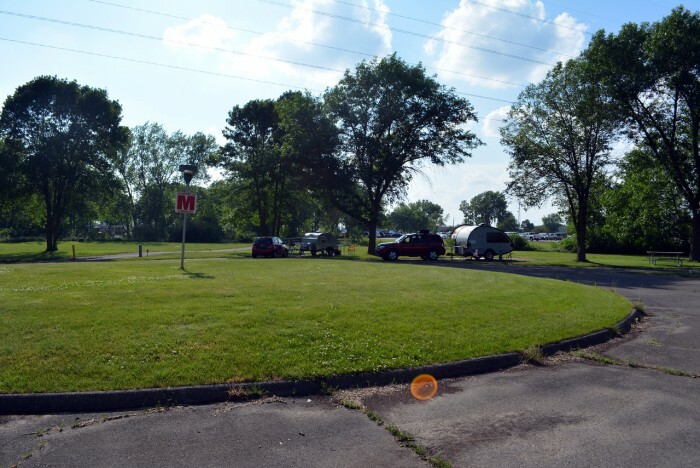 A little pricey, but the campground is right next to Dutch Wonderland, which is why we were in Lancaster for the weekend, so you cannot beat the convenience of the location. 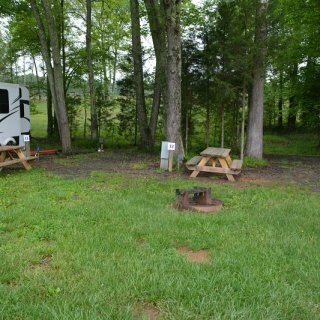 Our site was odd as it was not originally designed with RV's in mind, until last year they had a few tipis that could be rented, and this was where one of them had been. 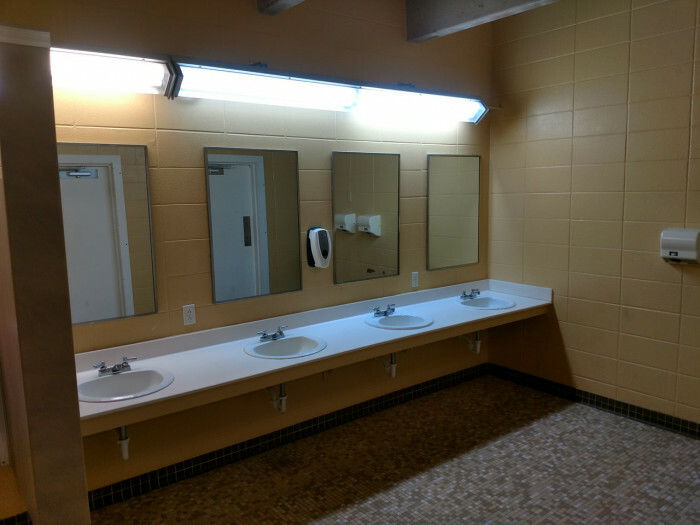 It was level, however, and everything functioned well. 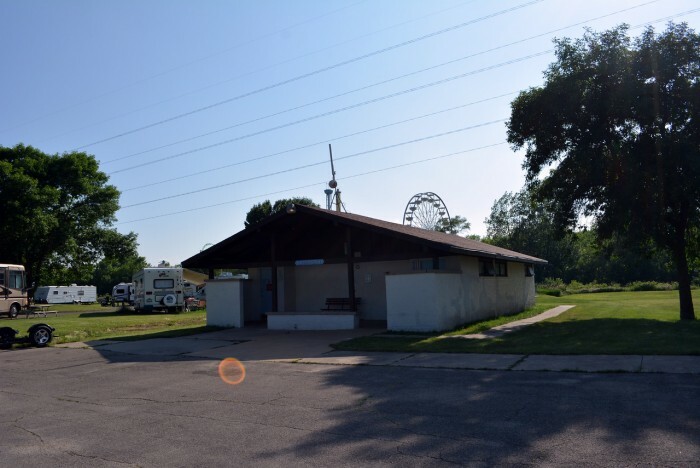 The staff was friendly, and even being next to an amusement park, once the park closed for the day things quieted down in the evening. 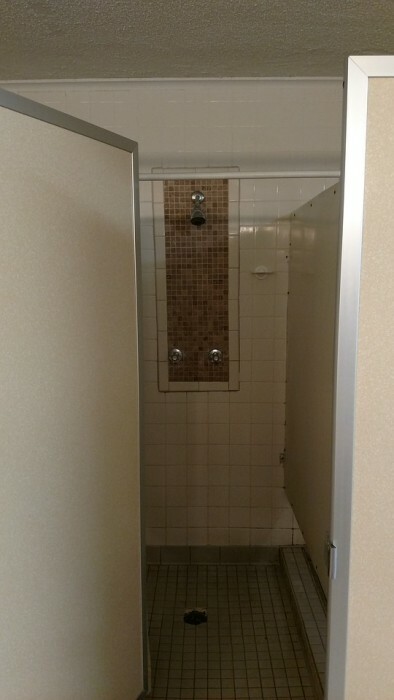 Shower house was modern and very clean. 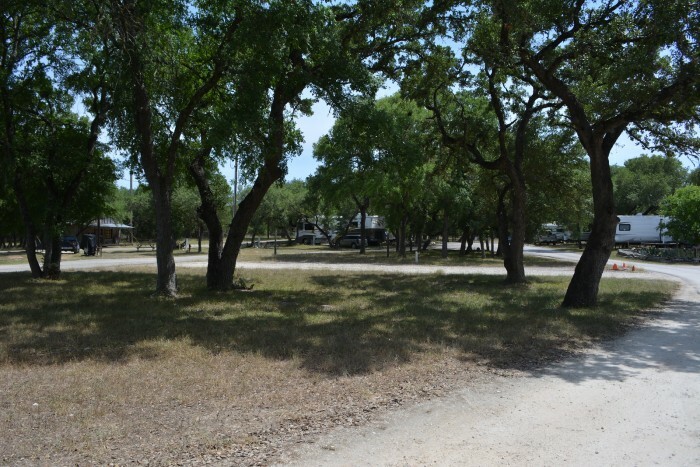 The campground itself is laid out nicely, with sites easy to find, and lots of shade to be had. 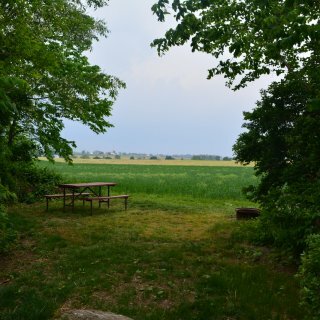 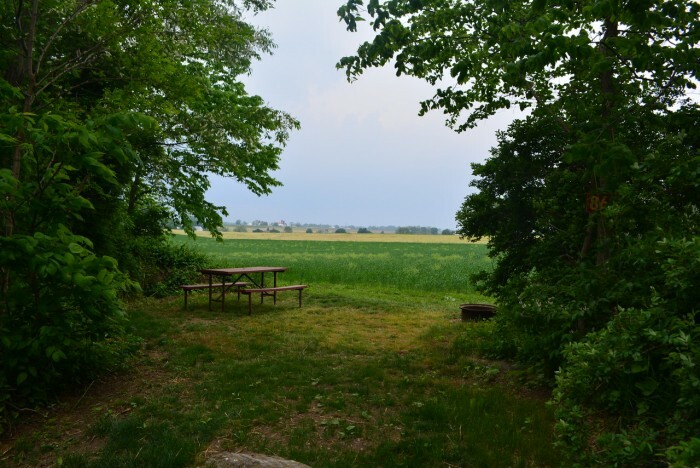 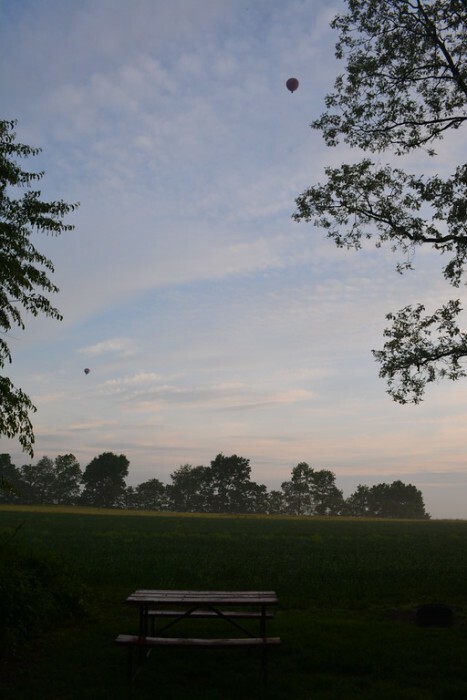 The tent sites are in the back along the stream, with a beautiful, unobstructed view of the Amish farm field beyond. 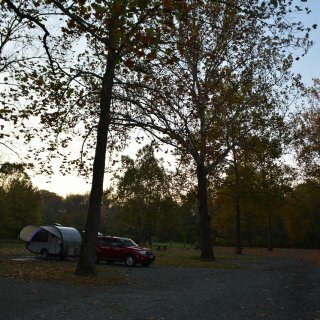 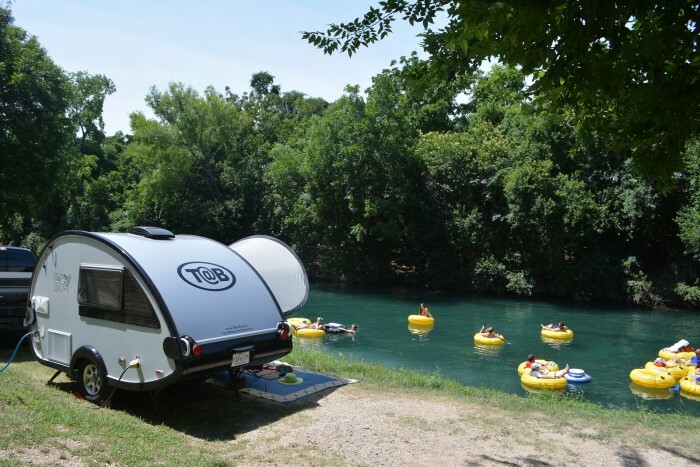 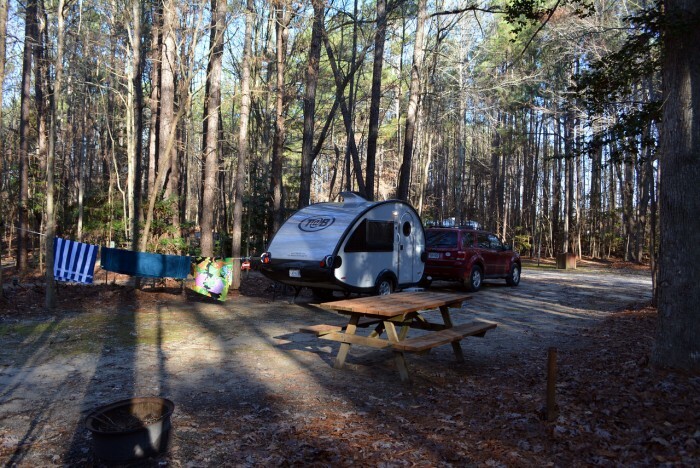 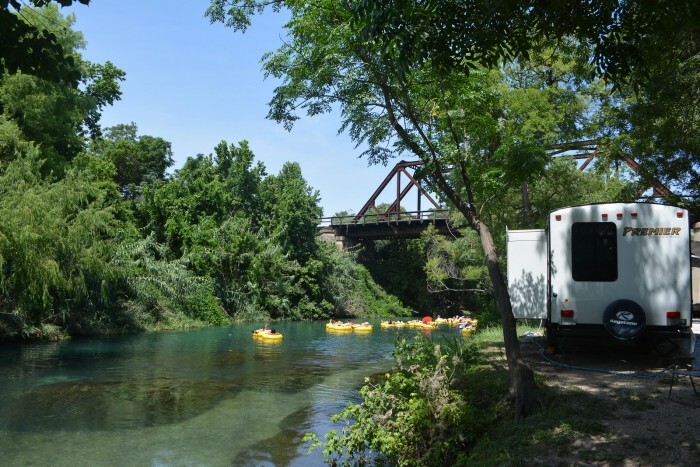 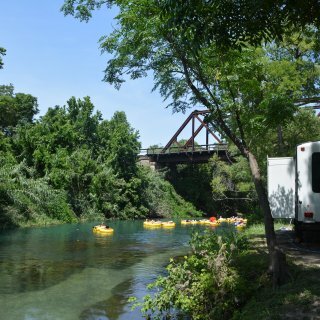 We camped at Old Mill Stream Campground in a Travel Trailer. 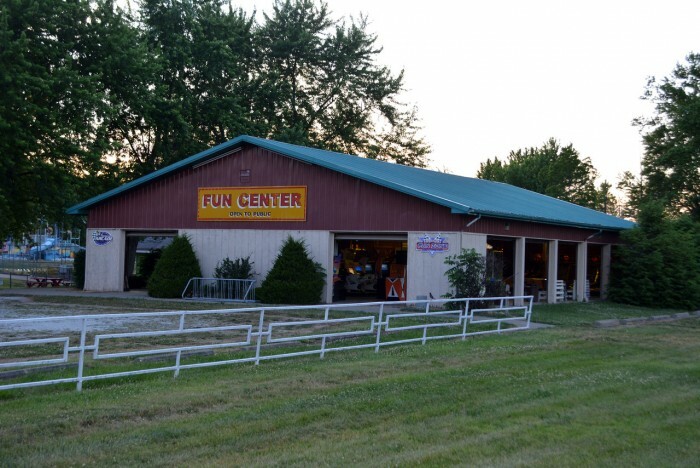 Dutch Wonderland is right next door, a great small amusement parks geared towards kids. 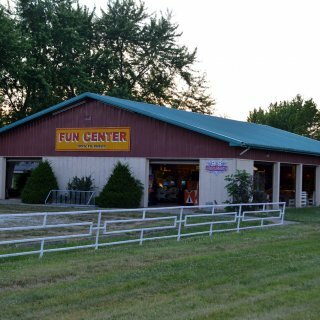 Very central to many of the Lancaster attractions.